One of the more exciting events the SAAF invites media and VIP guests to is the Air Power Capability demonstration, this year the event was in conjunction with the Africa Aerospace and Defence show which is currently been held at Airforce Base Waterkloof in Pretoria.The purpose of the exercise is to invigorate the SAAF’s combat readiness and its role in peace support operations. Media and guests were once again flown up to Polokwane Gateway International Airport before been transported by bus to the Roodewal Bombing Range around 40 minutes drive from Polokwane.On a arrival SAAF Fire and Rescue Services had already been fighting ranging fires in the area as well as some Oryx helicopters who were working hard with the assist of the choppers capabilities of using a “babi’ bucket to put the fires out. 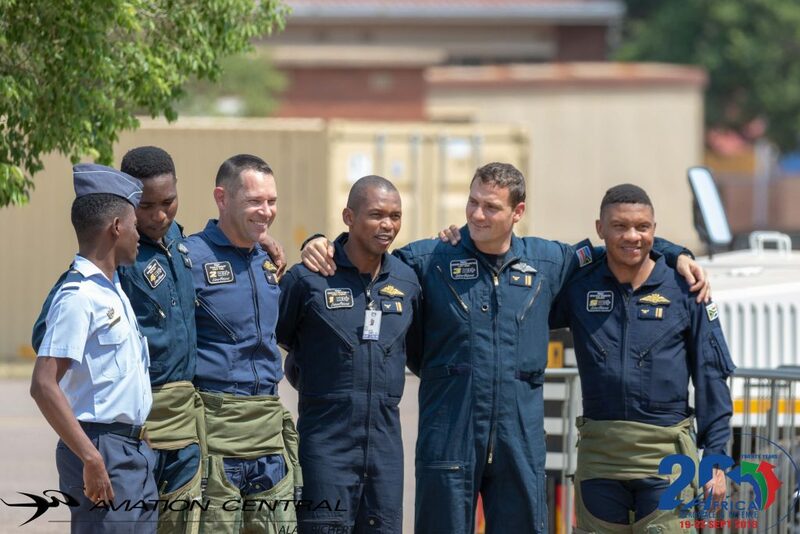 A safety briefing was followed by the Chief of the South African Airforce General Fabian Zimpande “Zakes” Msimang and other military personnel,the demo started off with pathfinders who excited an Oryx Helicopter and landed in the simulated battle zone.A recce run was then carried out by a Gripen and Hawk,the Gripen continued to orbit before exciting the battle area.Two Oryx Helicopters then came in for a water drop again assisted with their bambi bucket. The sound of thunder was then echoing the skies of Roodewal with a mock dog fight between a enemy hawk and two friendly Gripens. 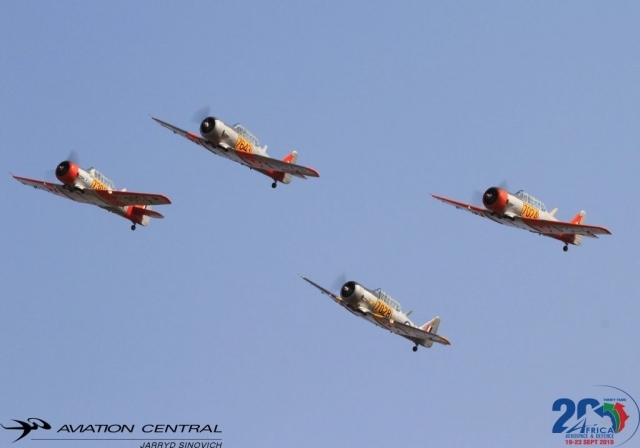 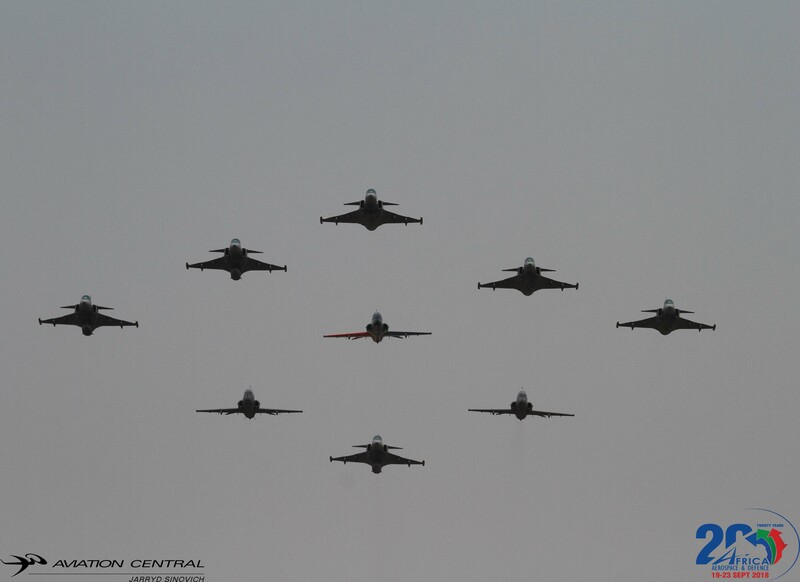 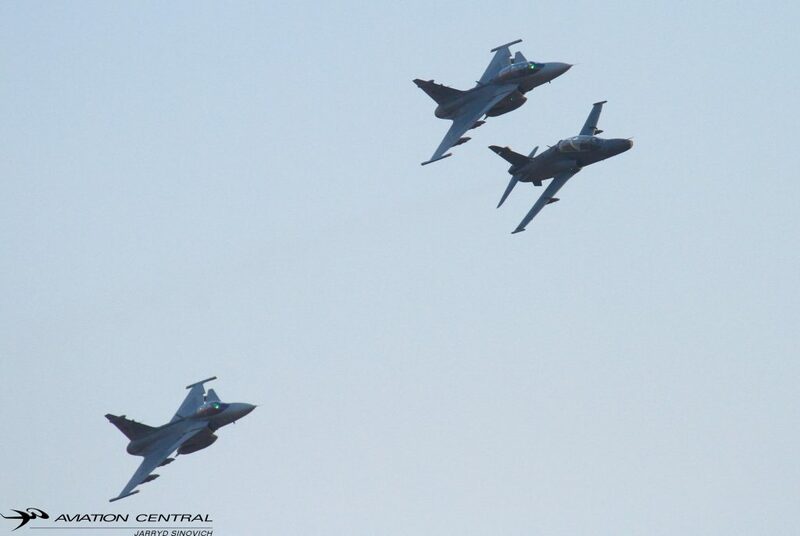 The fighters then joined up for a friendly flypast. 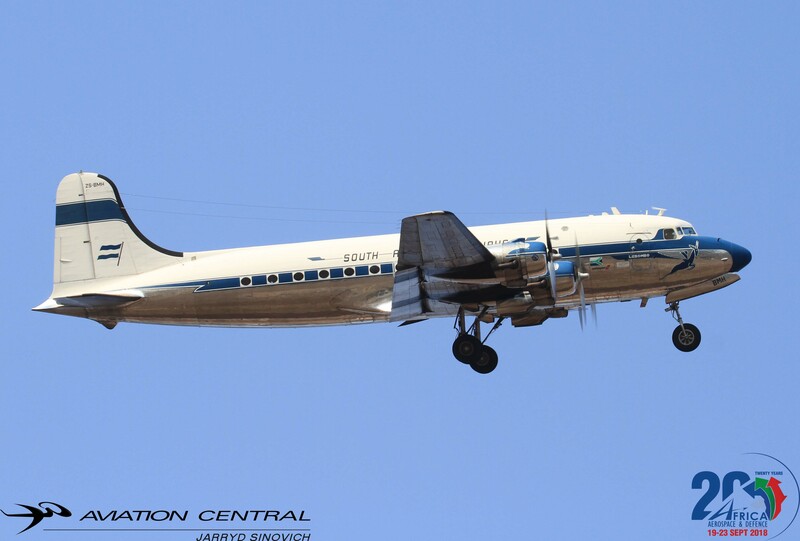 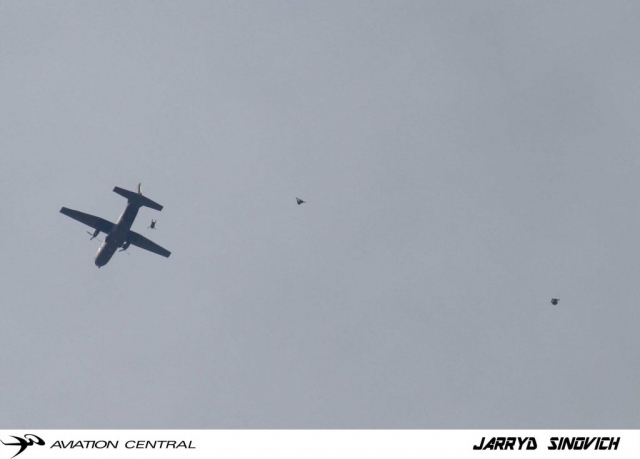 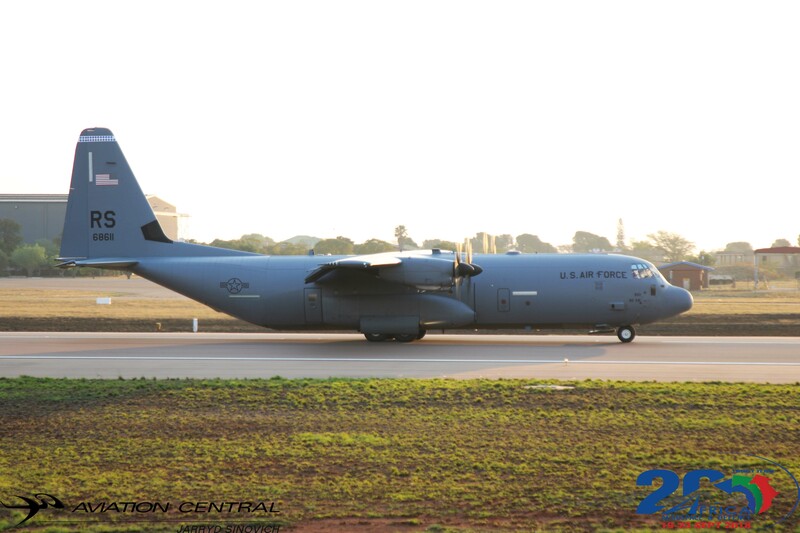 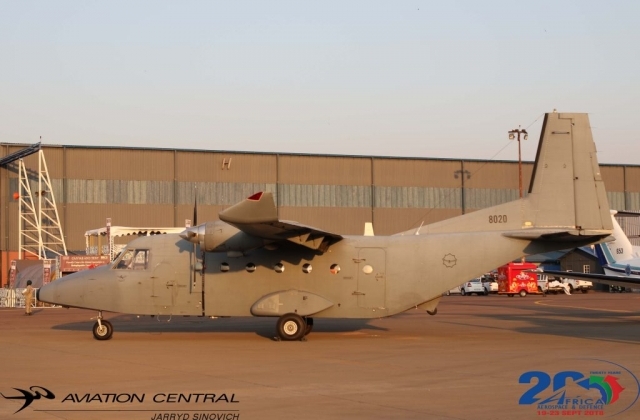 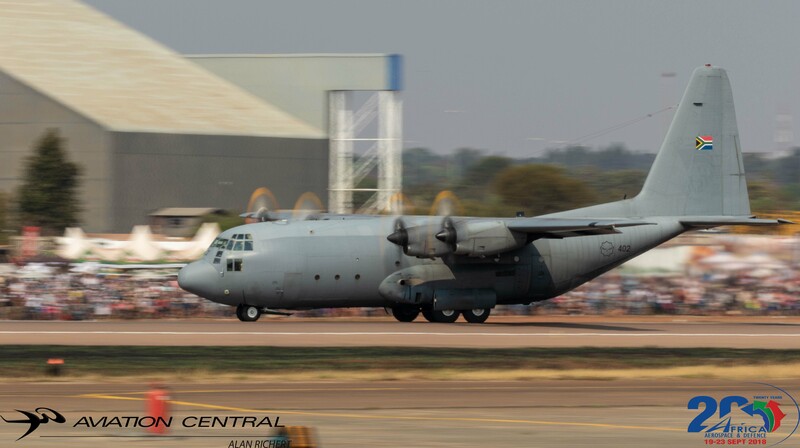 A single C130BZ and a CASA 212 performed a cargo drop before the return of the helicopters followed by a single A109LUH and a BK117 landed in the battle zone bringing in the first of the troops. At the same time two 16 Squadron Rooivalks provided top cover.It was unfortunately not long after that a Oryx had a hard landing resulting to the end of the exercise.The crew and troops were lucky to have light injuries from the landing. 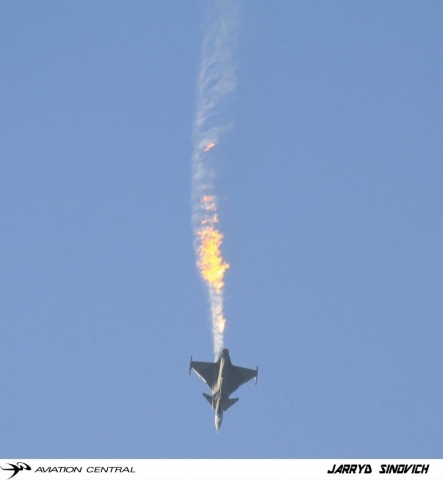 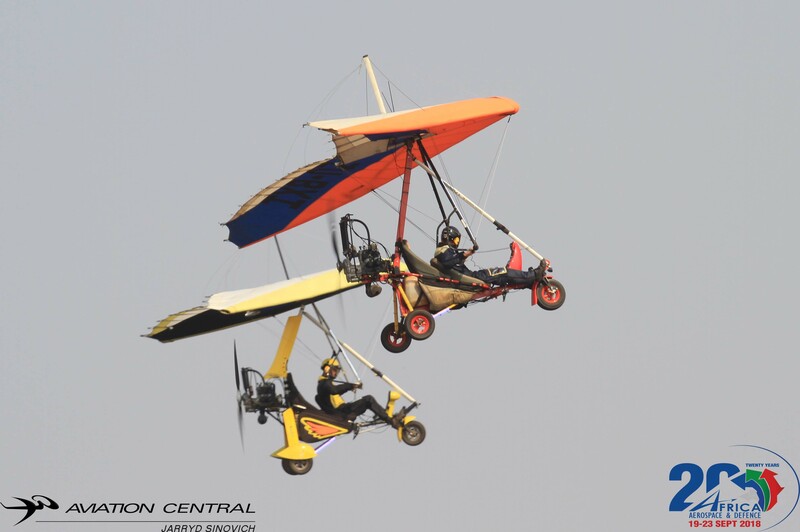 “The crash landing happened in front of invited guests, foreign diplomats and the media. 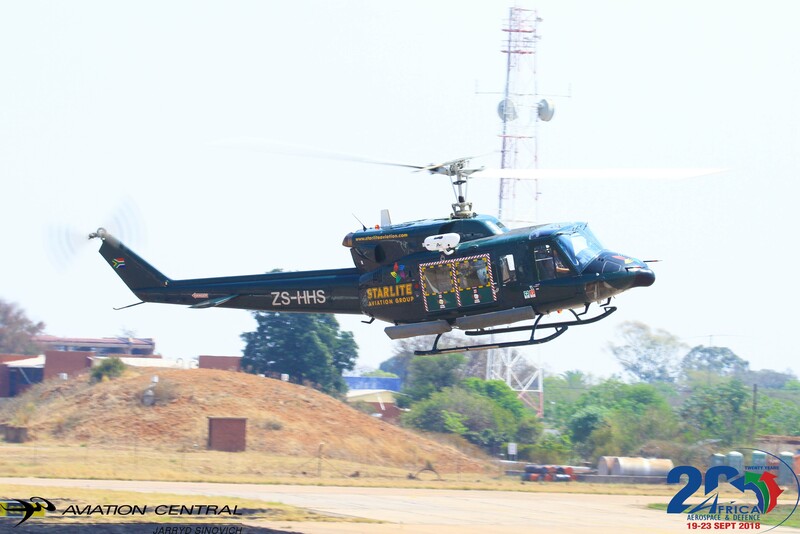 As the aircraft hit the ground part of the tail rotor and wheel collapsed. 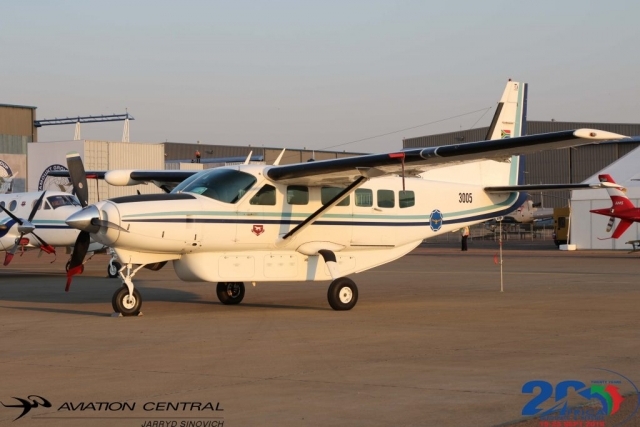 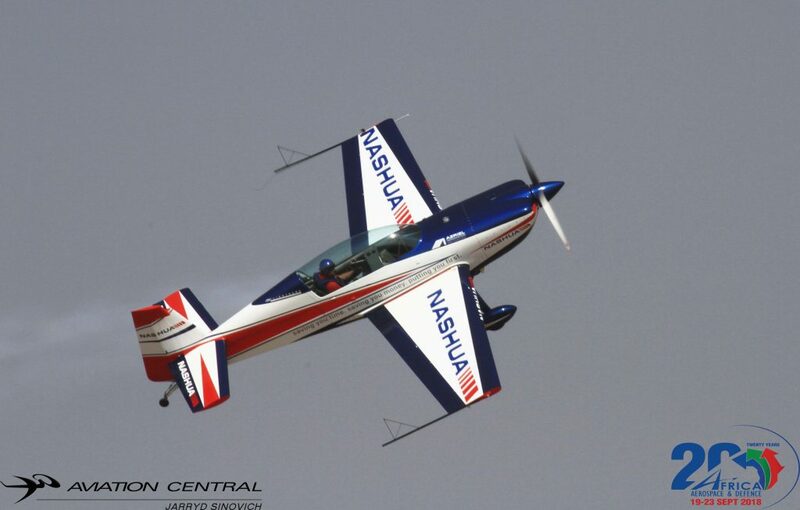 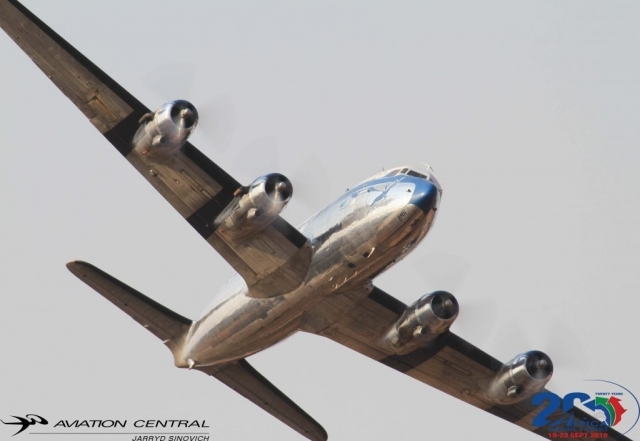 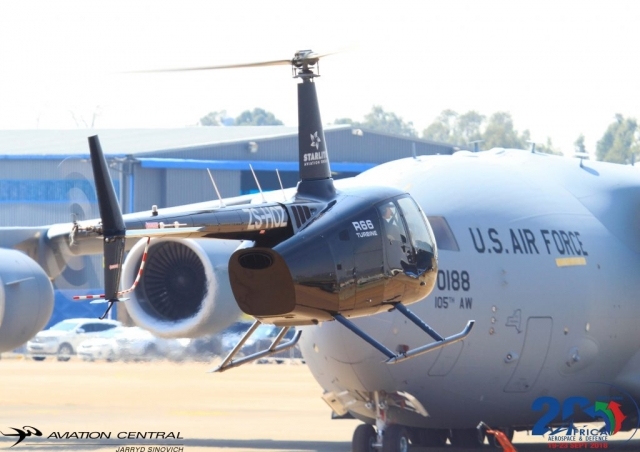 When the helicopter came to a stop quick thinking by the crew saw the engines cut,” he said. 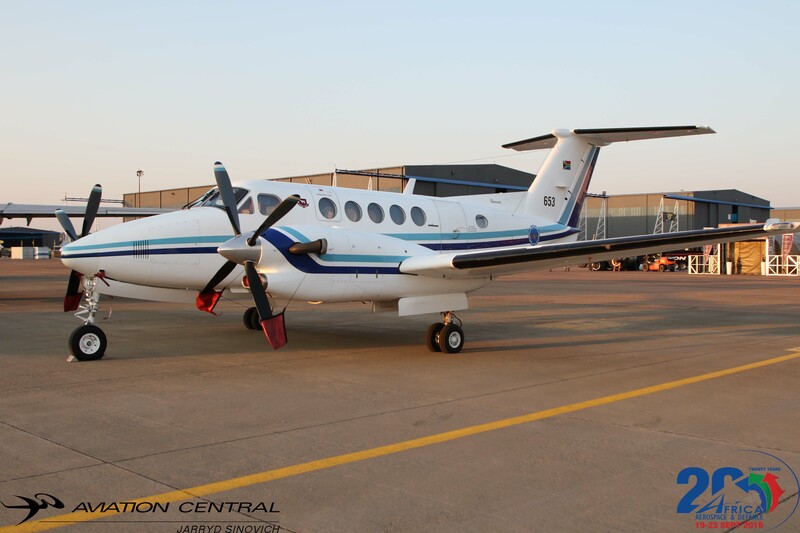 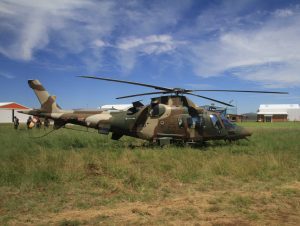 Colonel Eugene Motati of SAAF Corporate Communication said: “The unfortunate incident occurred and as you all know details are not clear. We can confirm the pilot was Lieutenant Colonel King, we are thankful there were no fatalities or major injuries, just a minor ankle injury to one person. 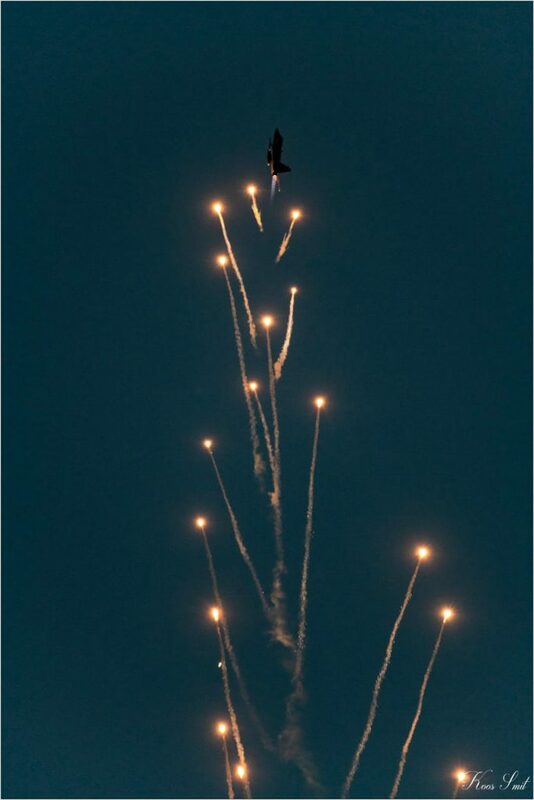 You witnessed this occurrence during the trooping manoeuvre, at the moment we do not suspect mechanical failure and we don’t want to speculate further. 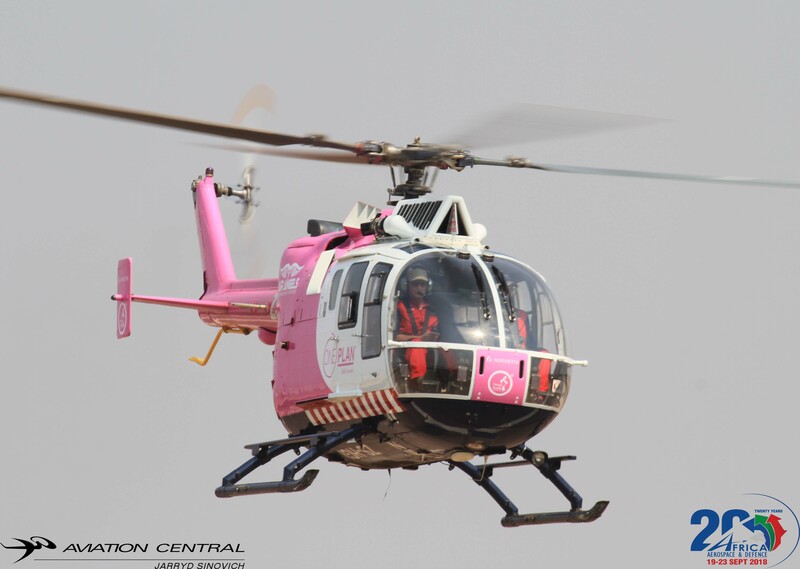 We hope the board of enquiry will give more details and the cause of the accident. 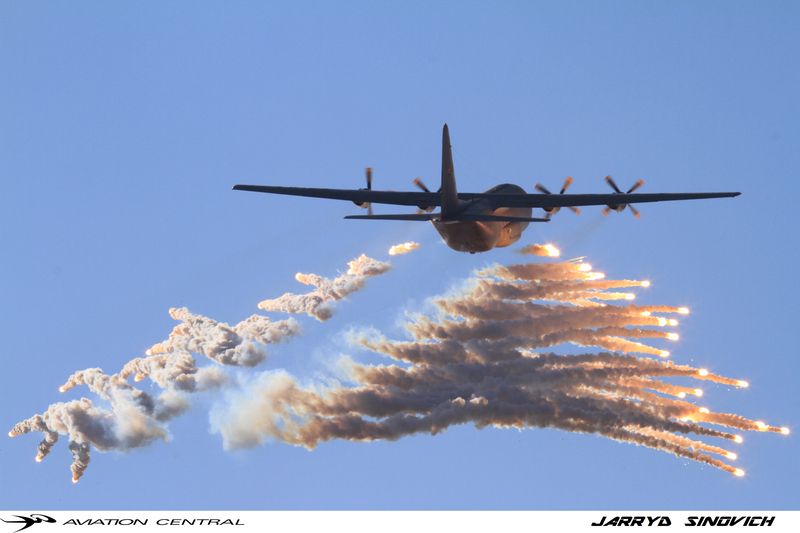 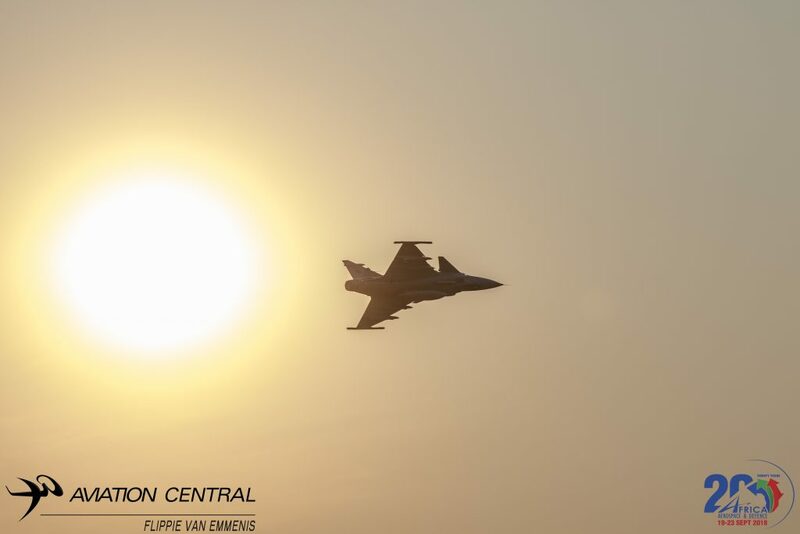 The event ended by a c130BZ dropping flares and a single Gripen passing overhead the guests going into a vertical at the same time dropping flares.A quick supper and we were off back to Polokwane and a 40 minutes flight back to Waterkloof. 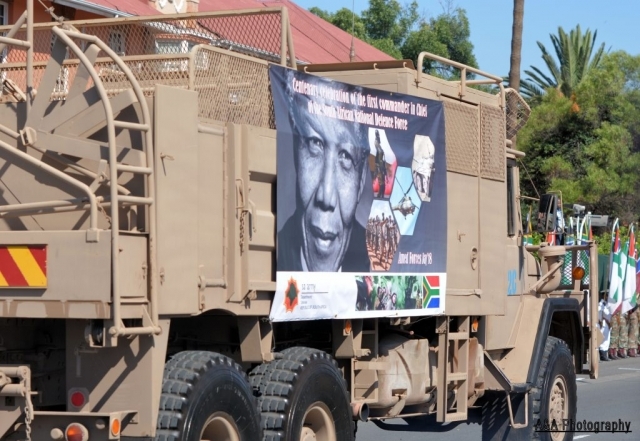 With the build up to the Armed forces day parade being held in Kimberley, the following day Wednesday the 21 February, much of the public have been getting up close and personal with both SANDF members and assets that have been put on showcase to the community who haven’t had the chance to interact with these forms of assets in this particular area with the major presence of SANDF. On Sunday the 18th February, members of the public were able to attend the De Brug weapons demo, at the De brug weapons range outside of Bloemfontein. 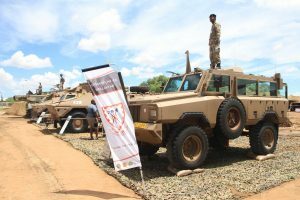 This also had a major impact on the public to witness live ammunition being fired in front of their faces from armored vehicles,ati-aircraft Guns and aerial support just to name a few. 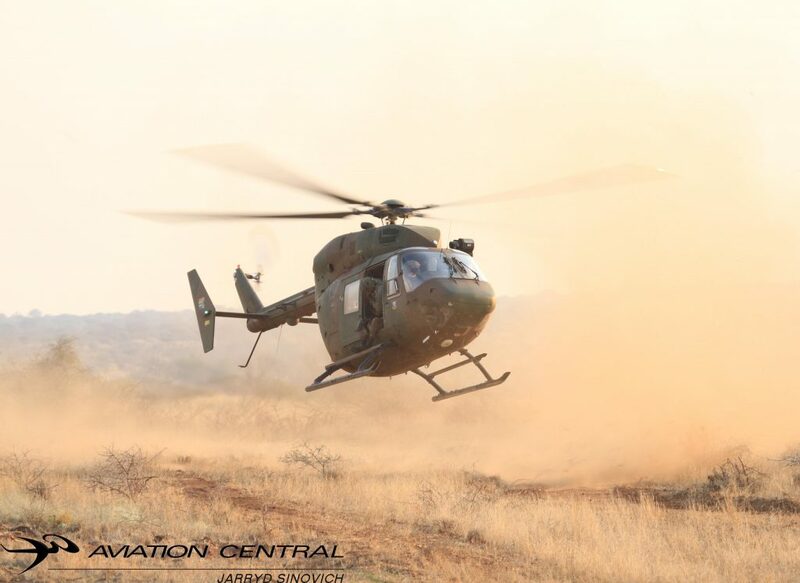 On Tuesday morning 21 February ,Aviation Central had the opportunity to be flown down from Air force Base Waterkloof in Pretoria to AFB Bloemspruit situated at the Bram Fisher International Airport in the Free state town of Bloemfontein.Air force base (AFB) Bloemspruit is home to 87 Helicopter Flying school, operating the Denel Oryx Helicopter, the Agusta A109LUH and the Bk117 for training and operational duties in the South African Air force(SAAF). 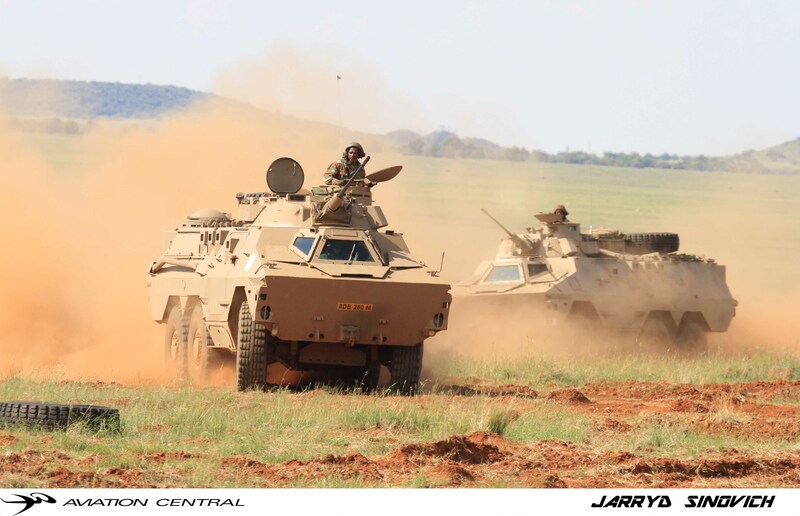 We were then allocated to buses that would be taking us out to the De brug weapons range a few kilometers outside of the City of Bloemfontein. 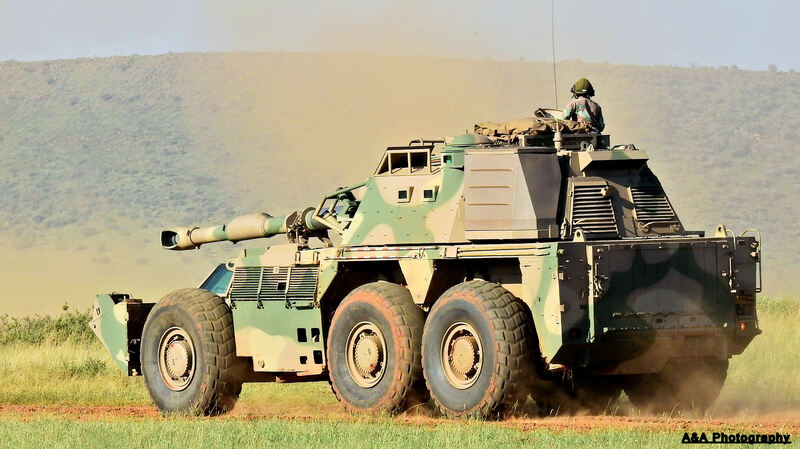 With the advantage the SANDF had the Military Police and other security squadrons escorting the buses,which onboard was members of the various media houses and Invited guests ,who got to the weapons range in no time. 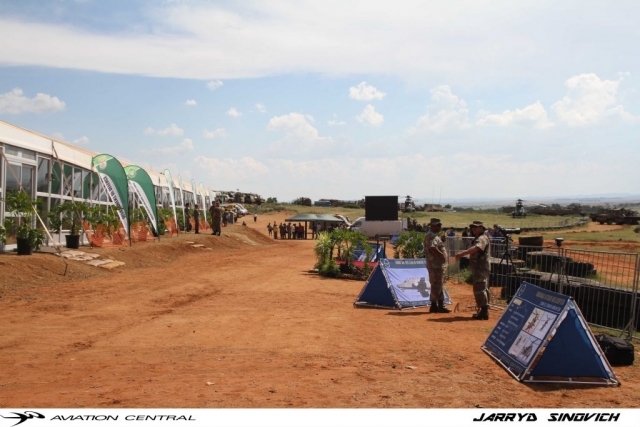 At this point this have many of the media who haven’t been to De Brug Weapons Range to explore the ‘Koppies’ behind the marquee that was specially put up to provide shade and refreshments. This is also showed how big the range was compare to other bombing ranges that Aviation Central has visited in previous years.What we had been hearing and seeing on Social media from the demo a few days before we knew we were in for a treat that not many people can say they have ever witnessed in their lifetime. 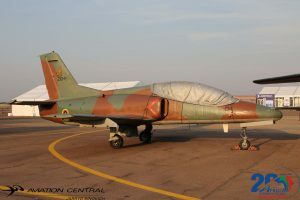 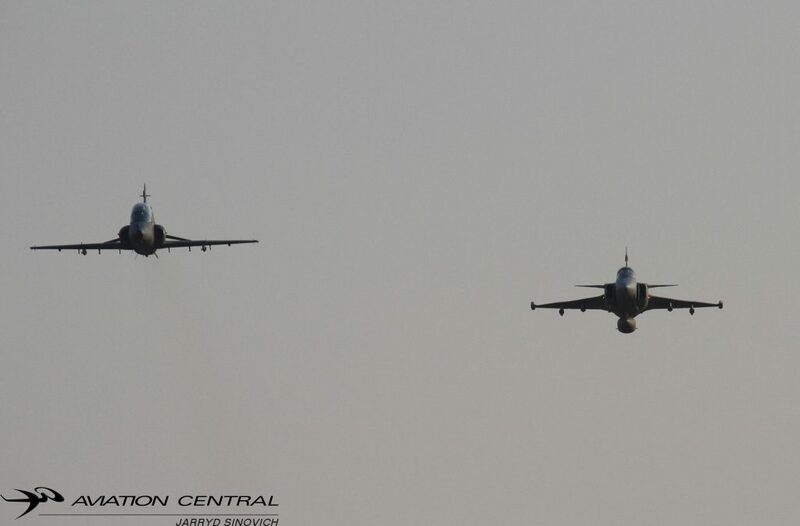 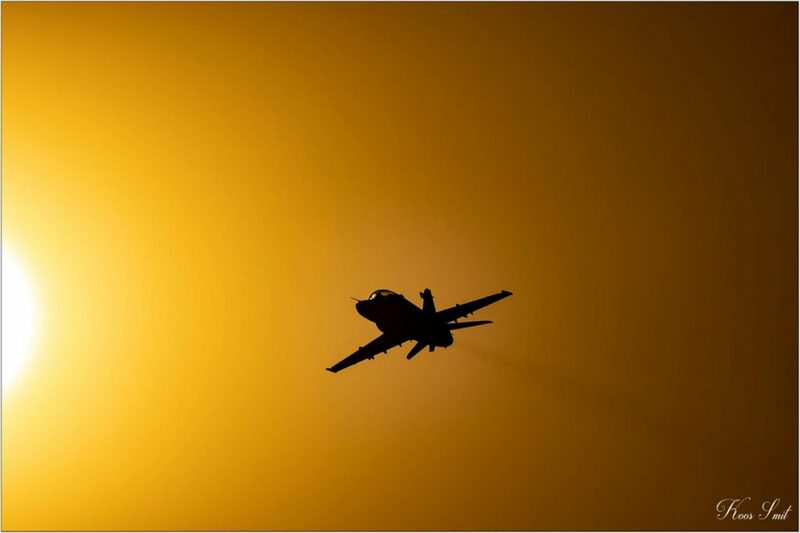 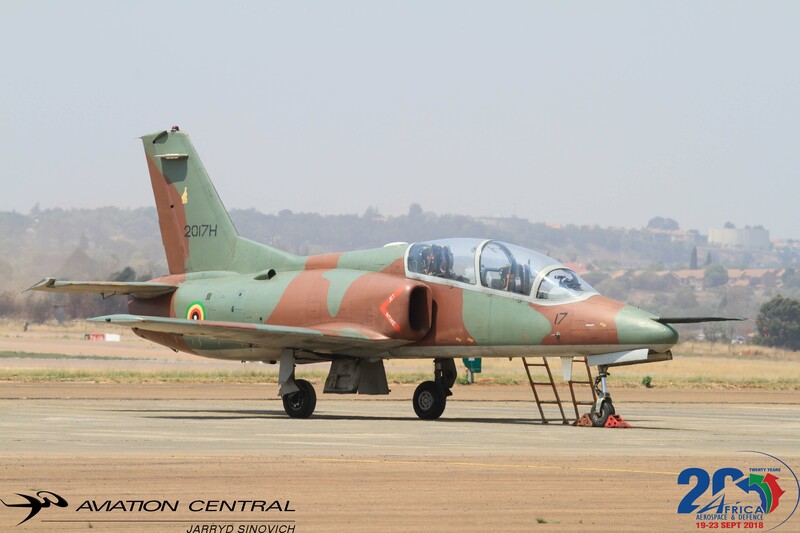 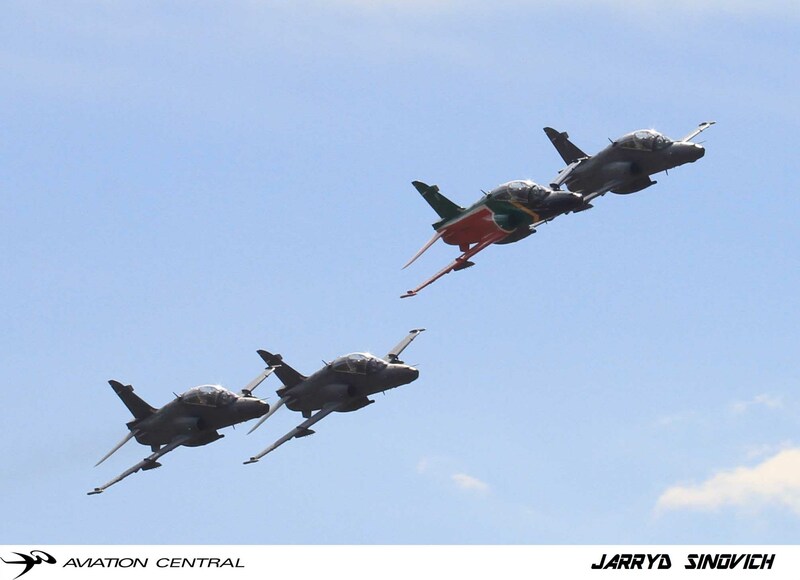 The days proceedings started with a drop of pathfinders from a 44 Squadron Casa 212,the jet action started immediately with a 85 Combat Flying School Hawk Mk120 and being escorted by two 2 Squadron Gripens,both fighter assets operating out of AFB Bloemspruit. 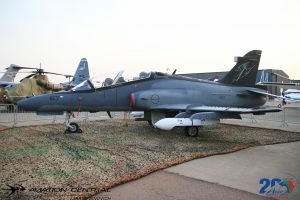 The program then continued sticking with the fighters, when the airspace in front of the crowd, got very busy with a 2v1 dogfight,using the Hawk Mk120 as the bogey(Enemy Aircraft) and two Gripens intercepting the Hawk. 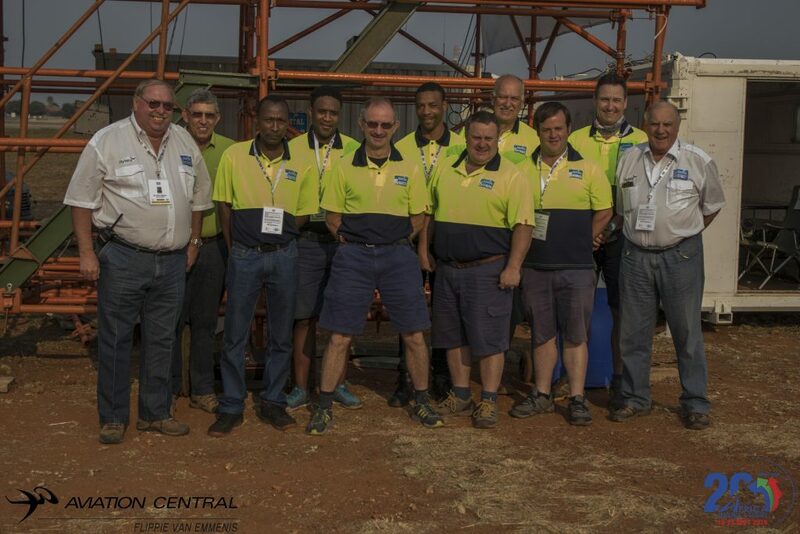 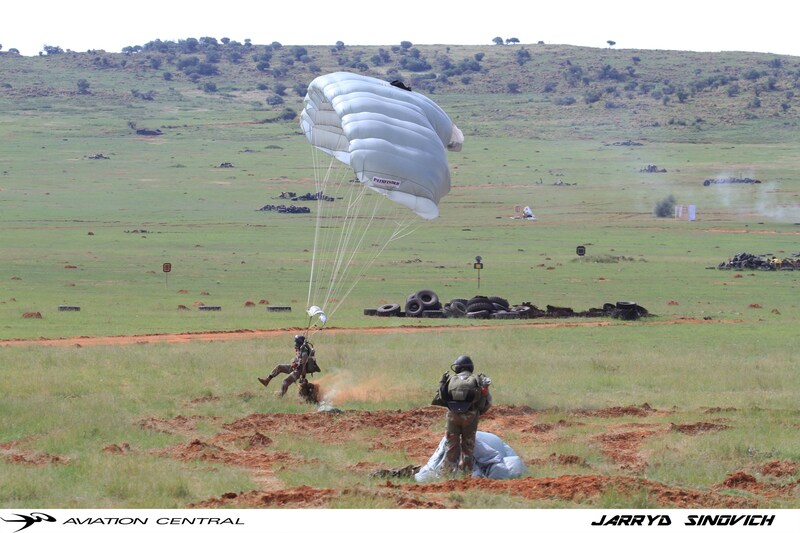 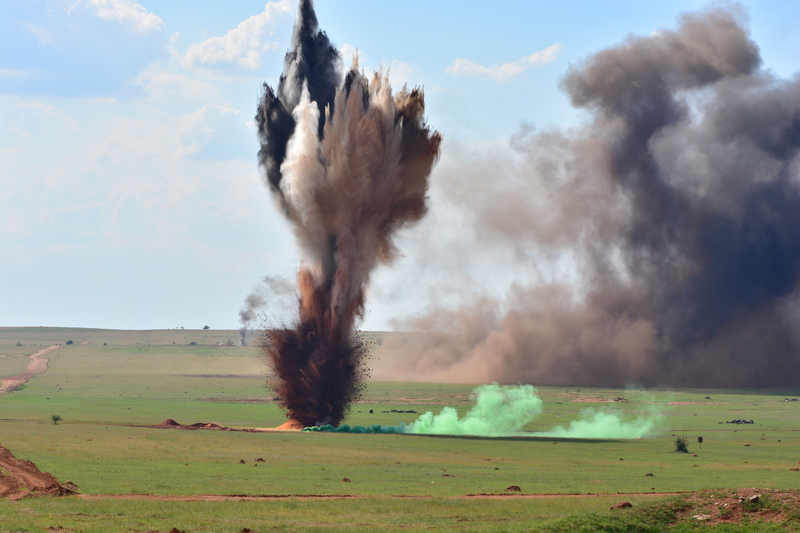 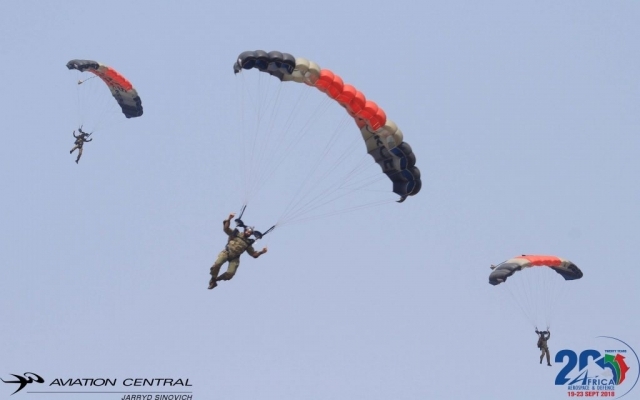 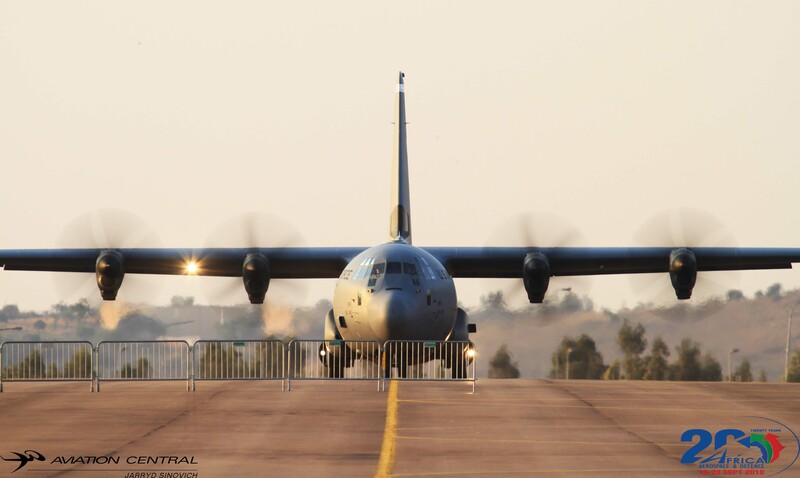 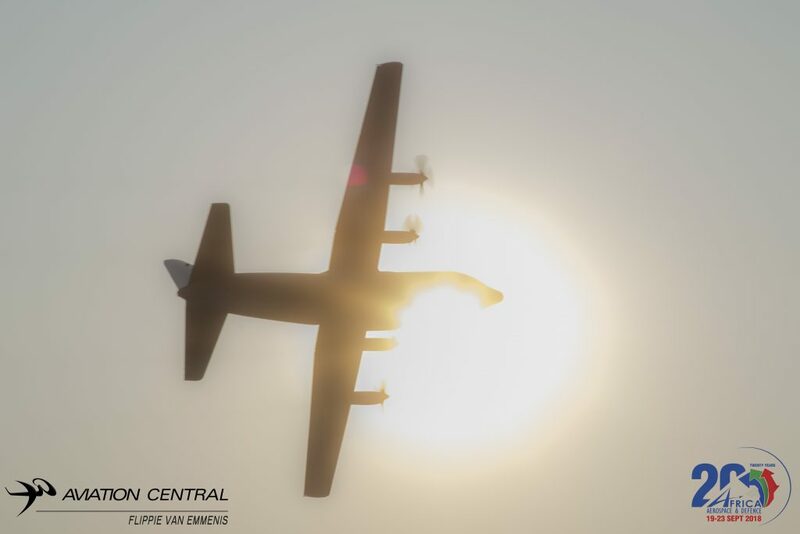 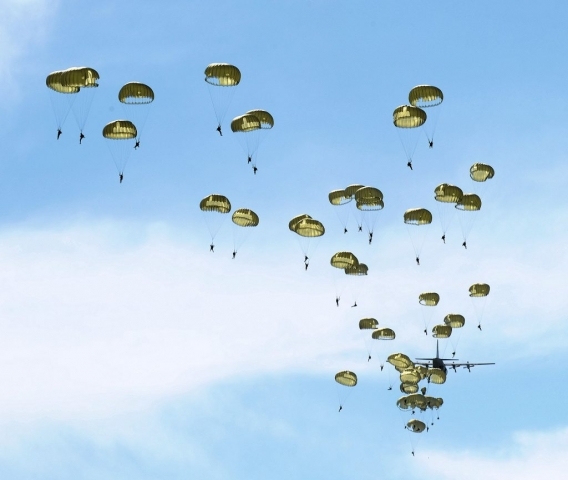 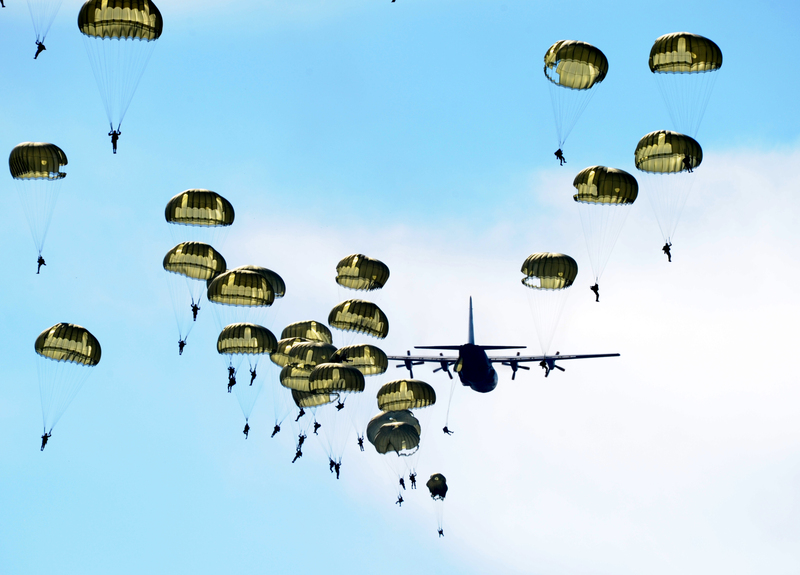 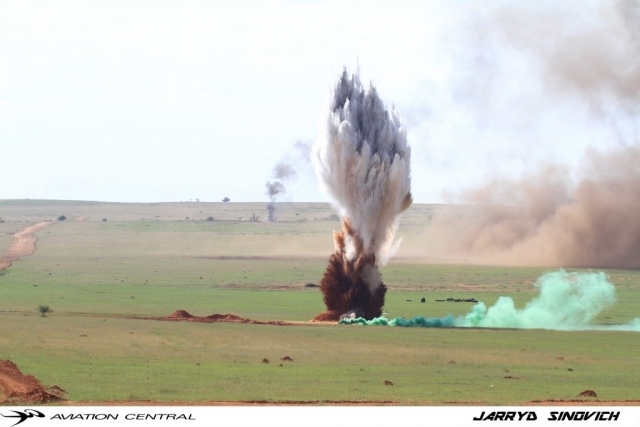 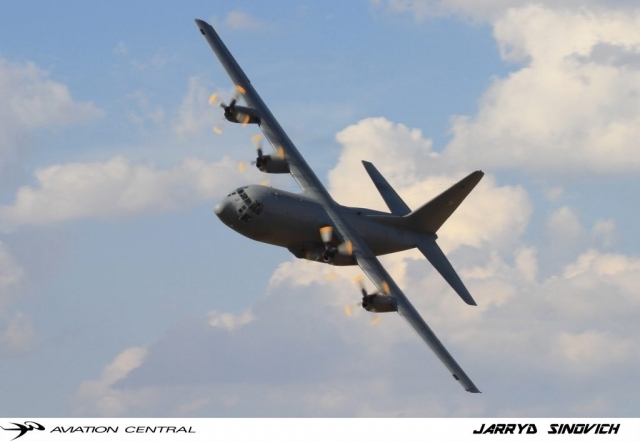 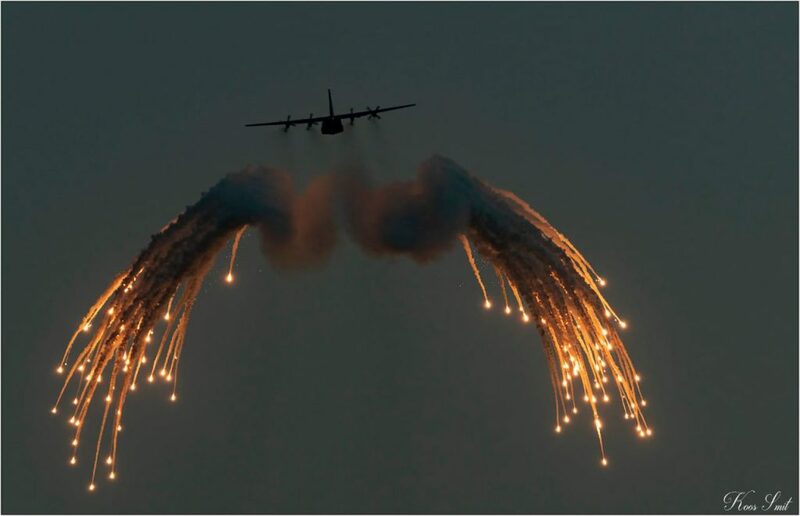 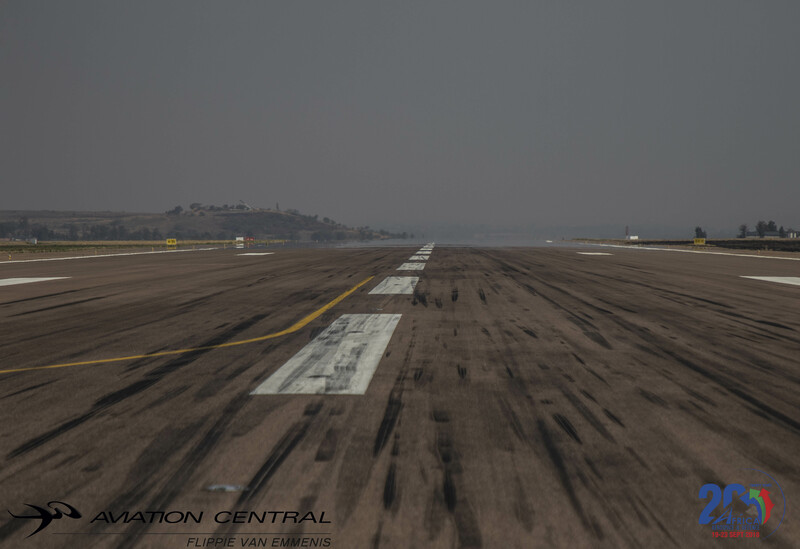 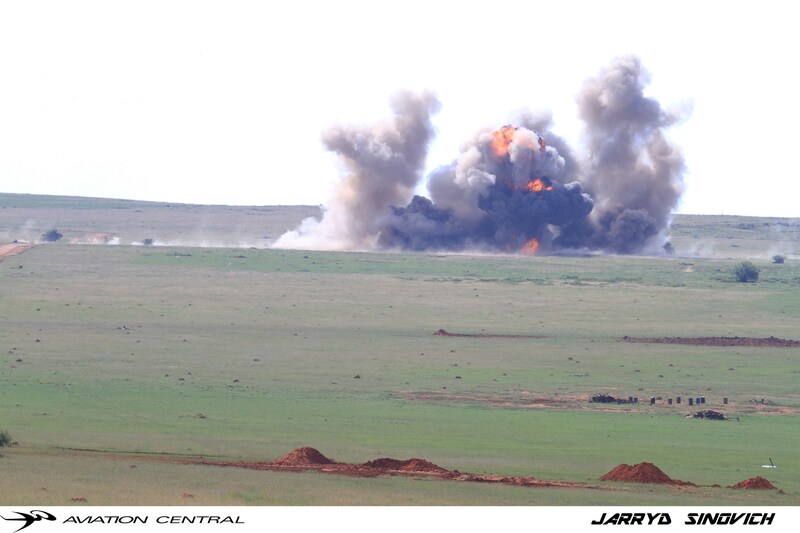 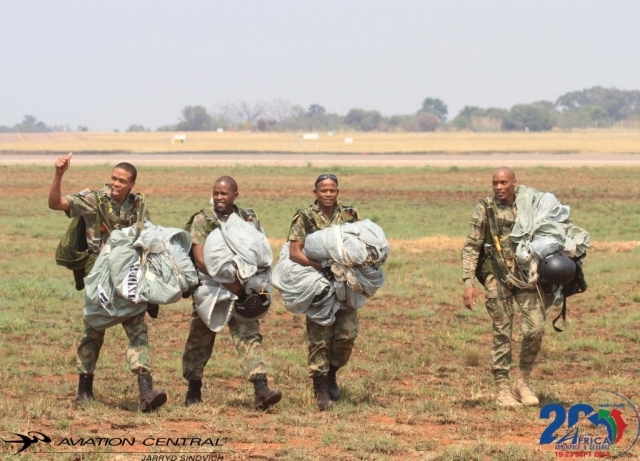 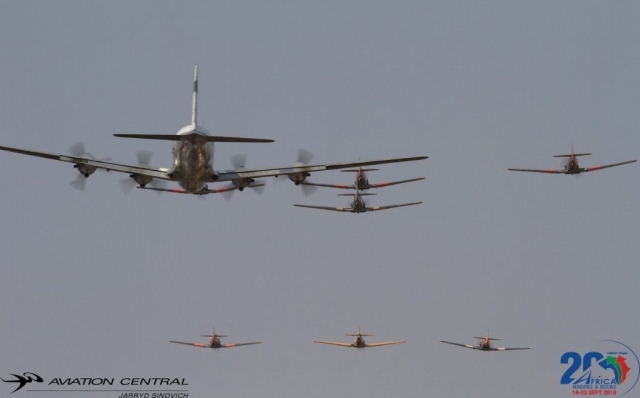 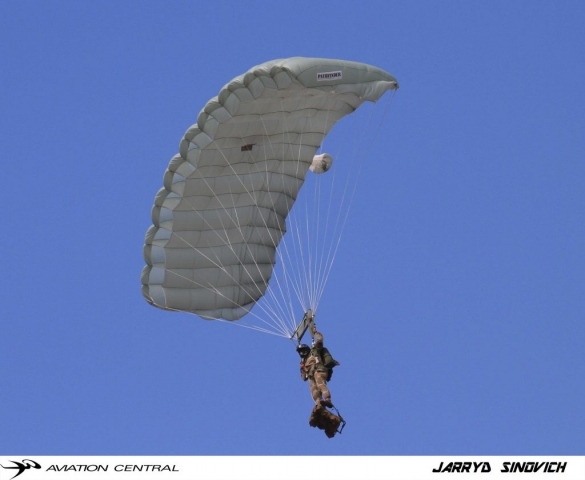 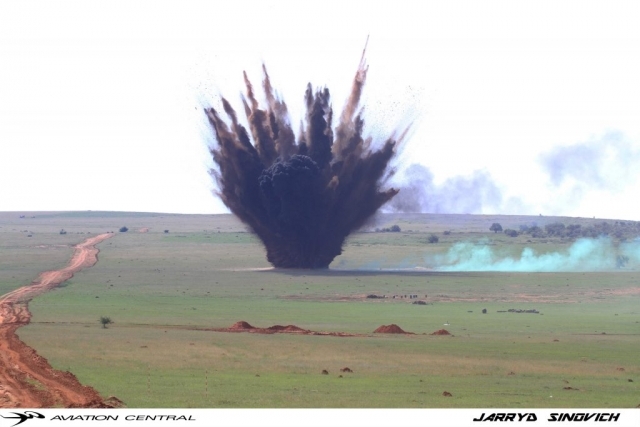 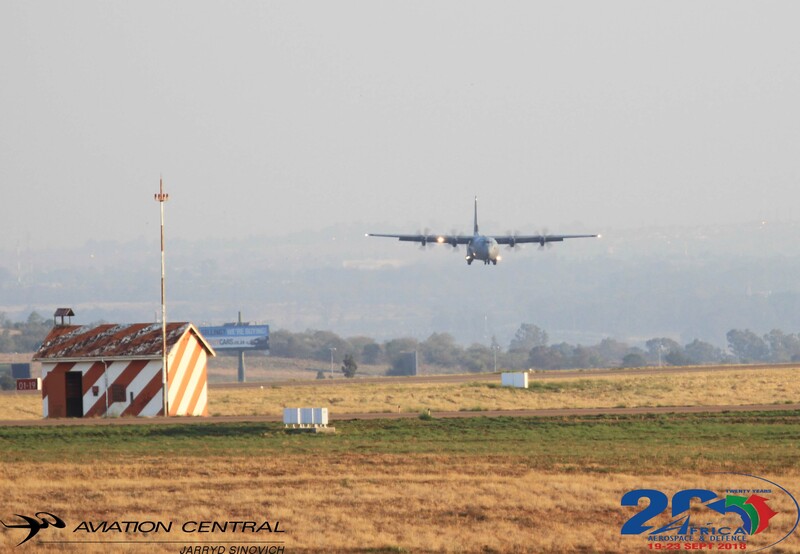 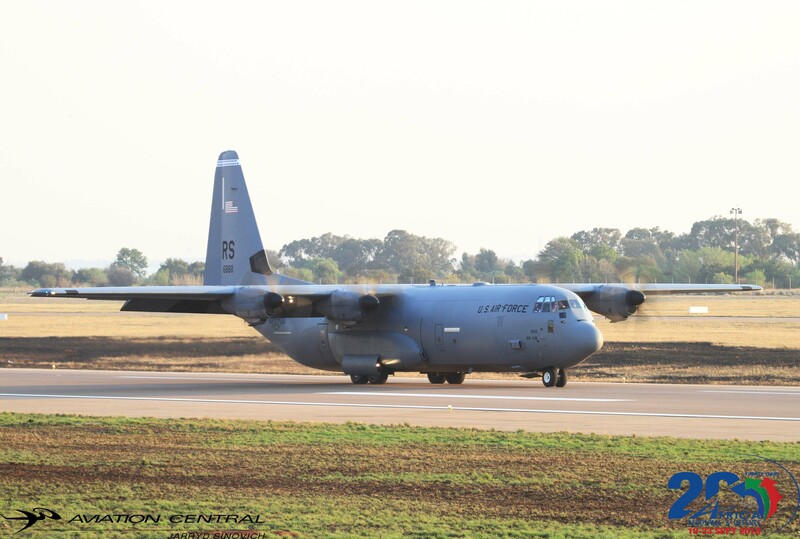 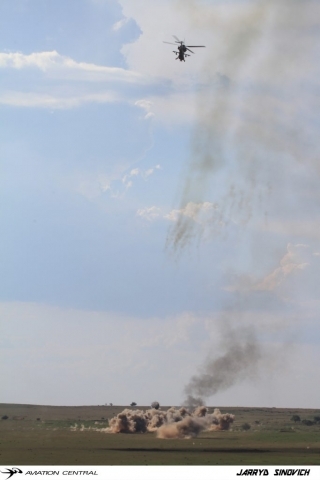 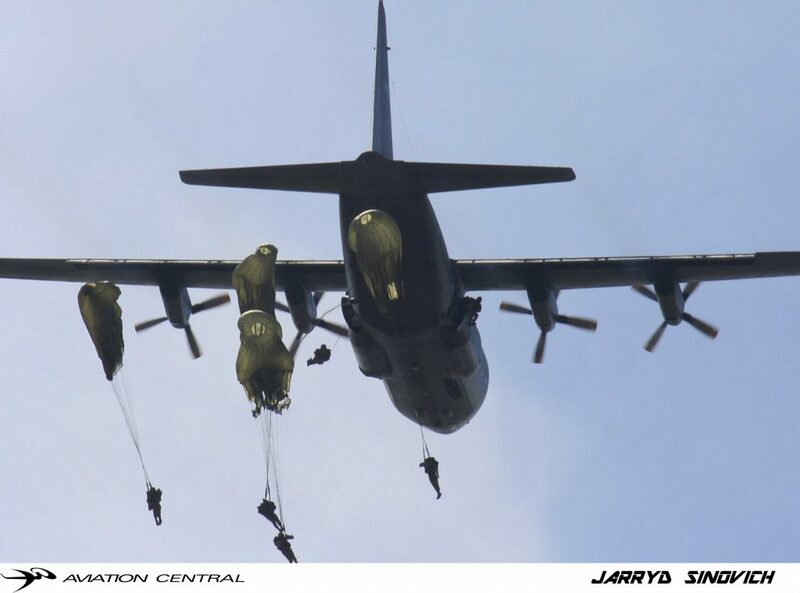 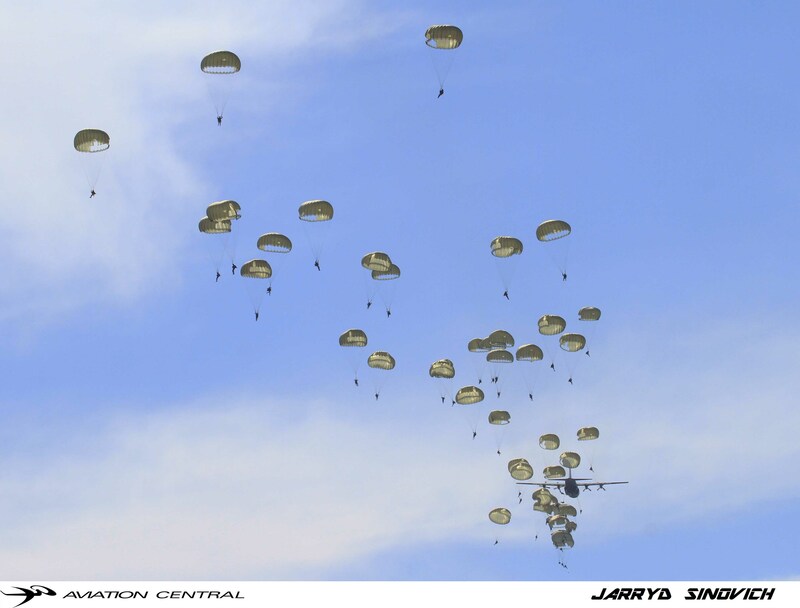 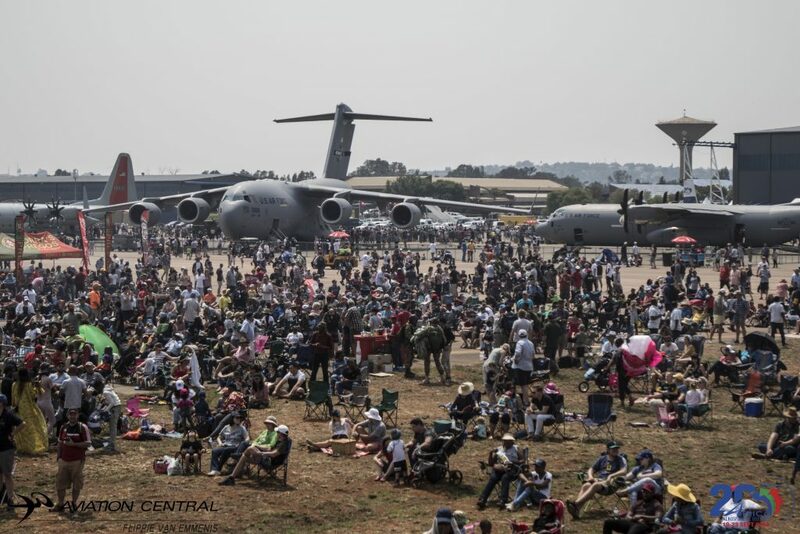 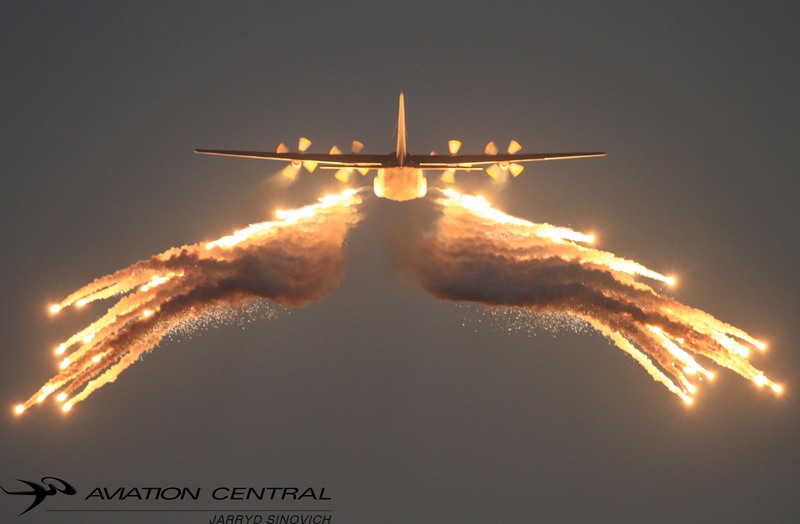 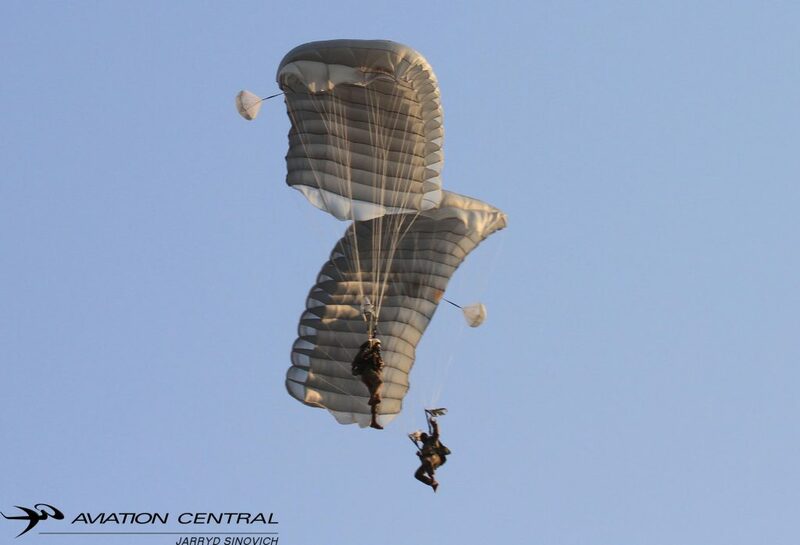 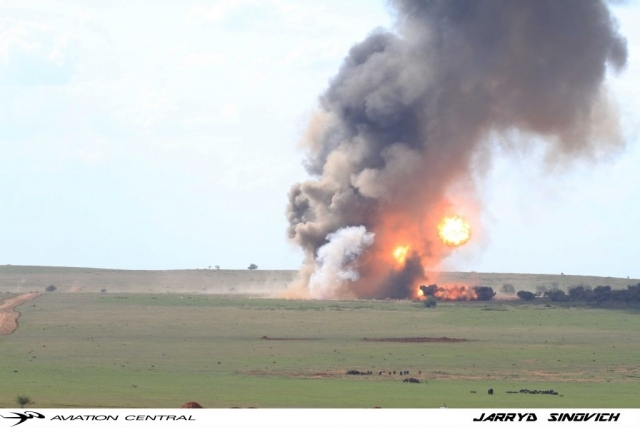 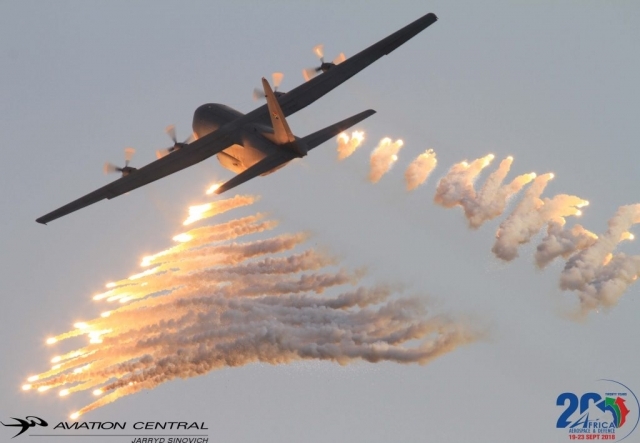 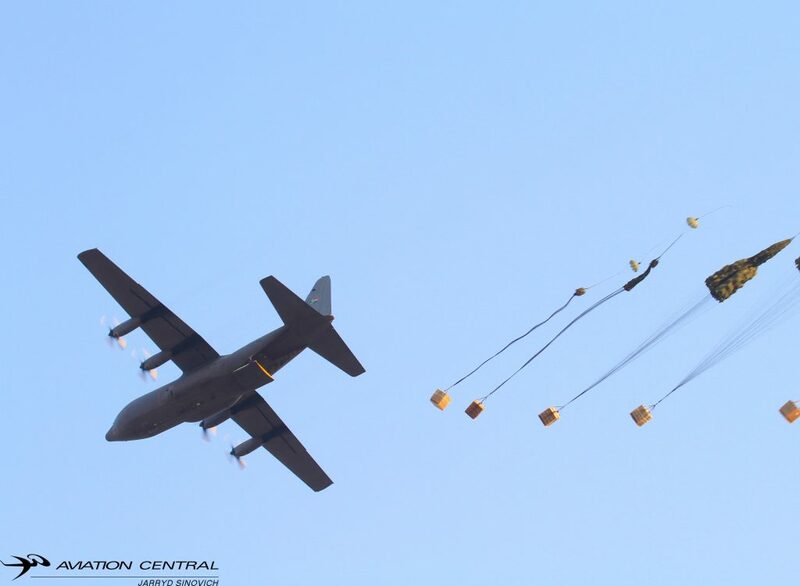 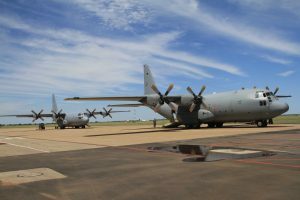 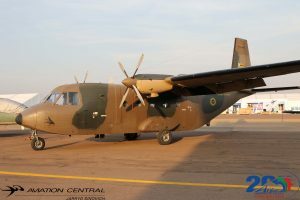 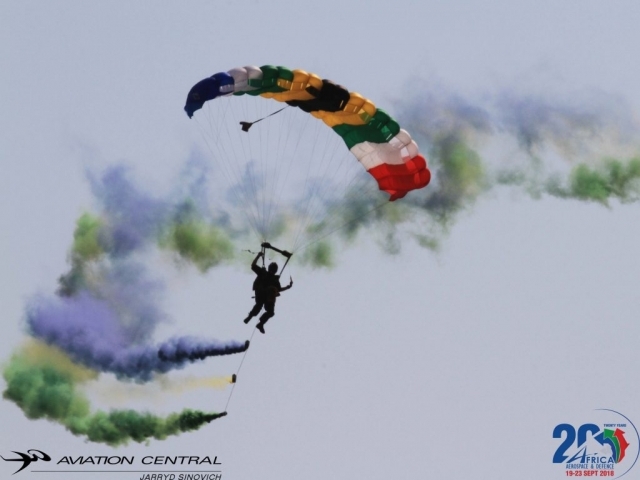 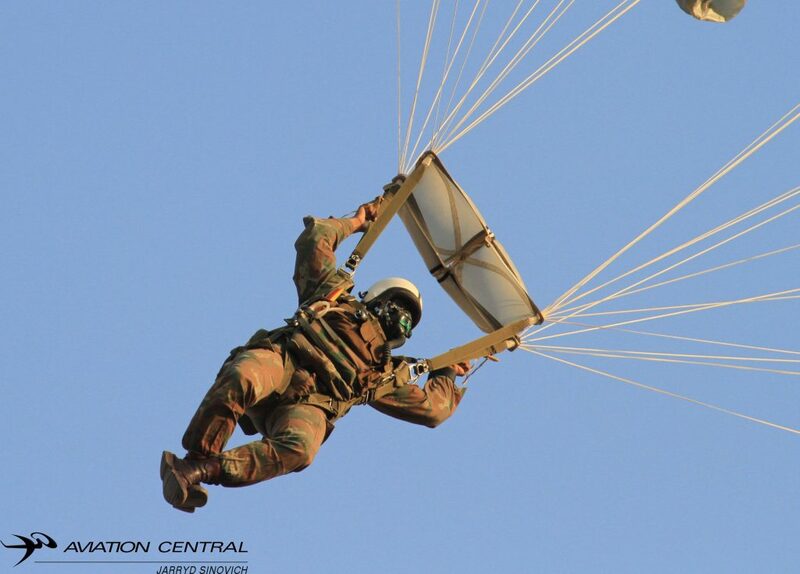 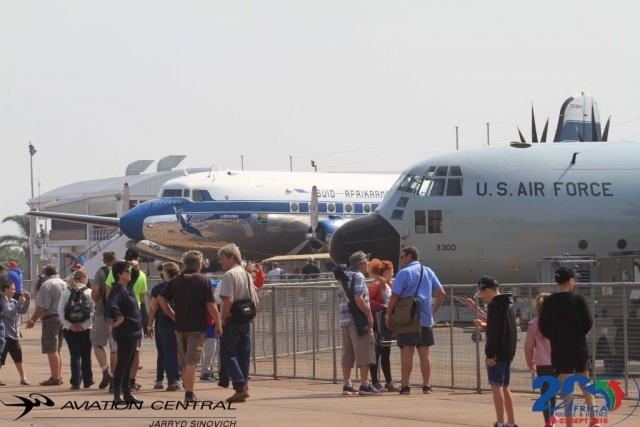 The Army engineers of the South African Army were next in line to show off the earth shattering explosions that were set off.The Air force was then overhead again, this time with Two 28 Squadron C130BZs dropping a parachute cargo drop and 64 paratroopers. As soon as the area was clear from the Para drop and troops were brought out of the weapons zone, Ratels drove into the firing zone and engaged with small arms fire. 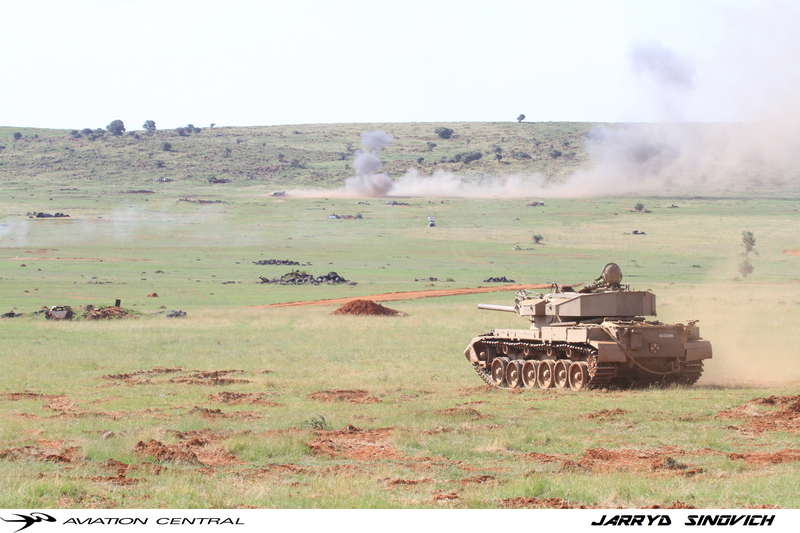 The battlefield was then kicked up with the roar the big guns the Olifant Mk1 Tanks and Rooikats kicking up dust from their cannon fire. 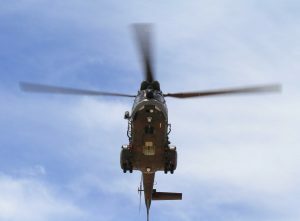 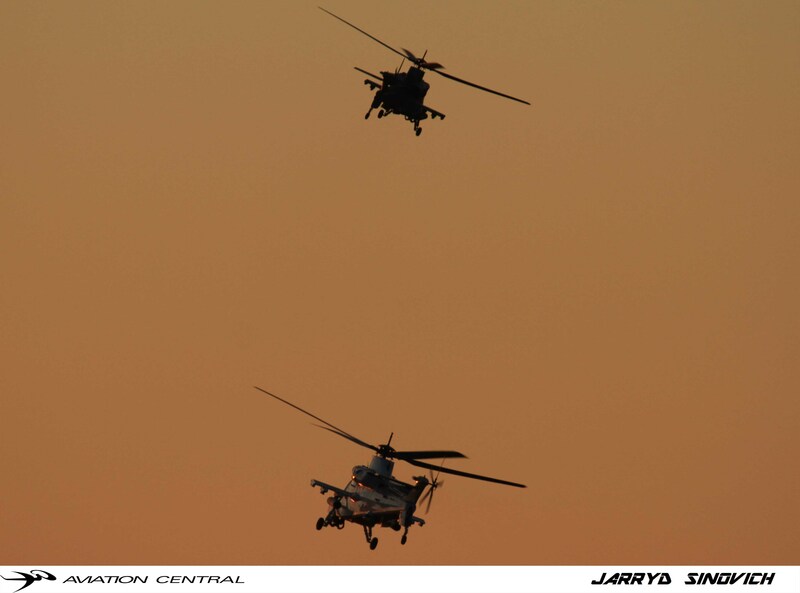 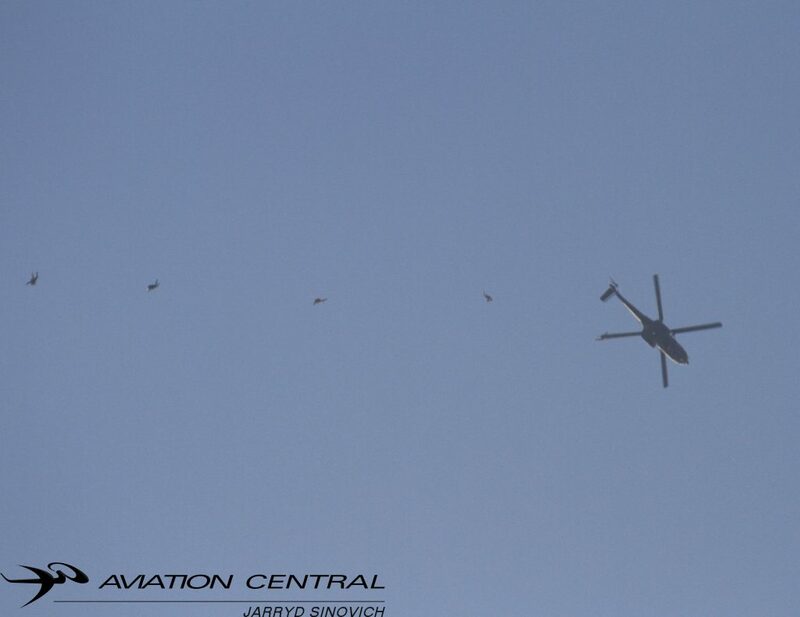 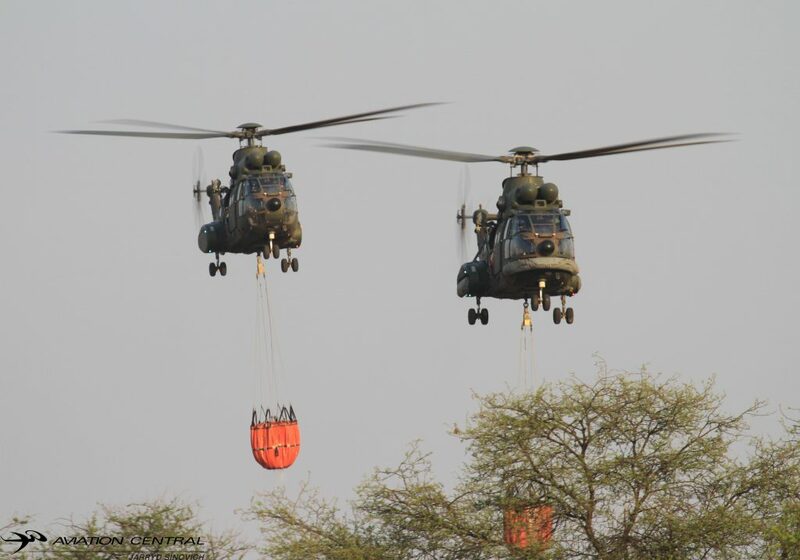 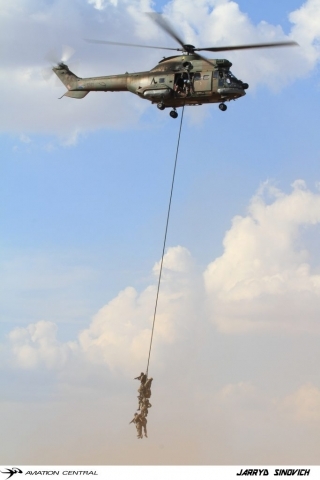 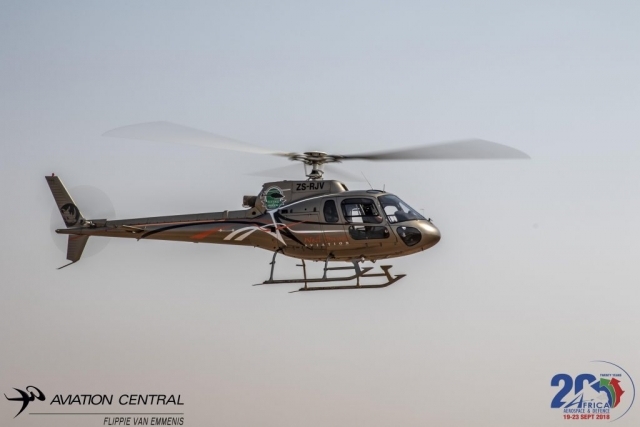 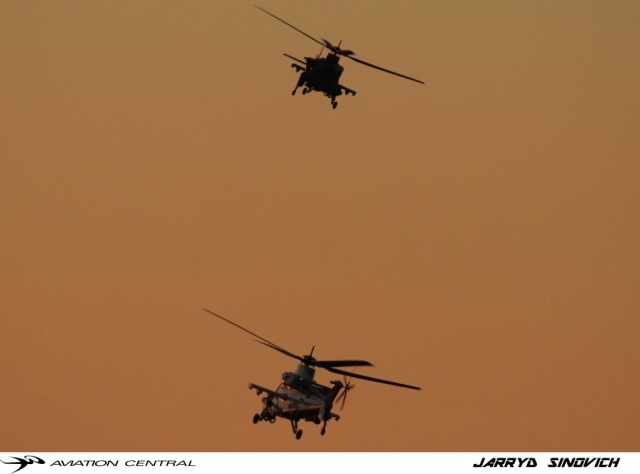 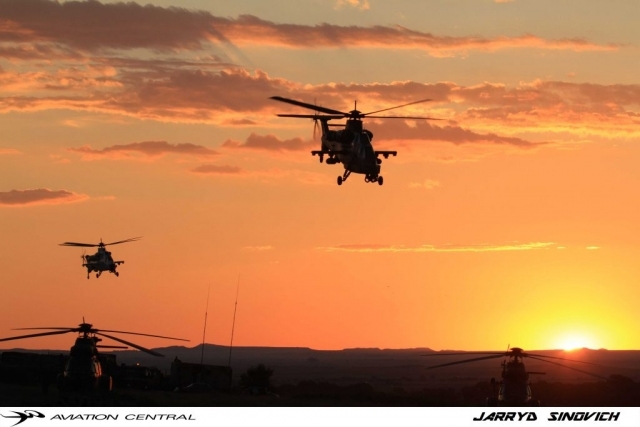 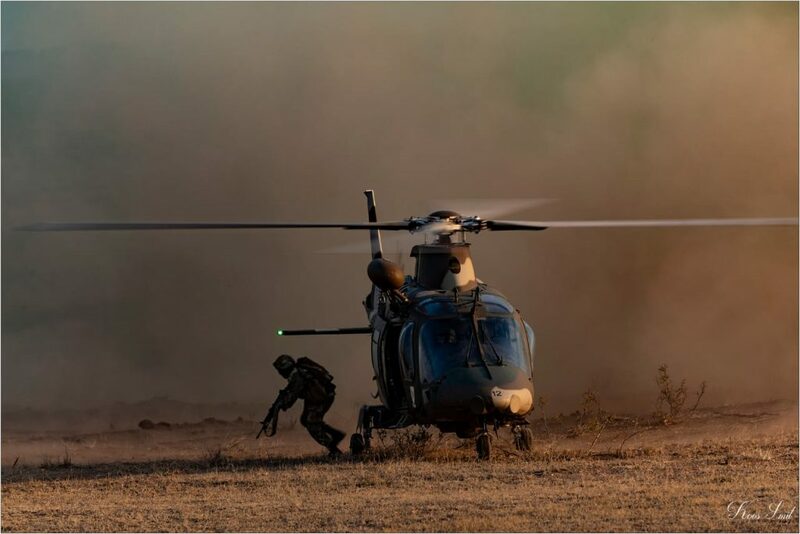 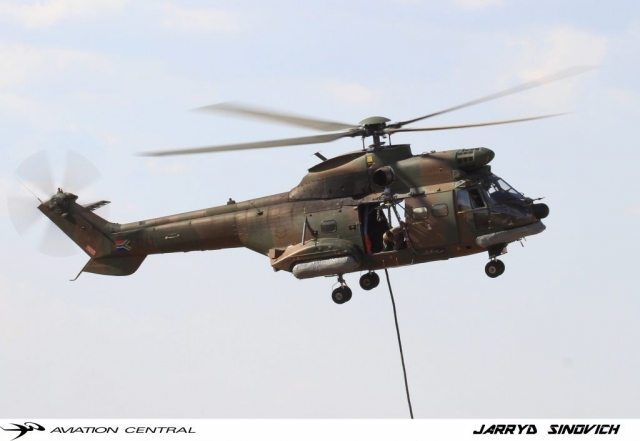 The air force was at it again, with two Agusta A109LUH performing a search and Rescue situation of a “simulated downed aircraft,”with 3 Oryx helicopters bringing troops to and from the batttlezone.At the same time Rooivalk atttack helicopters from 16 Squadron provided top cover. 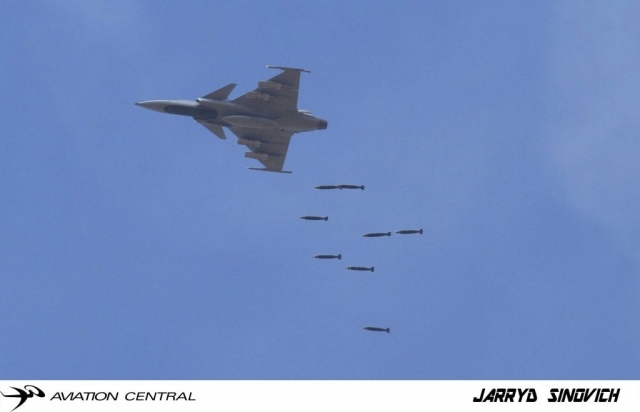 Fast movers were then sent in to drop bombs ranging from the Mk81 and Mk82 bombs released from Gripen and Hawk fighter aircraft. 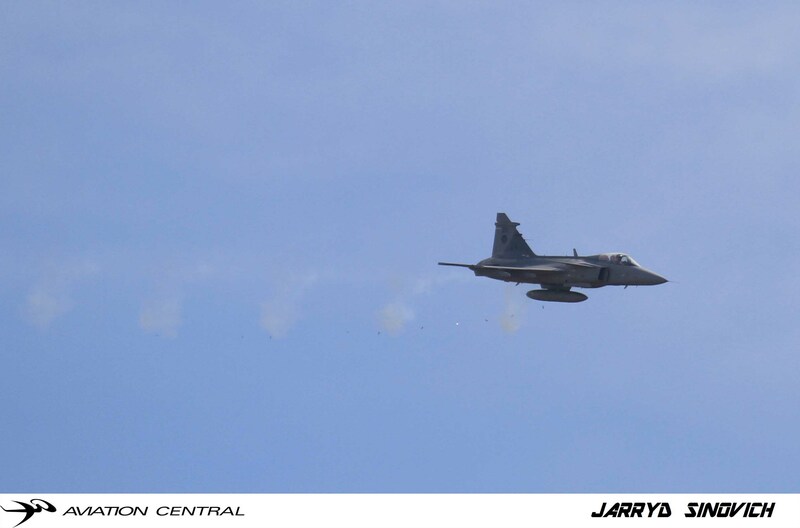 It was also the first time seeing Gripens shooting their cannons.The usual 30mm Aden cannon from the Hawk was also put to use on the battle zone. 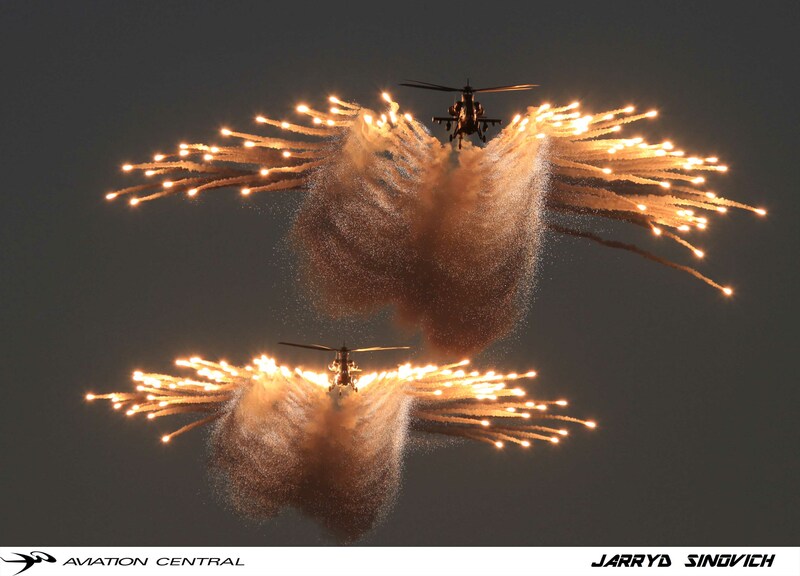 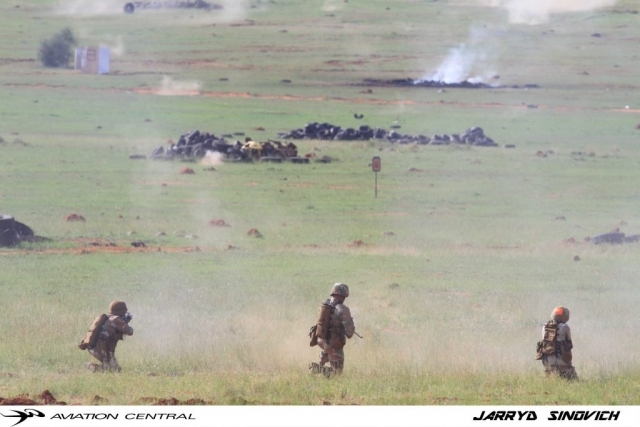 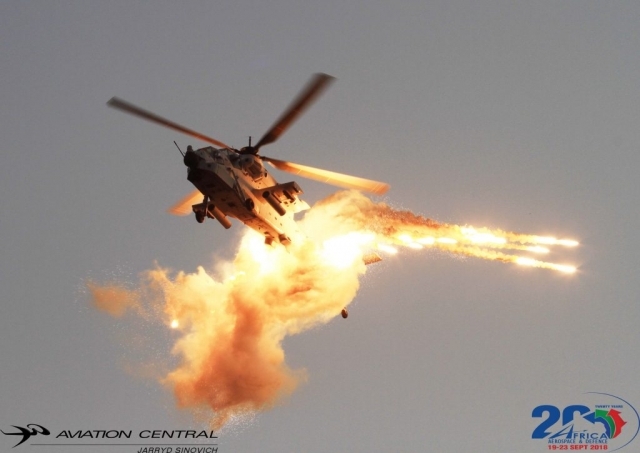 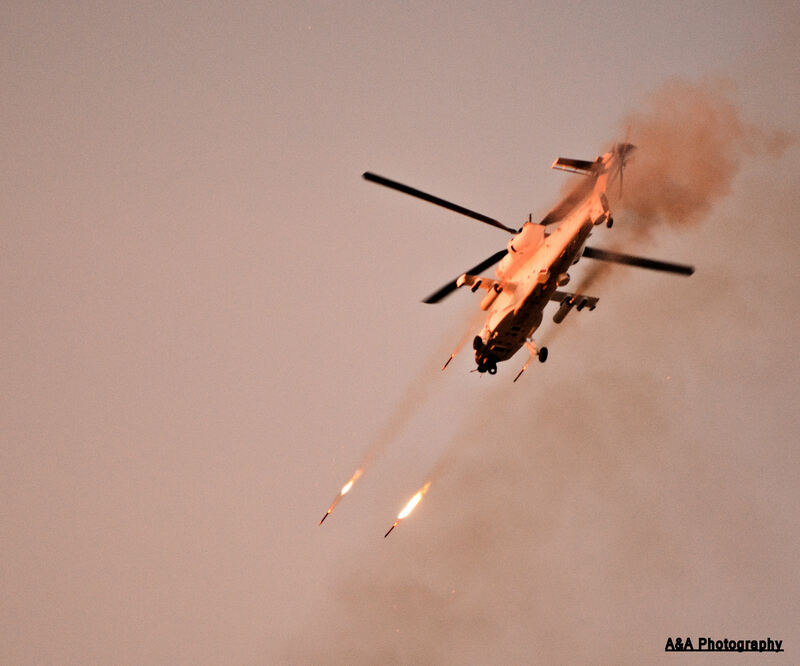 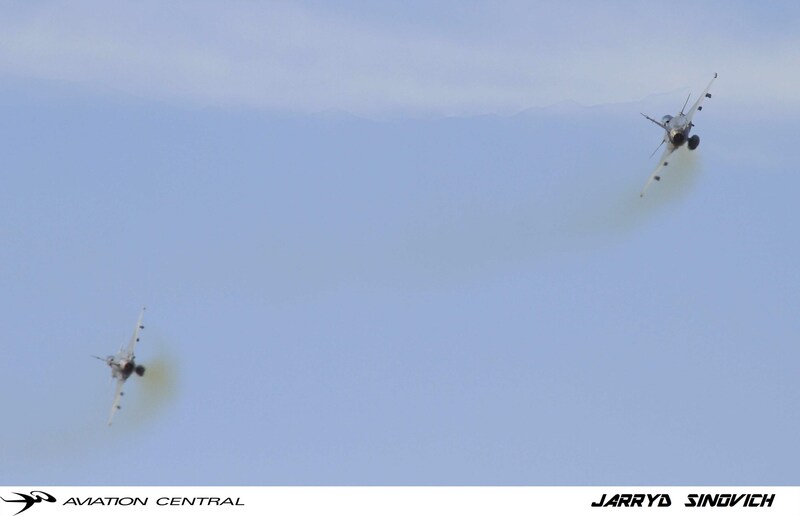 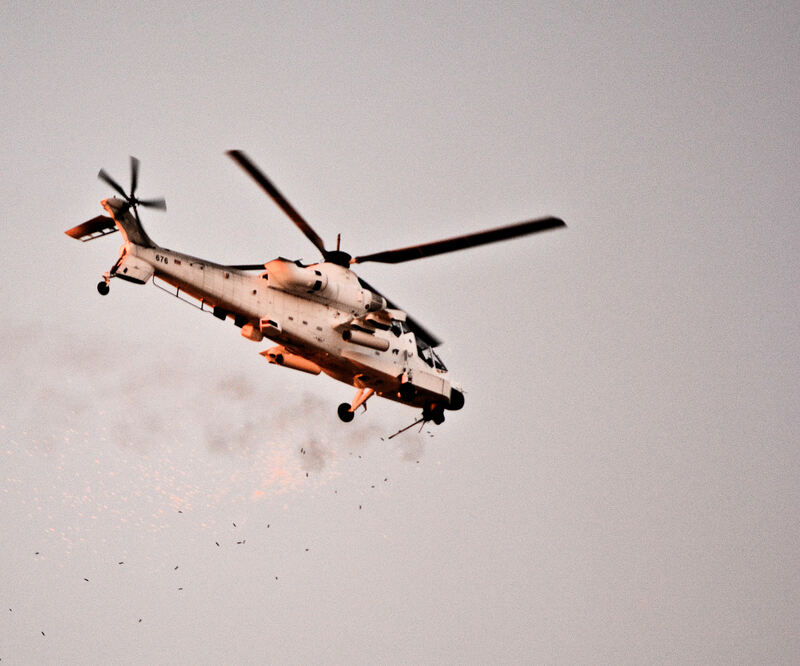 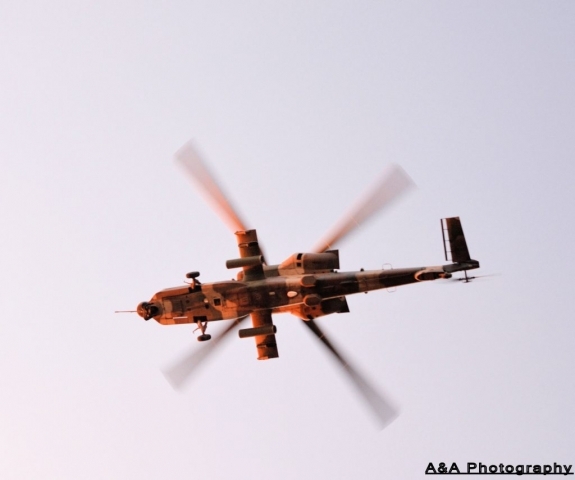 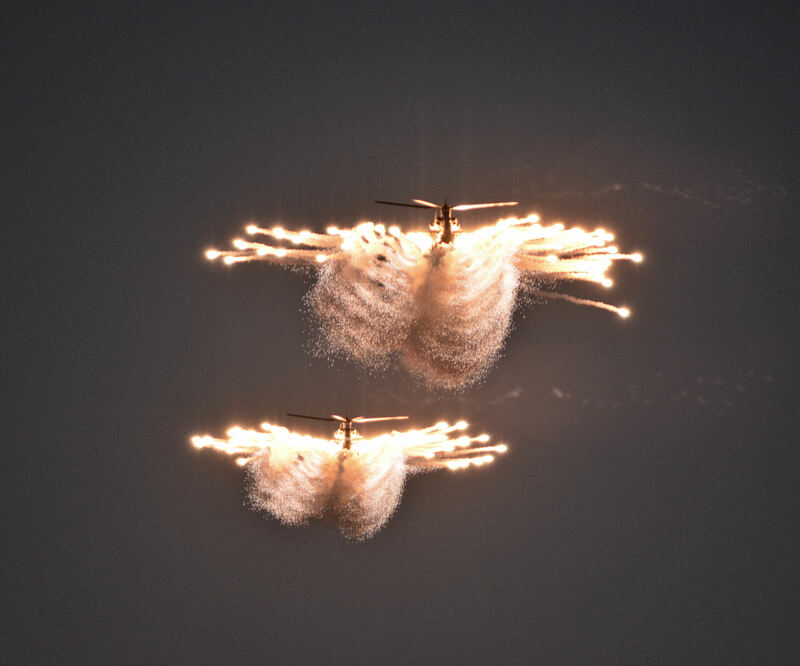 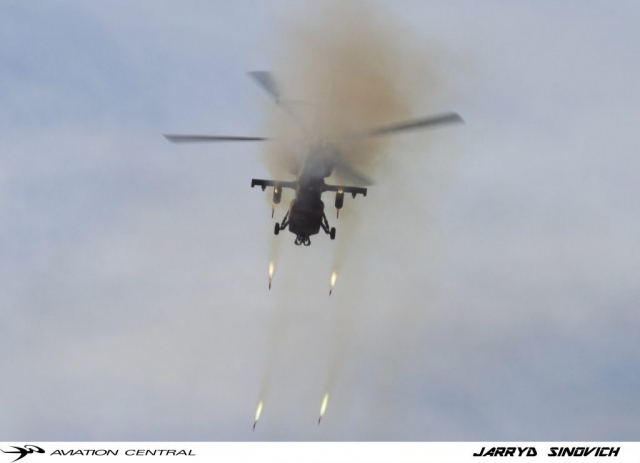 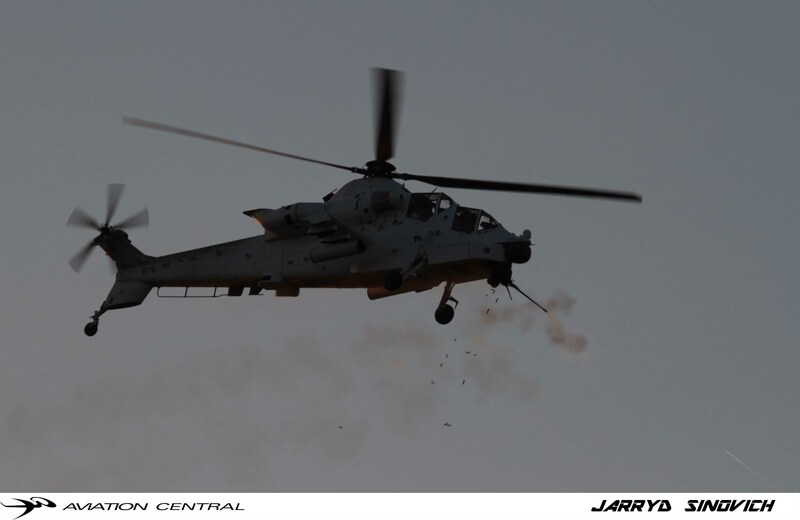 The two Rooivalk attack helicopters in attendance demonstrated the type of flying they sometimes do during peacekeeping operations in the Democratic Republic of Congo, raining 20 mm cannon fire down and unleashing 70 mm rockets onto the battlefield. 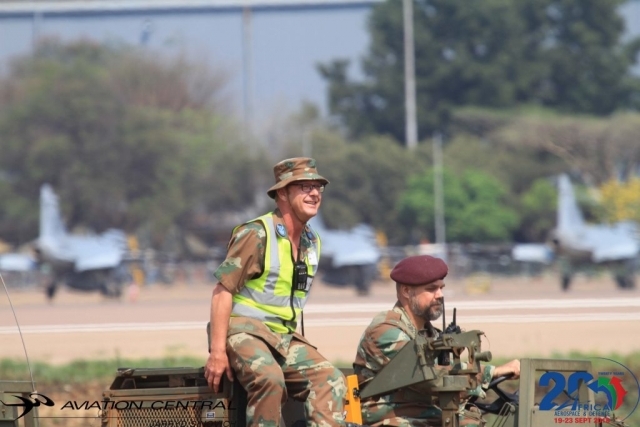 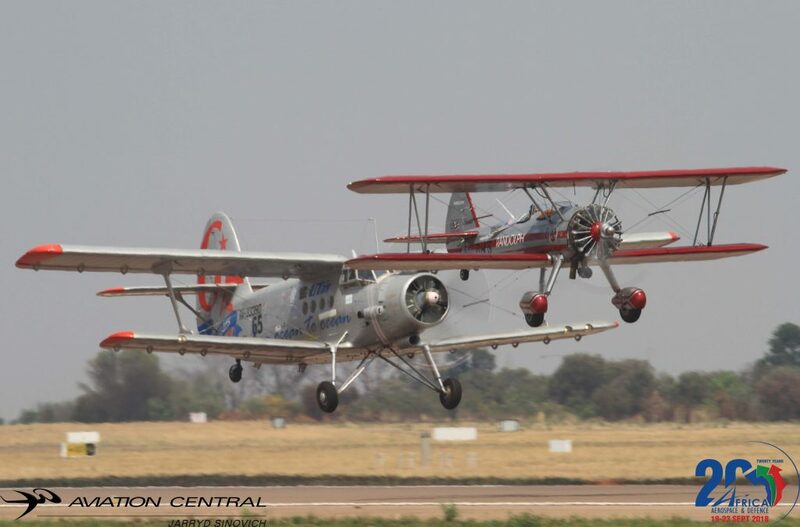 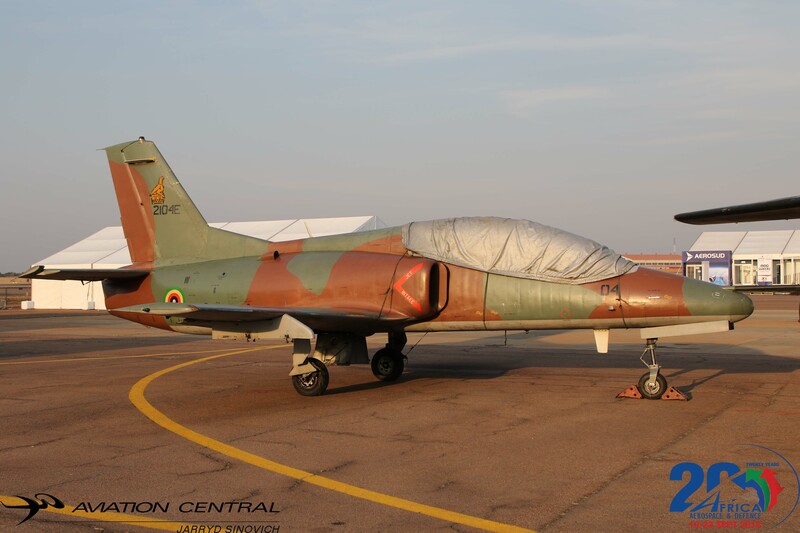 The demo was slowly coming to a close, the various aircraft that took part gave fly pasts which included 4 Hawks,5 gripens,3 Oryx Helicopters,2 A109s,2 Rooivalks and a C130.The main battle tanks and armoured vehicles then proceeded to give a salute to the Chief of the SANDF in a parade. 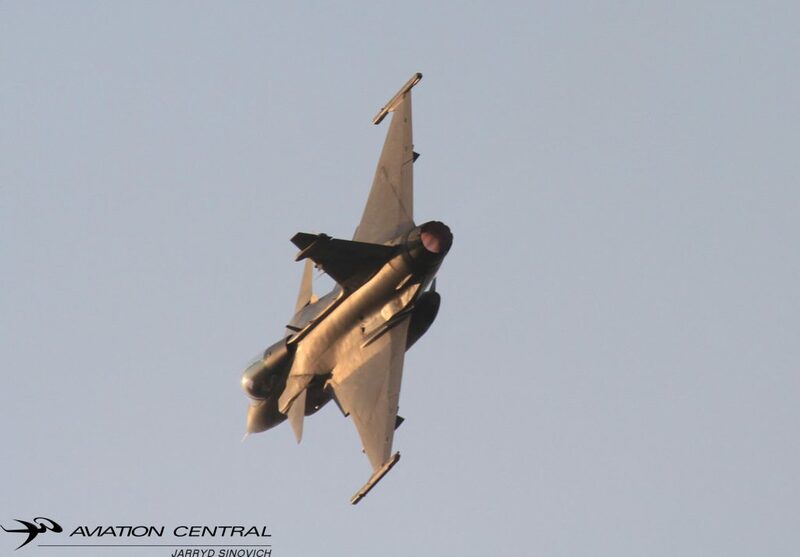 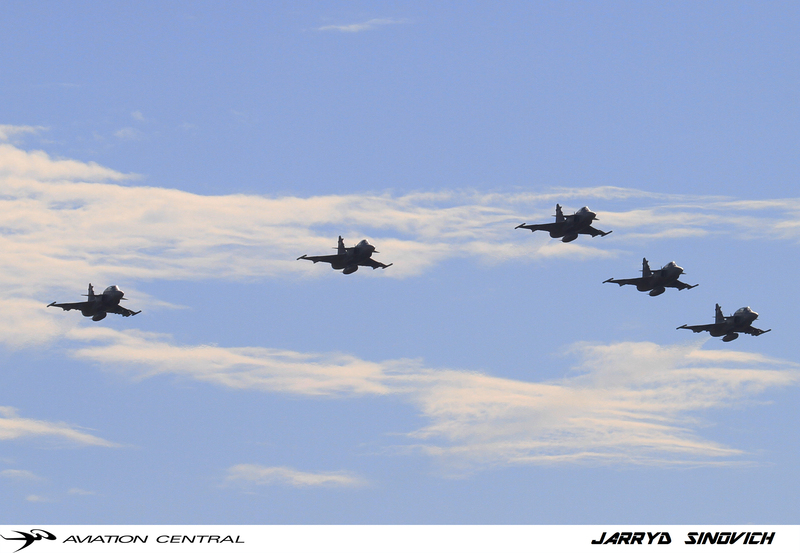 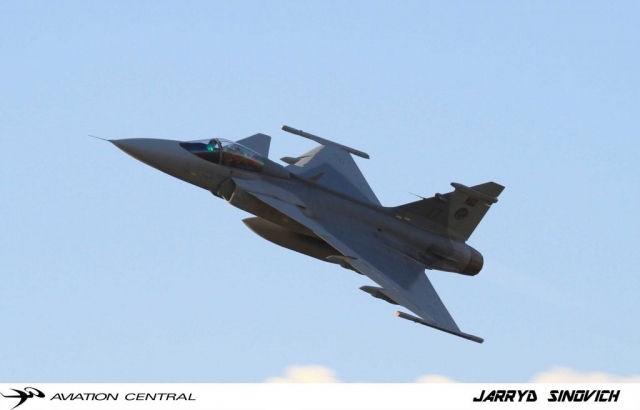 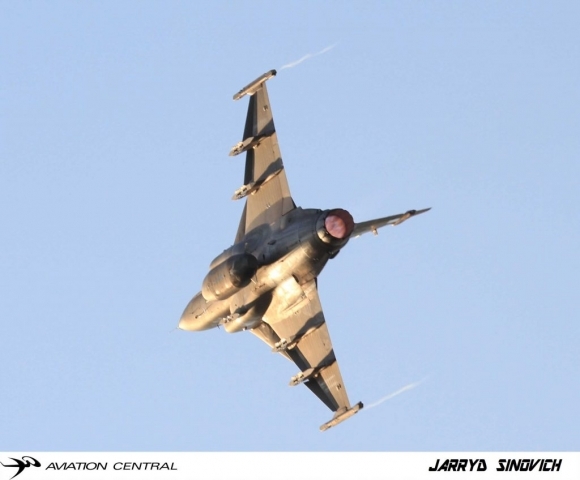 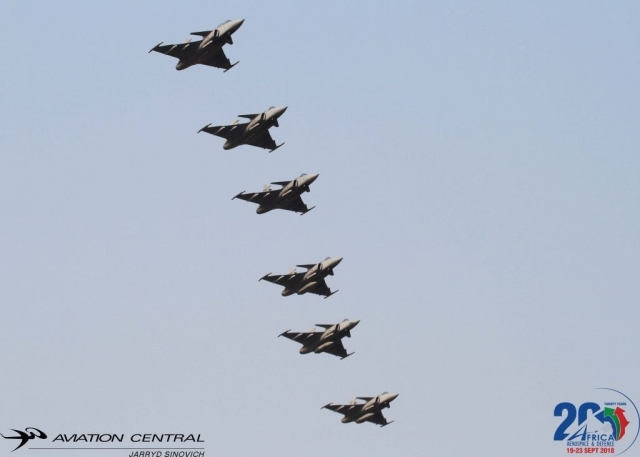 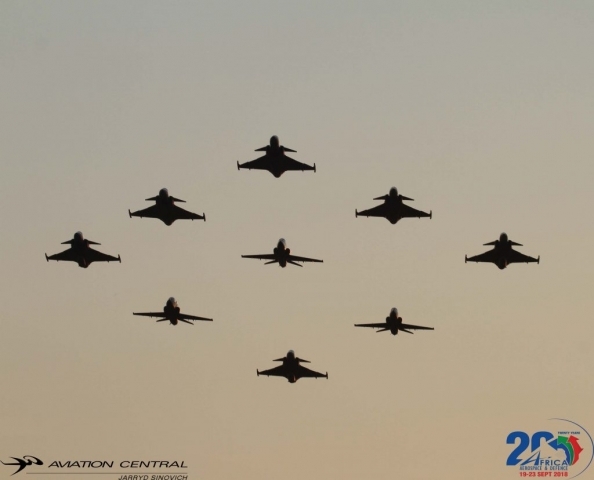 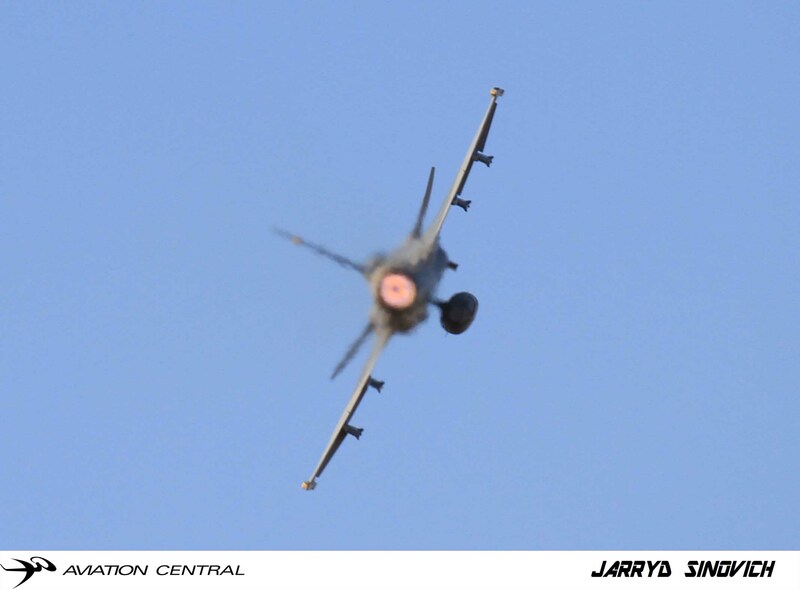 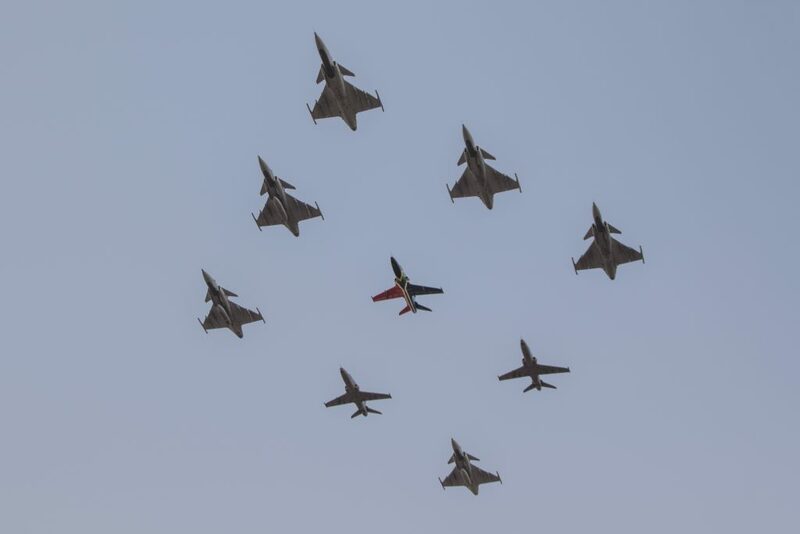 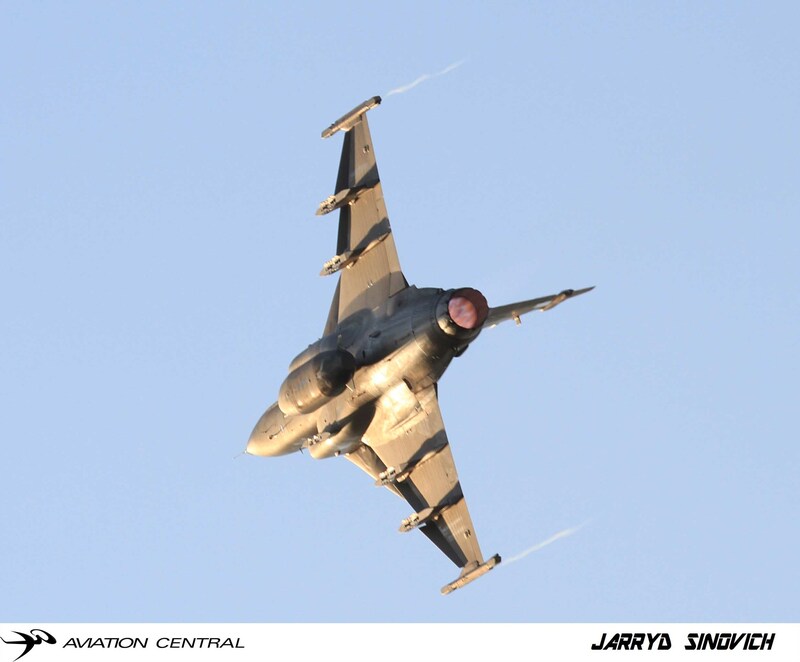 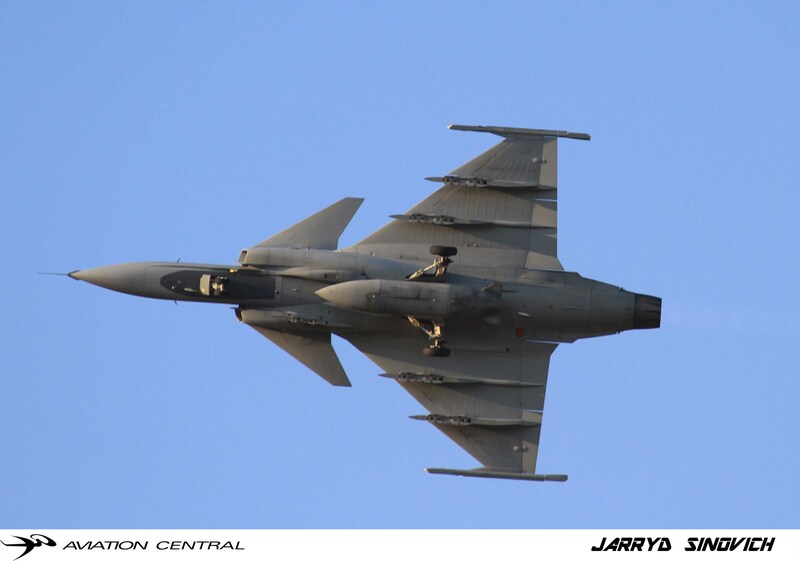 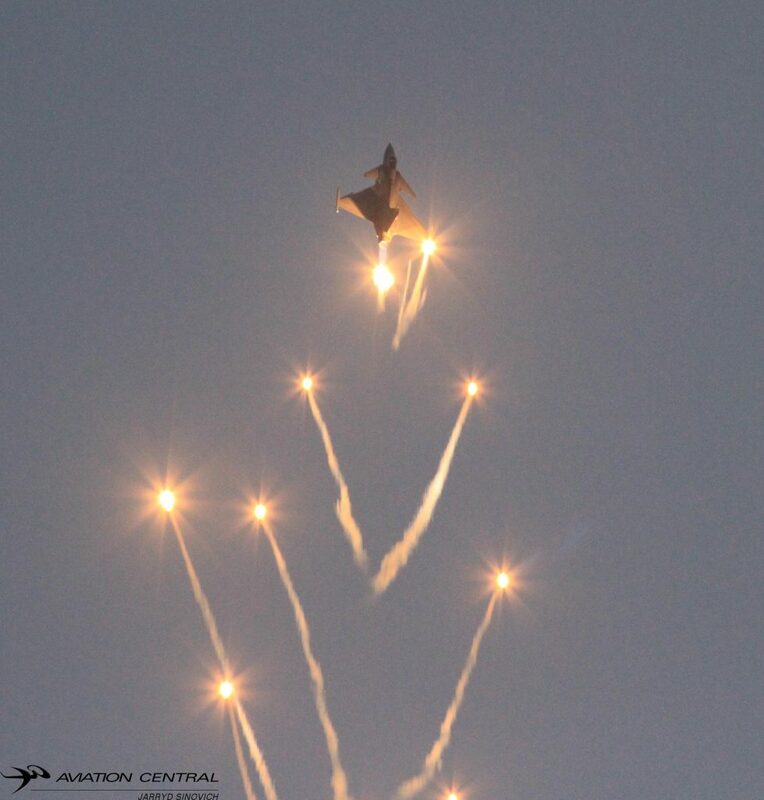 The guests and media were then treated to a display from the Silver Falcons of team 81,led by Major Mark”Katana”Gentles.Solo displays from the Hawk Mk120,flown by Lt Col Craig”Shark”Leeson and the Gripen flown by Major Geoffrey”Spartan”Cooper released flares during the course of their displays. 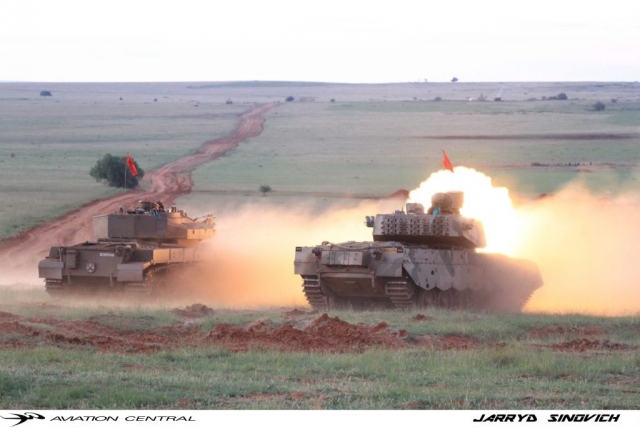 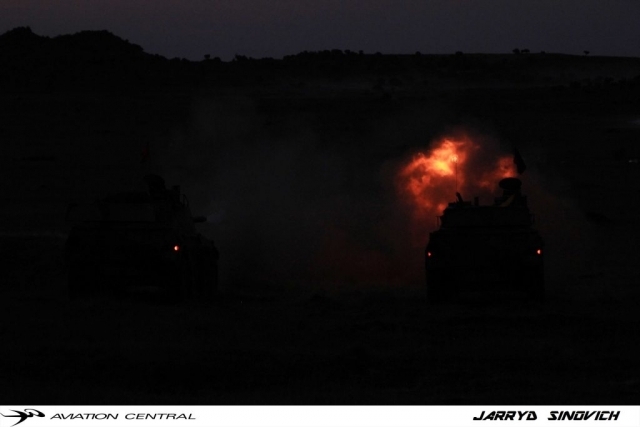 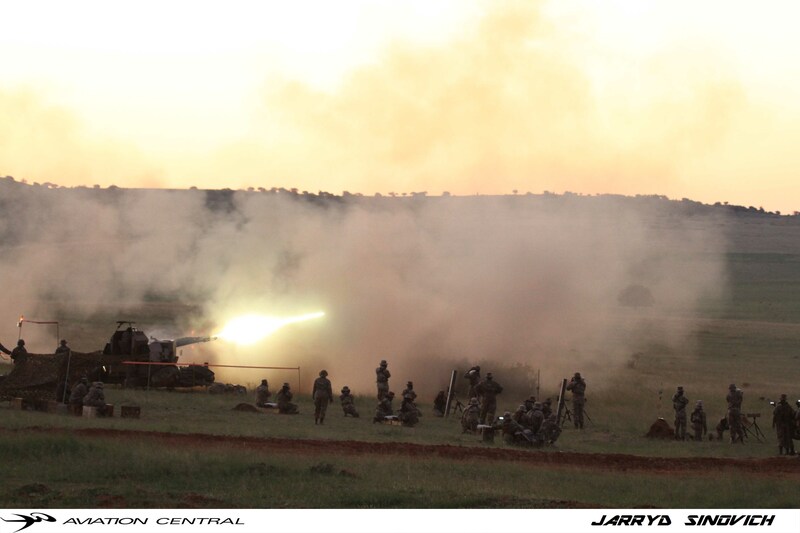 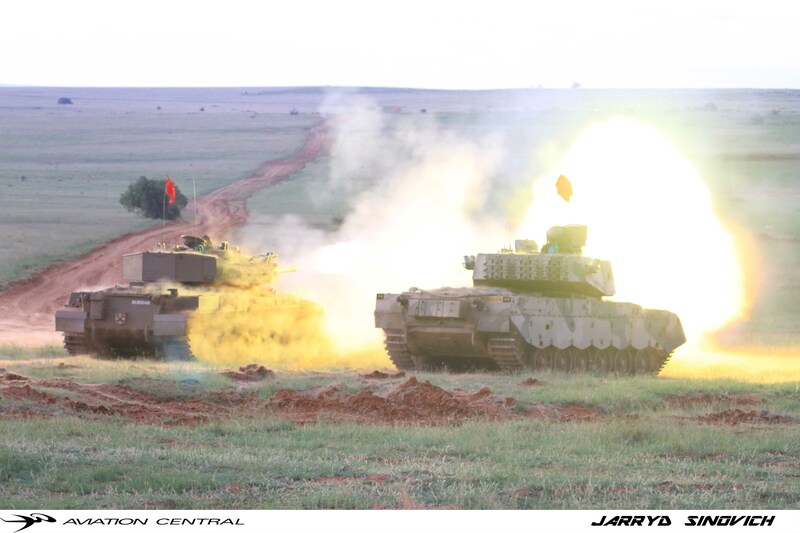 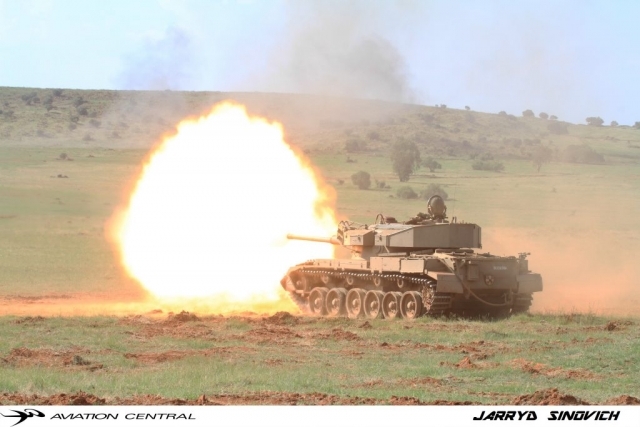 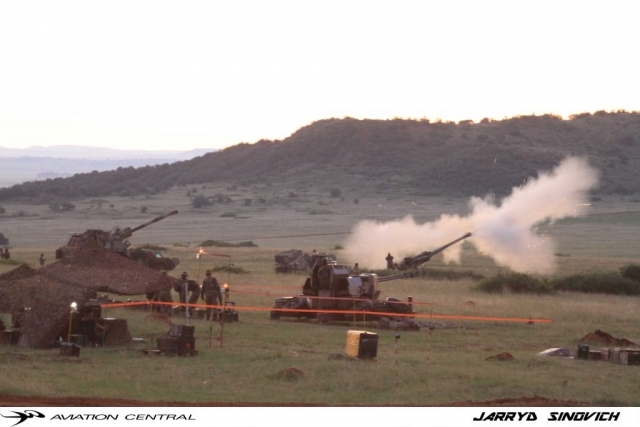 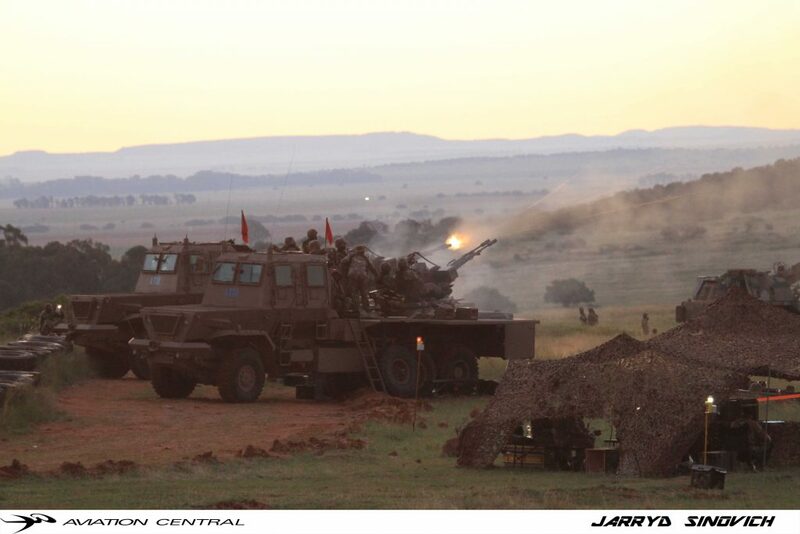 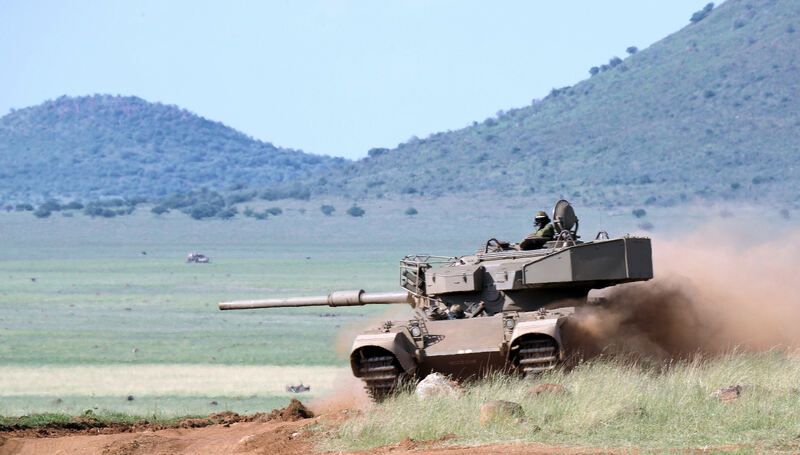 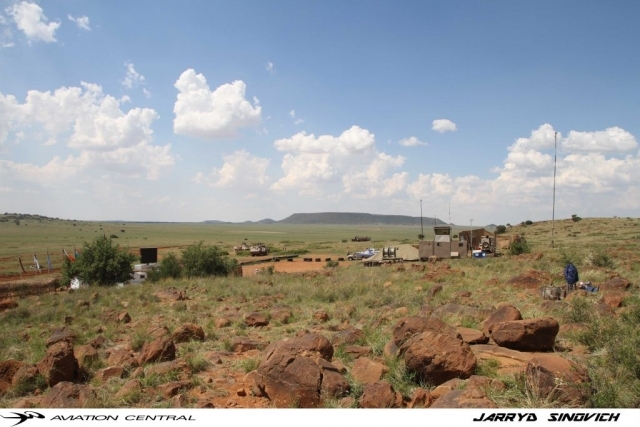 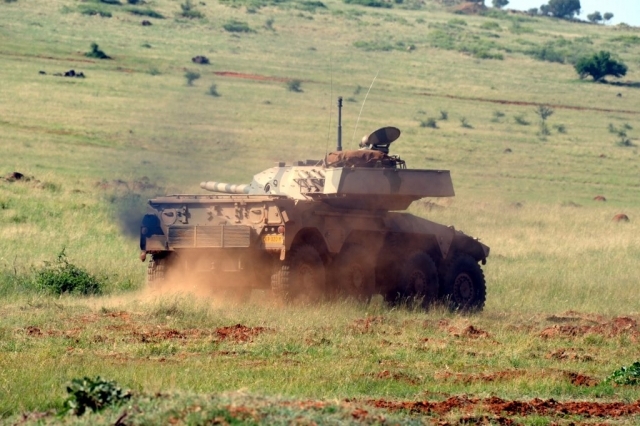 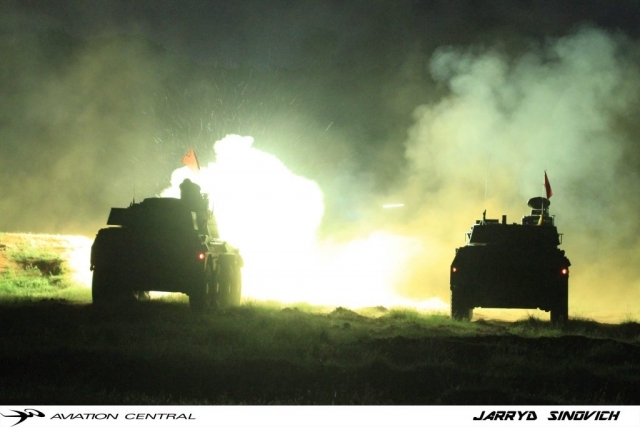 The night shoot then took place just after dusk showing off from the smallest arms fire to the biggest arms fire in the SANDF,this included assault rifles, machineguns, RPGs, mortars, Ratel 90 mm rounds and Olifant tank rounds. 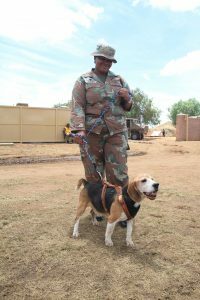 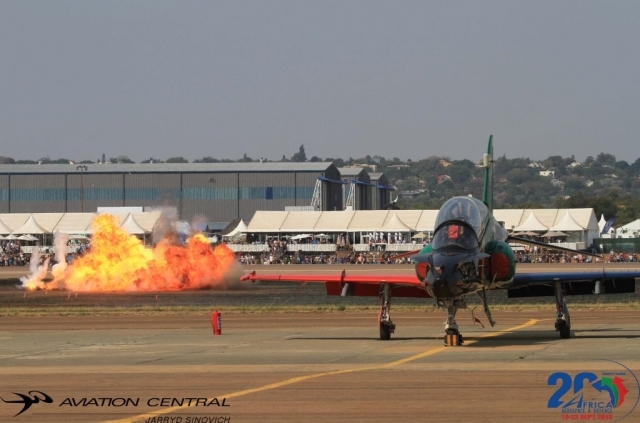 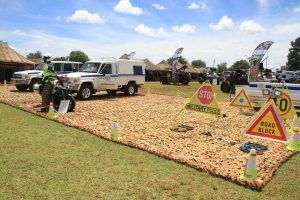 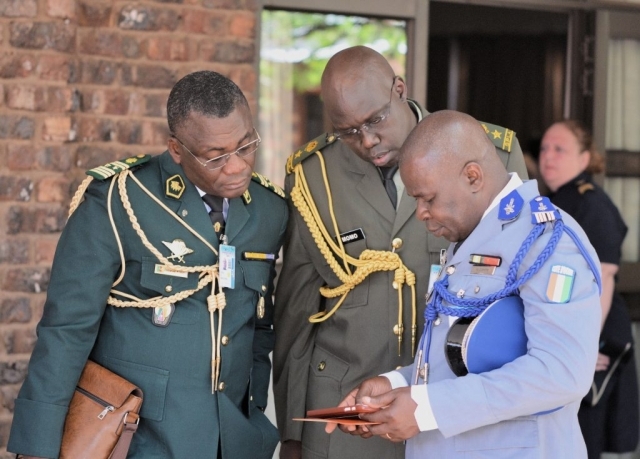 Chief of the SANDF General Solly Shoke said the capability demonstration was part of normal training but was held in the run-up to Armed Forces Day to show the public what the armed forces do. 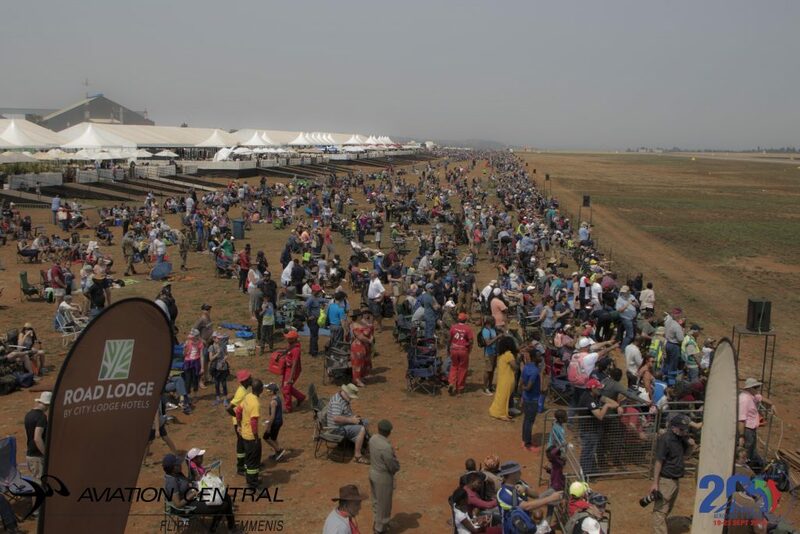 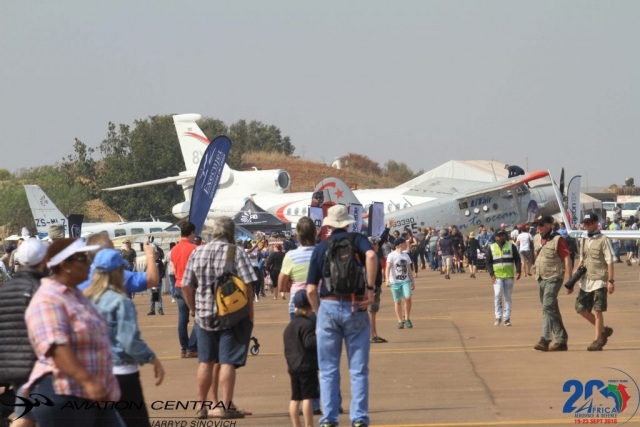 “We train to be ready at all times,” he said, and added that the response from the people of Kimberley who previously came to witness the demonstration was “overwhelming”. 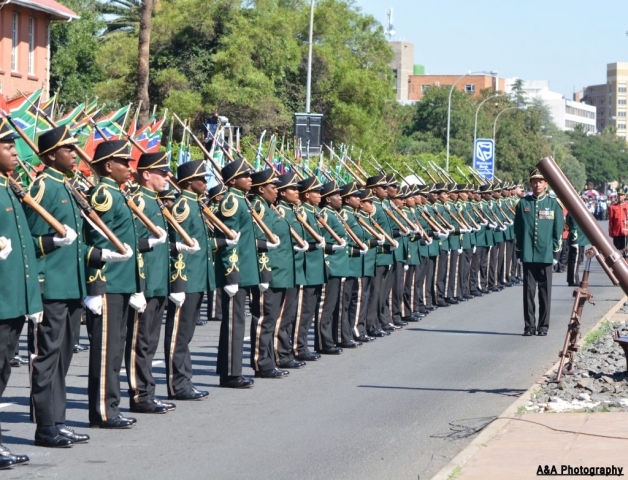 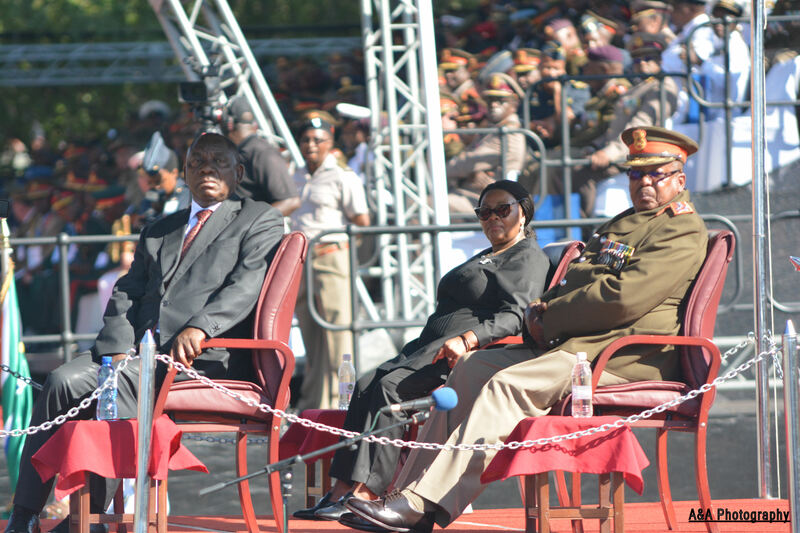 The next day being a early start of the Armed forces day parade in Kimberly, which saw new South African President Cyril Ramaphosa addressing the parade. 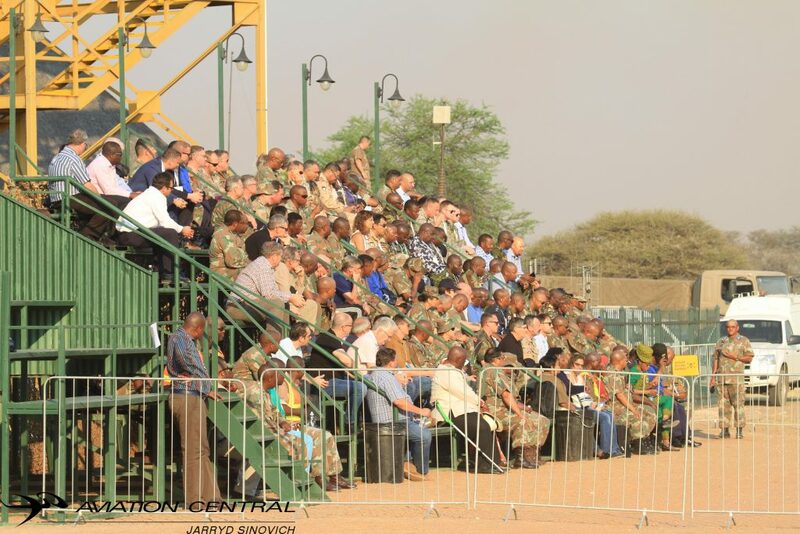 Armed Forces Day Kimberley 2018 Fan Park Launch. 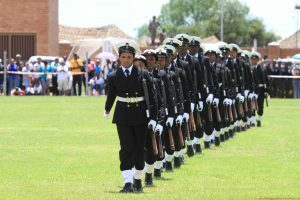 The 21st of February each year, Armed forces day is observed to celebrate the lives of the native labour contingent who died when the troopship, SS Mendi sank off the English Coast in 1917.Today we saw most of Kimberley with most part mobilsed with Military contingent. 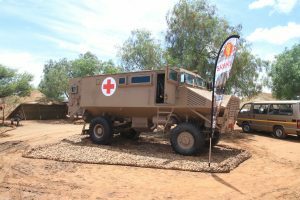 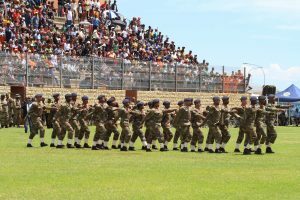 Kimberley is on a hive of activities from any form of Military platform the SANDF has to offer, This Morning marked the opening of the fan park at the A.R Abass stadium in Kimberley in the Northern Cape. 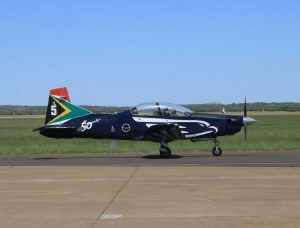 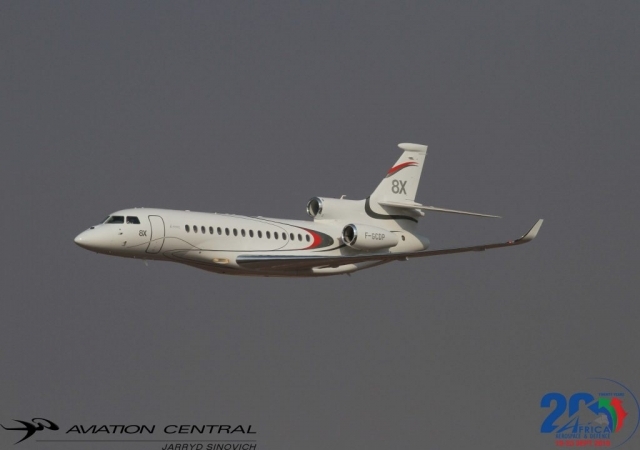 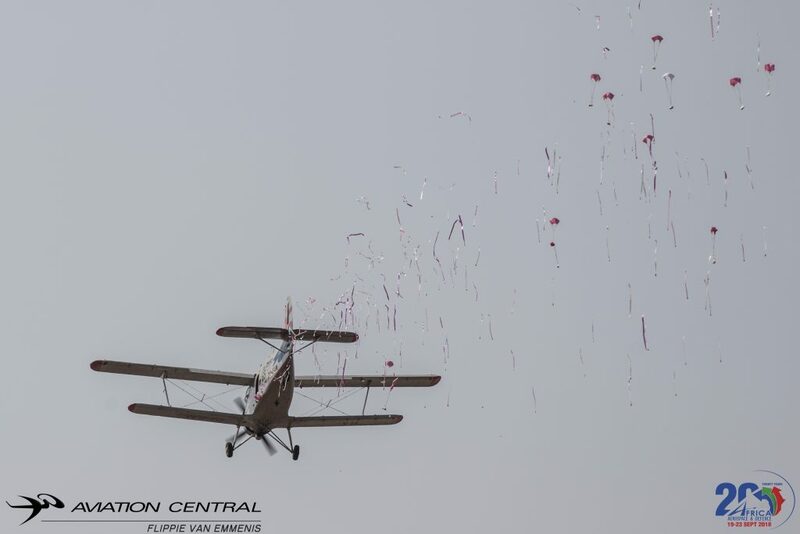 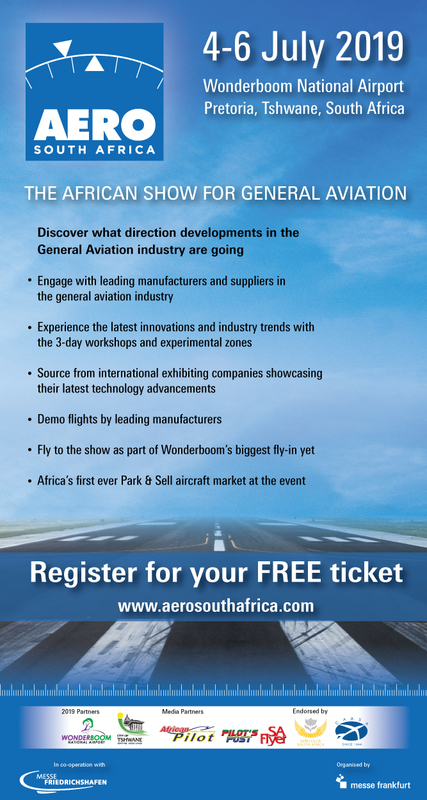 The opening of the event was in form of a Guard of honor parade accompanied by Military bands and a fly past by Oryx Helicopters from various squadrons across South Africa. 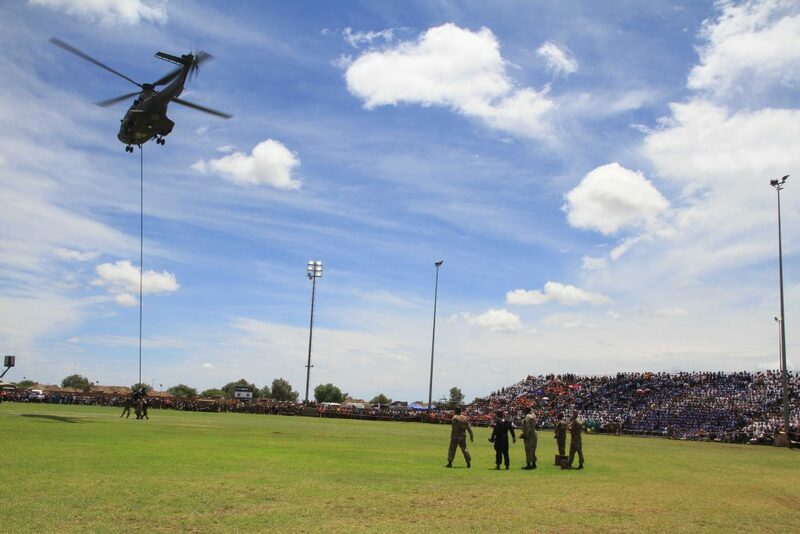 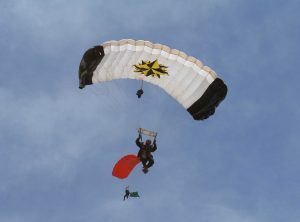 The arena program was opened by a Para drop from a Oryx helicopter with various special forces and pathfinders member’s landing in front of a massive crowd as they’re cheered their brilliant landings they’re were executing. 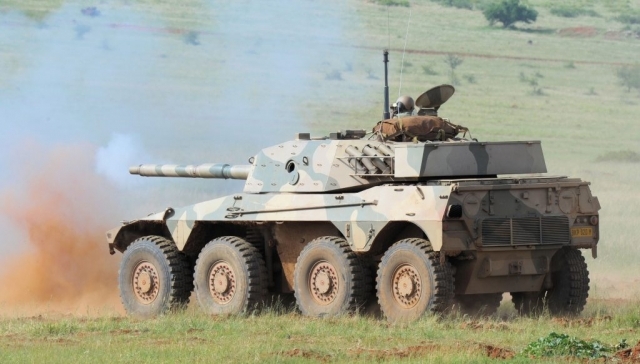 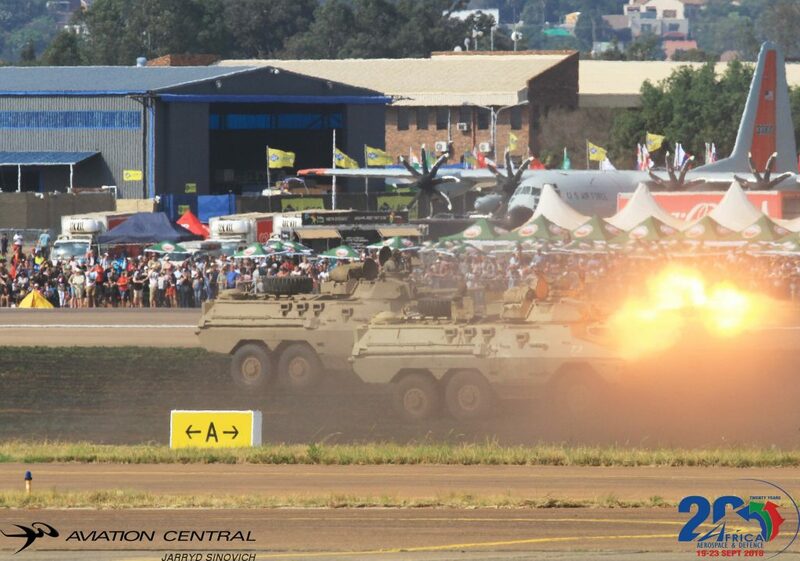 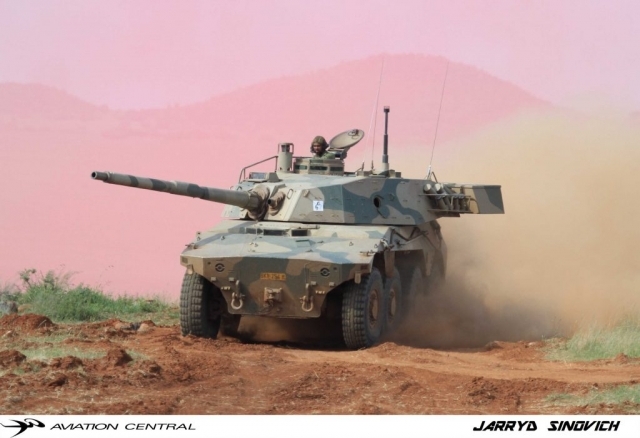 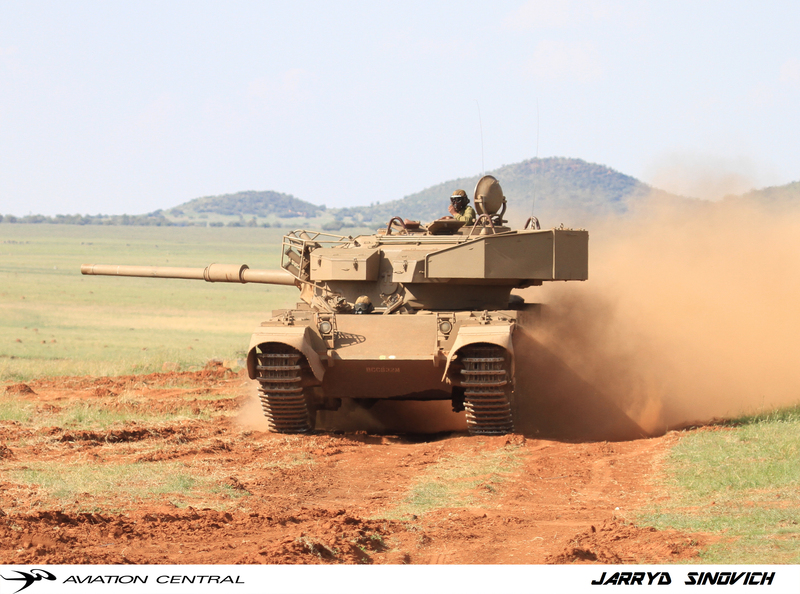 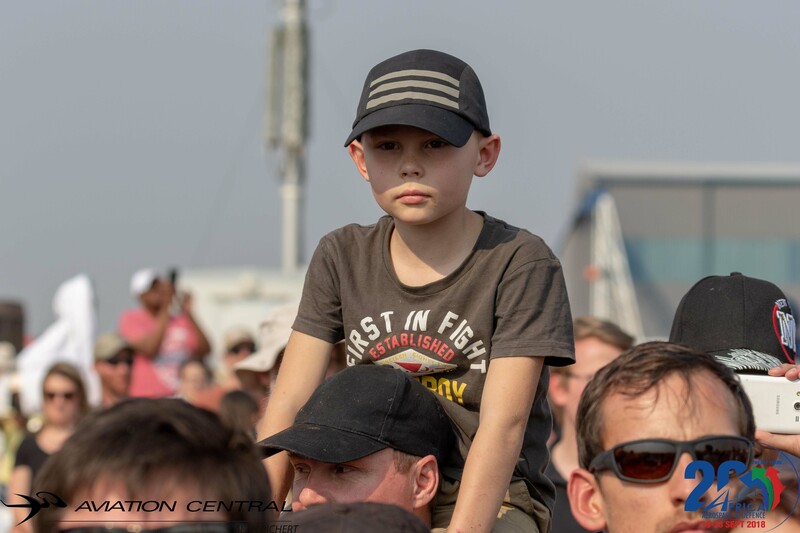 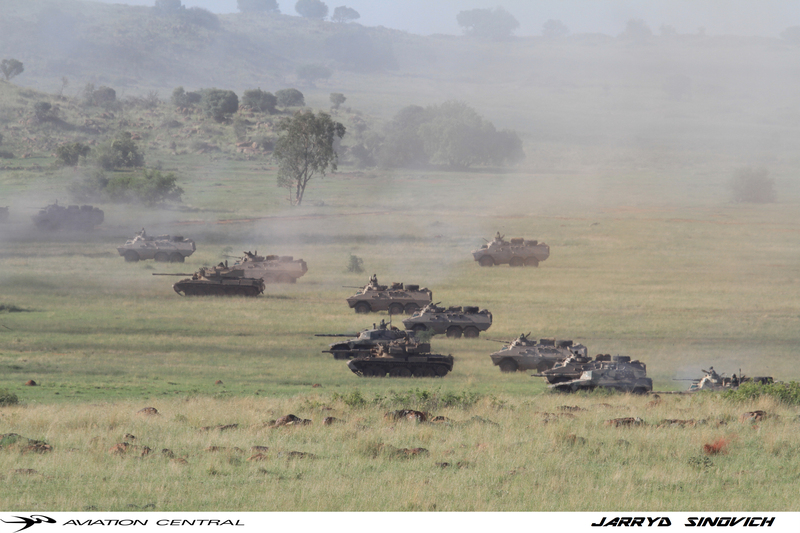 The public were treated to more procession drills from both the SA Army and SA Navy, and the famous gun run which is often seen at the Rand Show in Johannesburg from previous years. 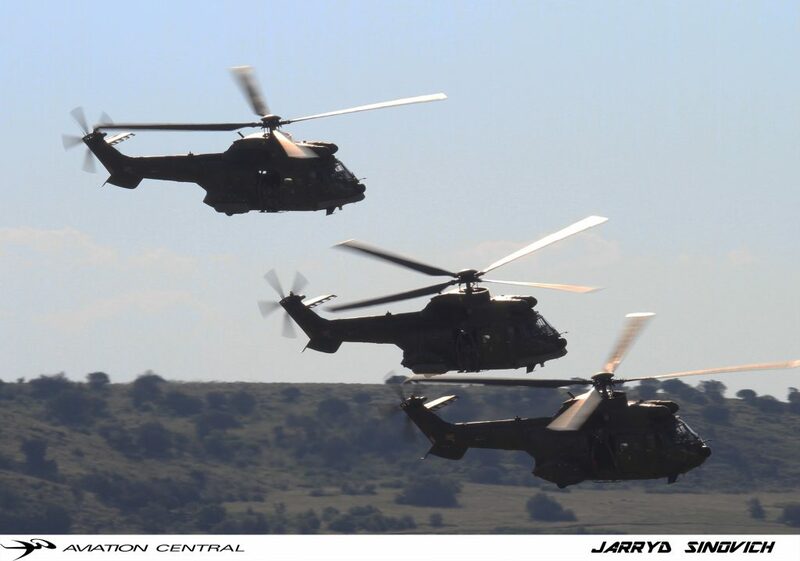 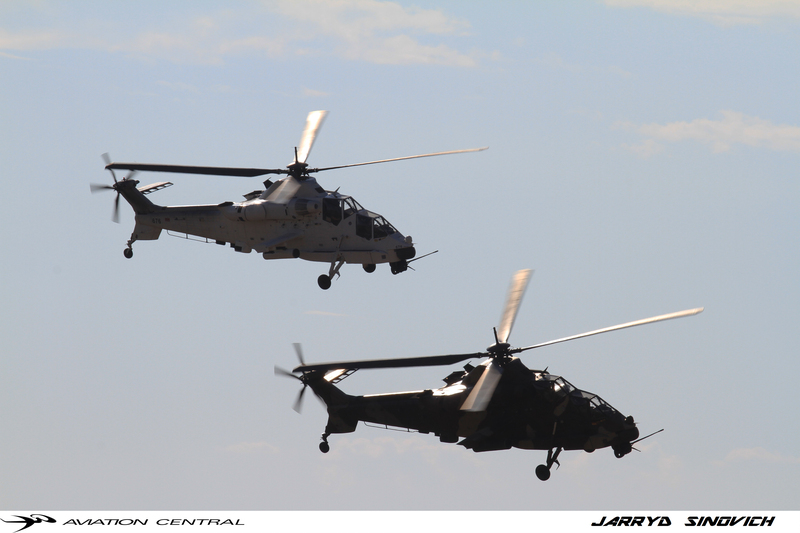 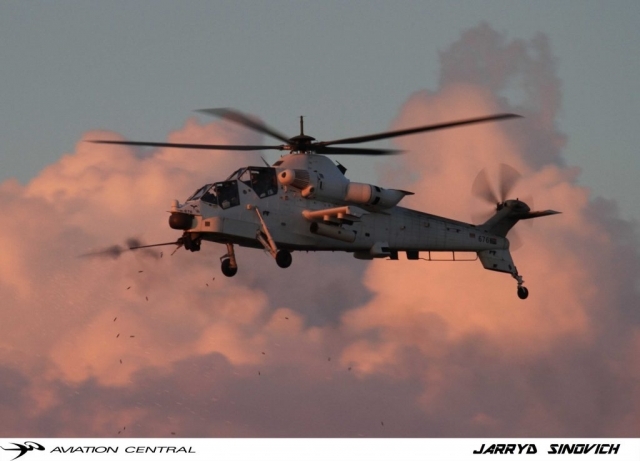 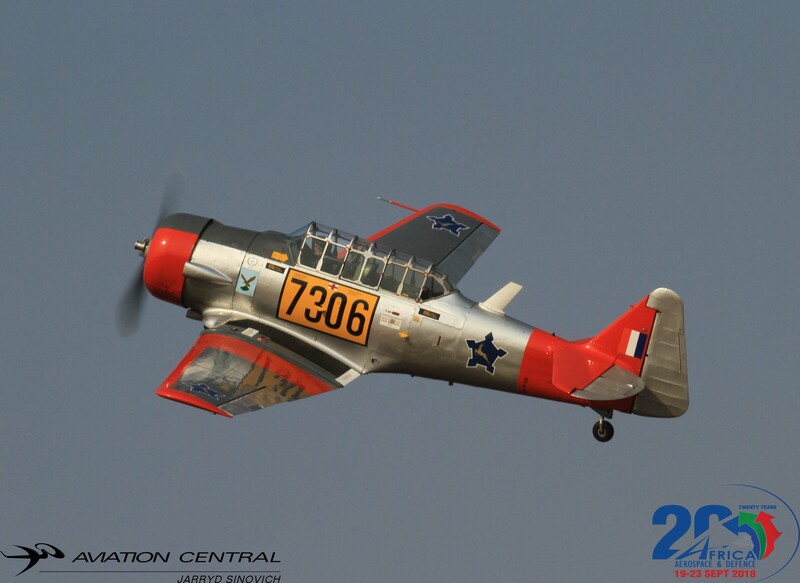 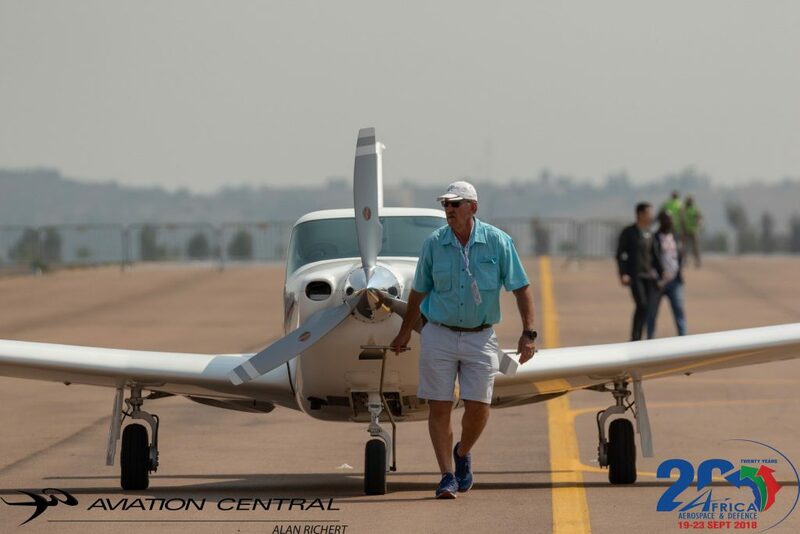 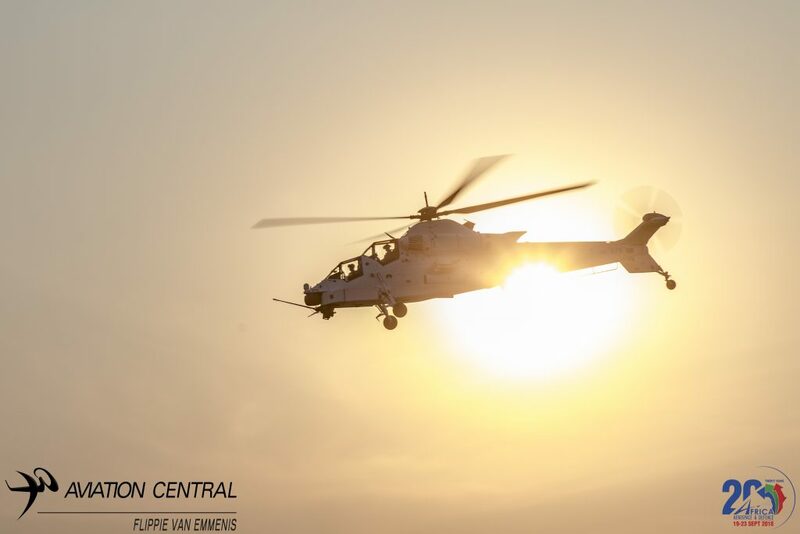 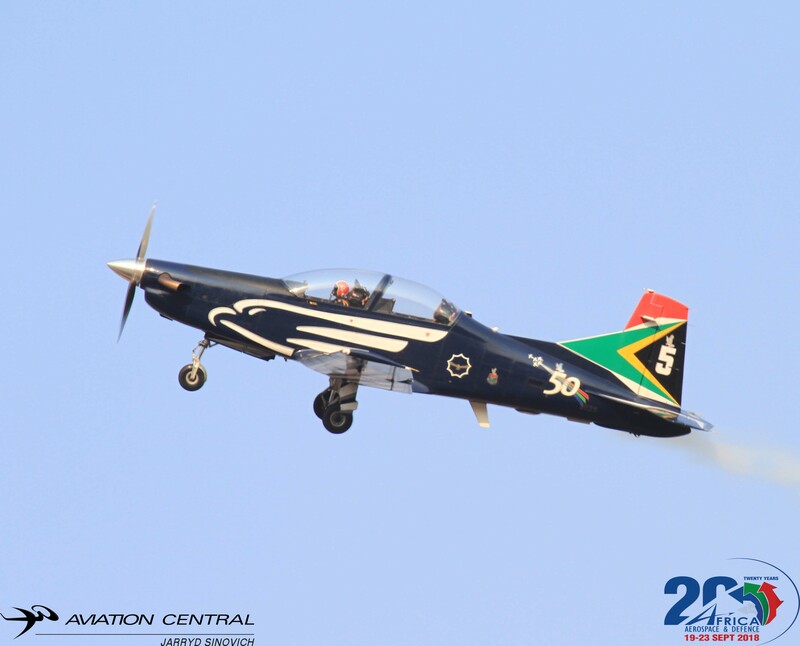 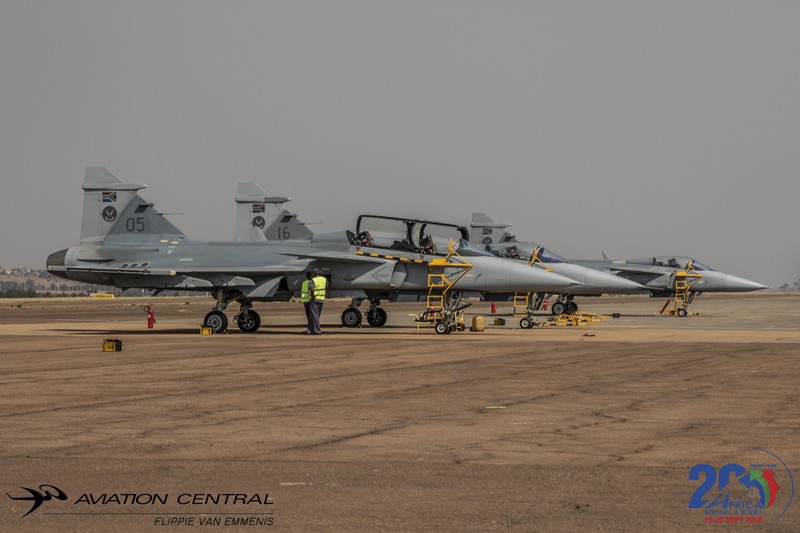 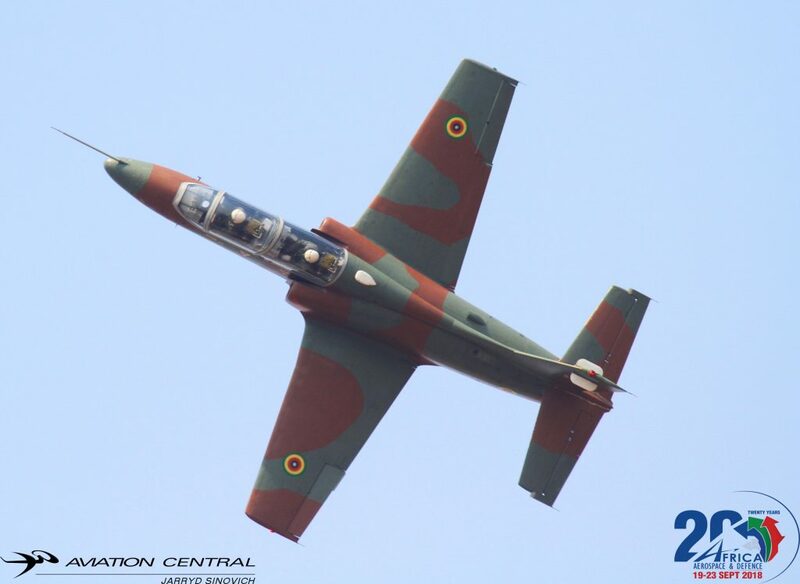 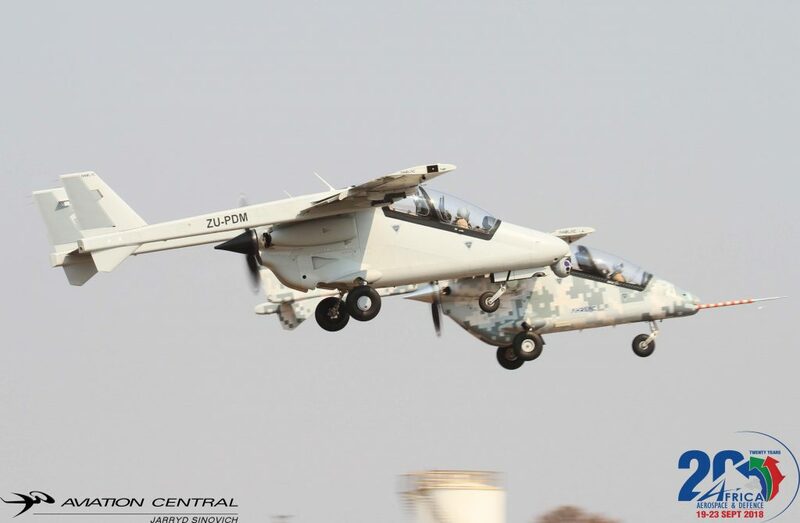 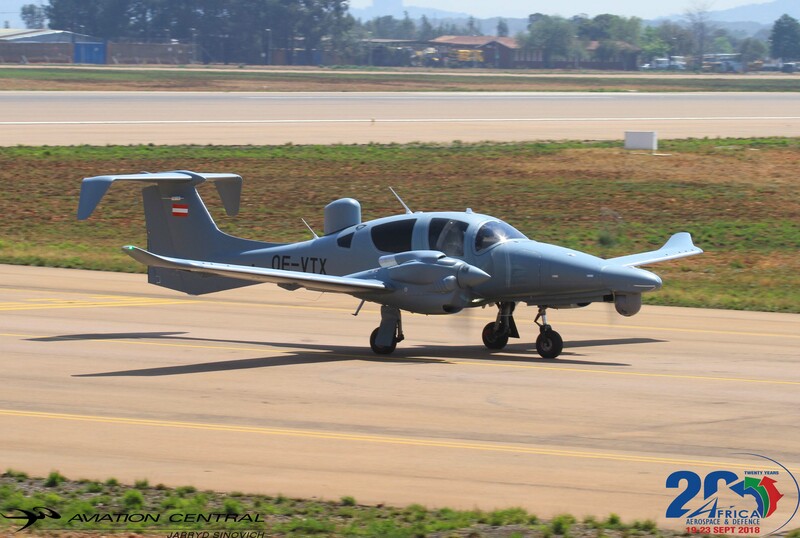 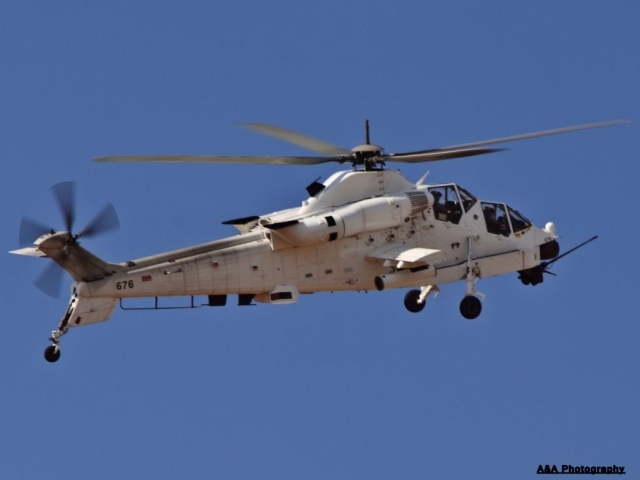 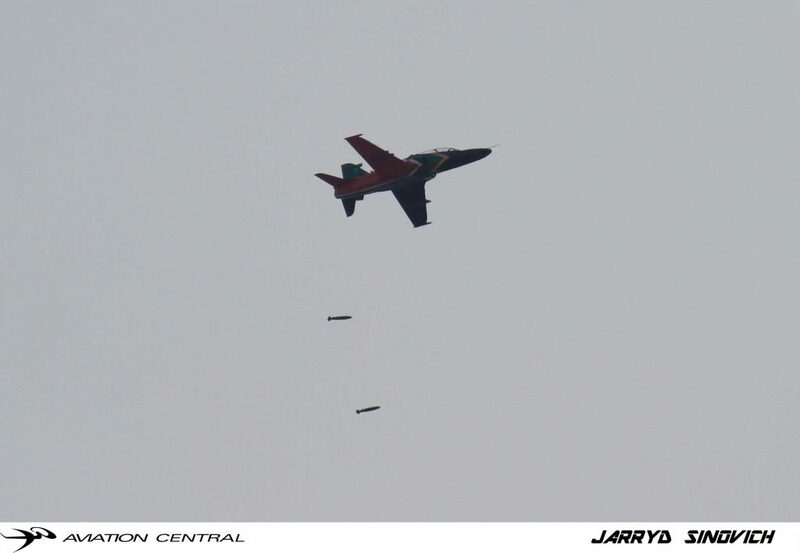 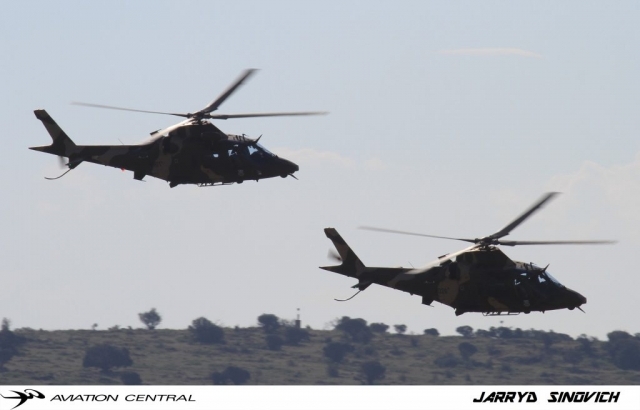 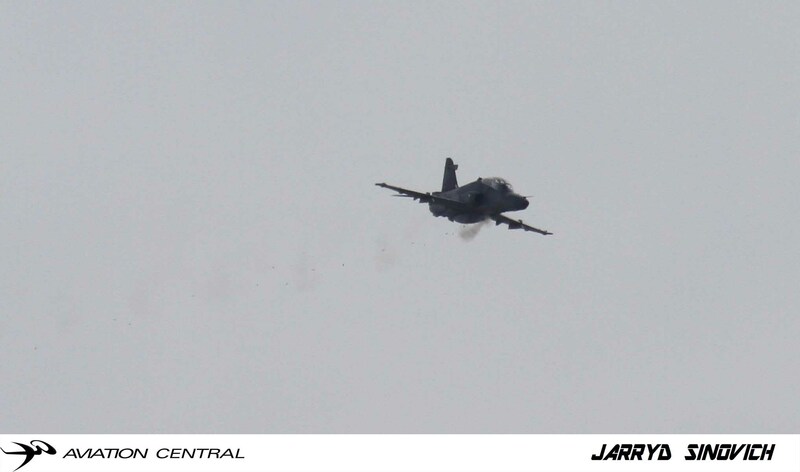 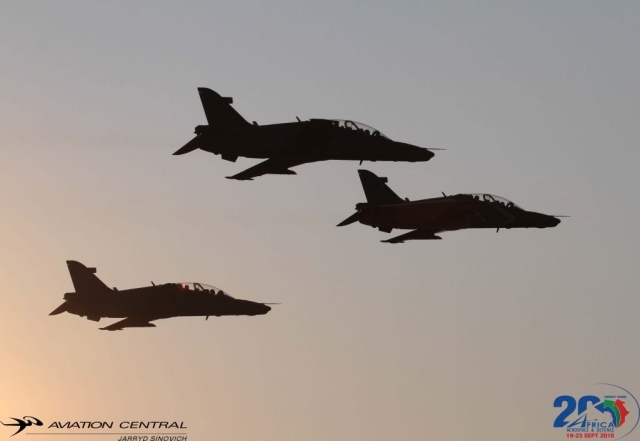 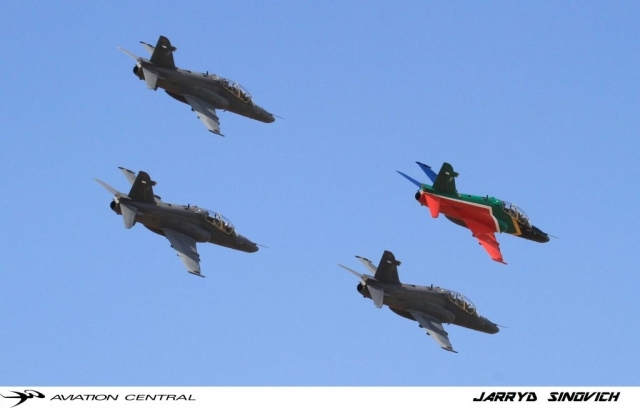 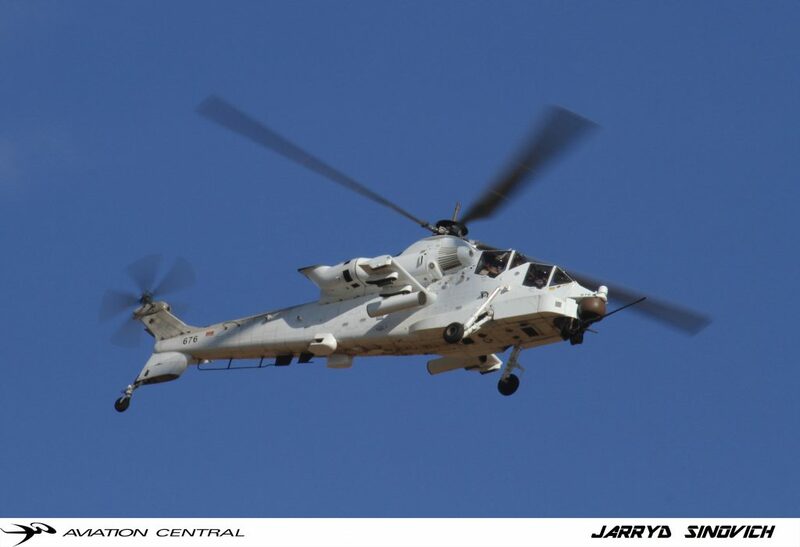 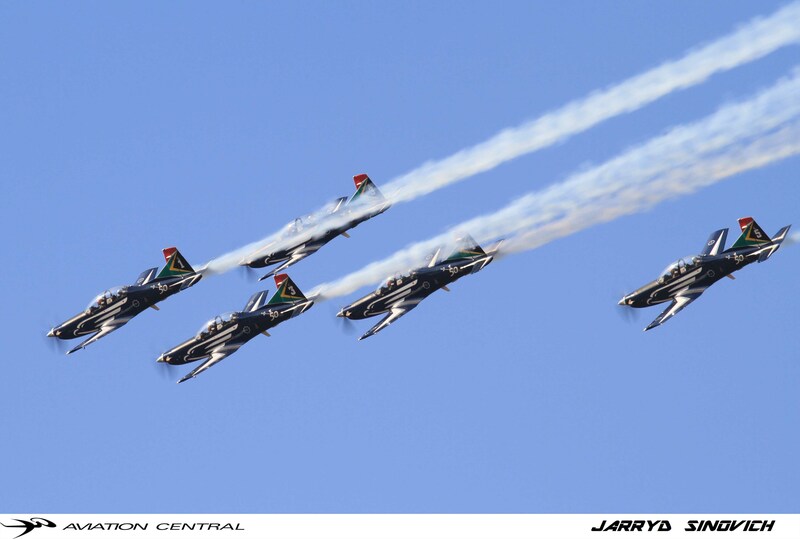 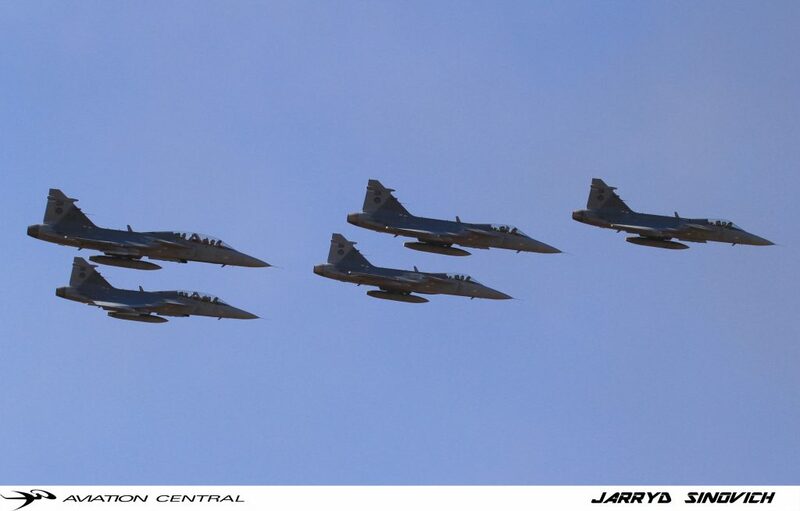 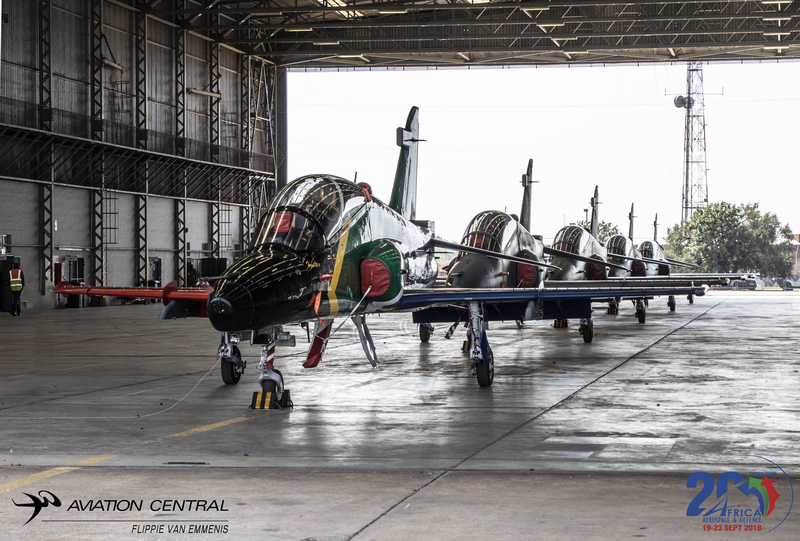 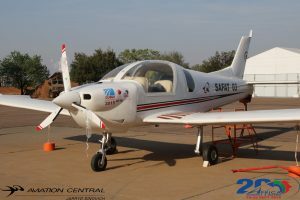 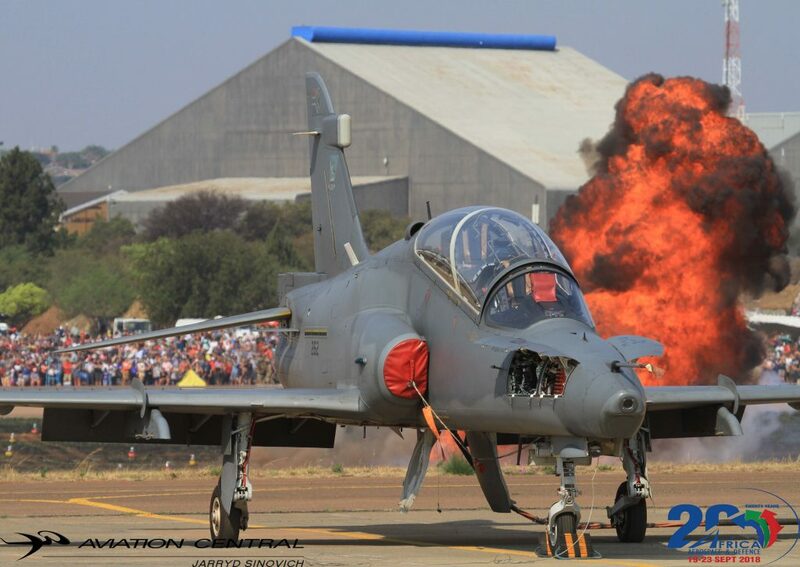 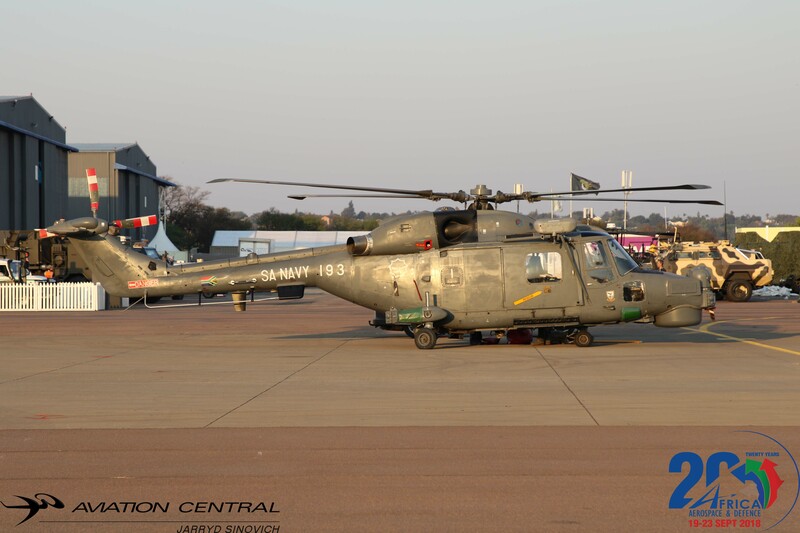 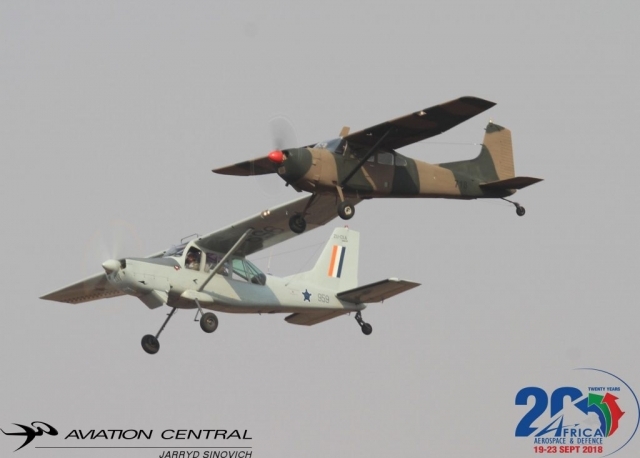 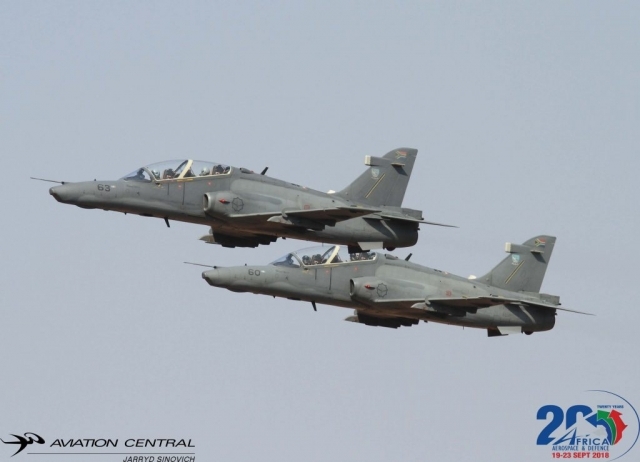 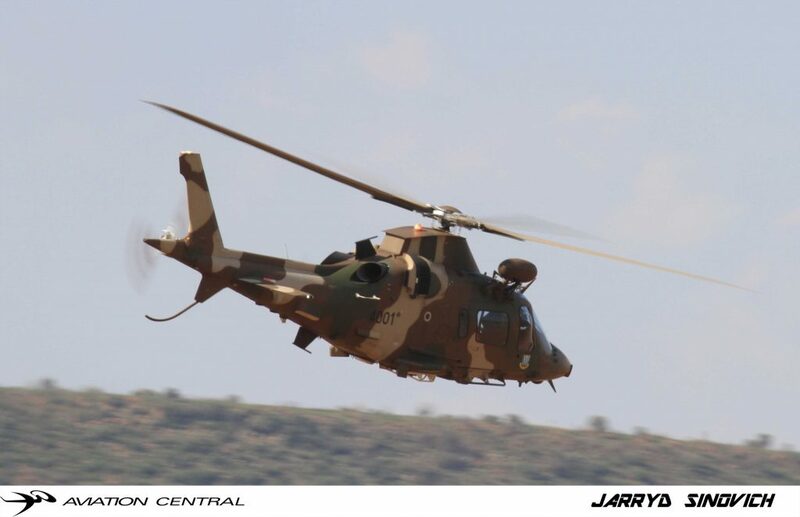 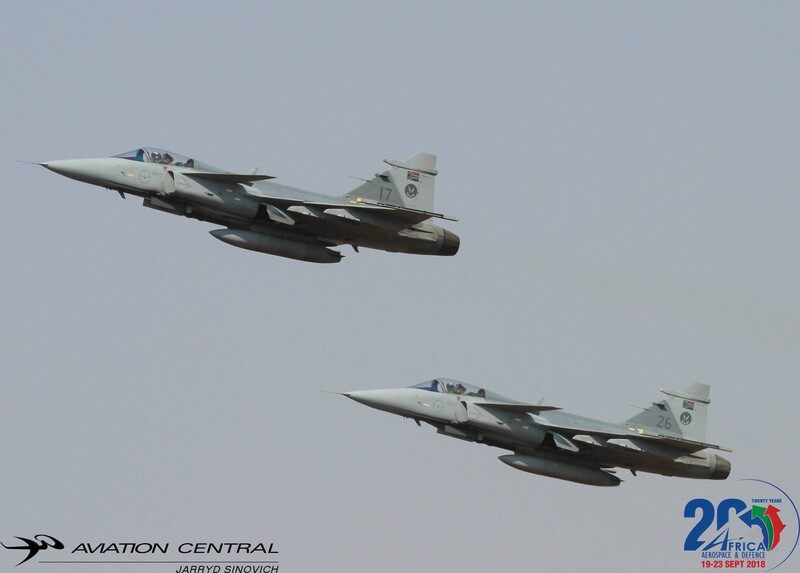 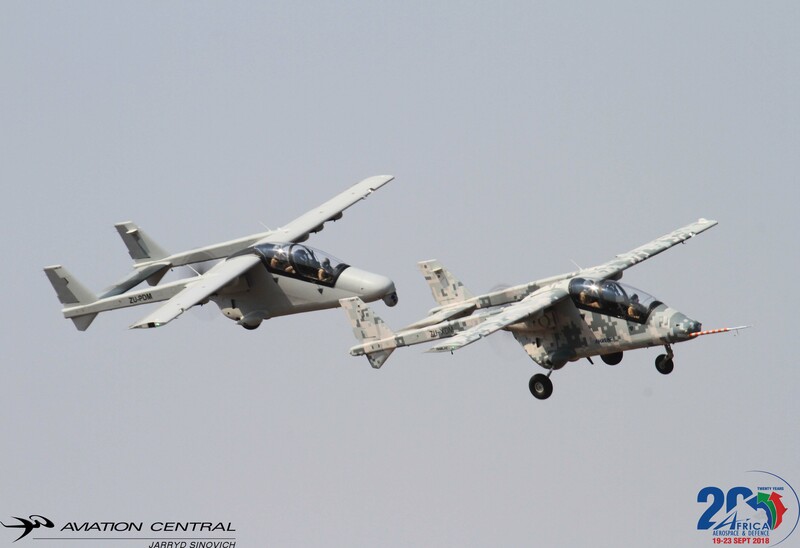 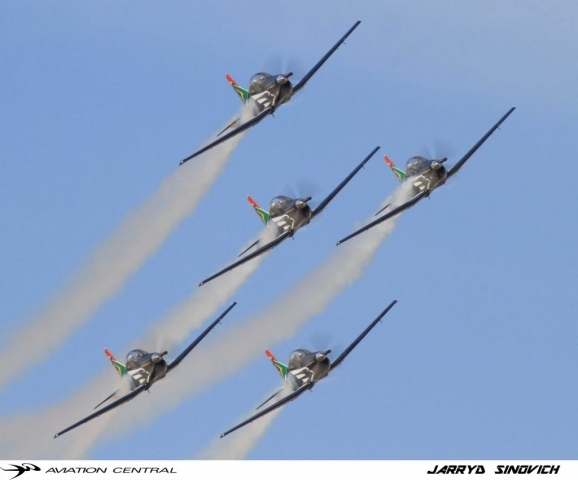 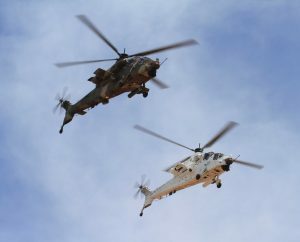 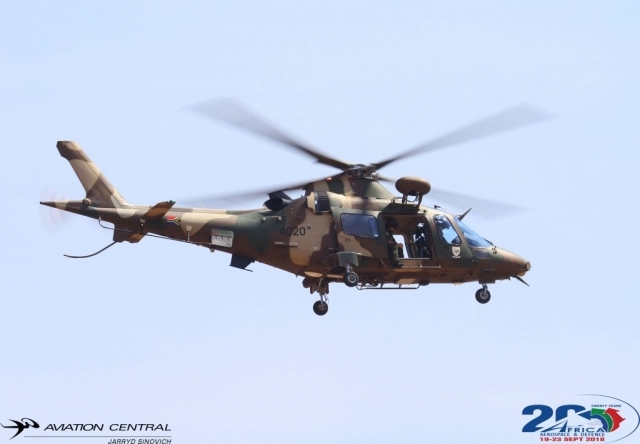 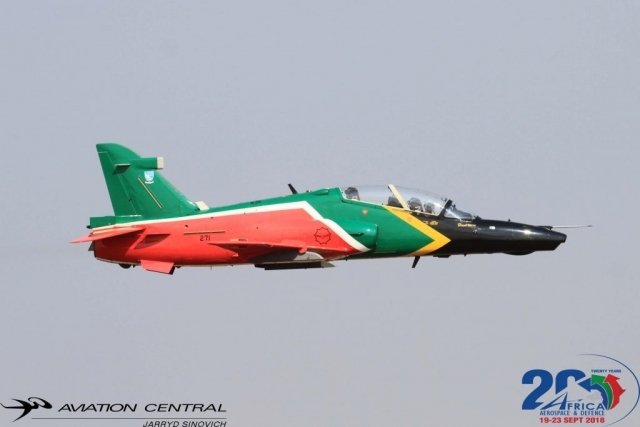 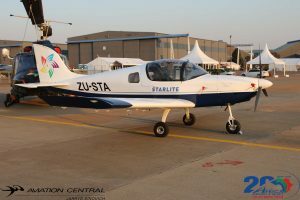 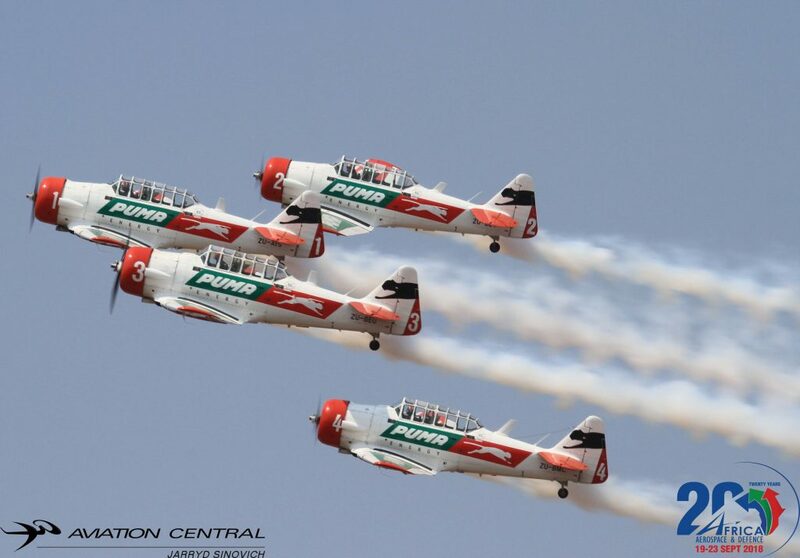 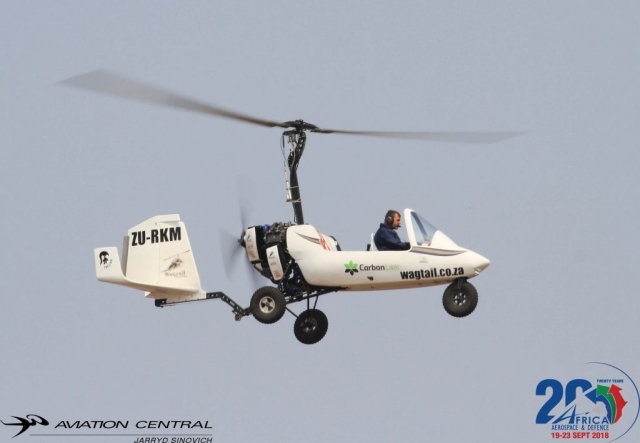 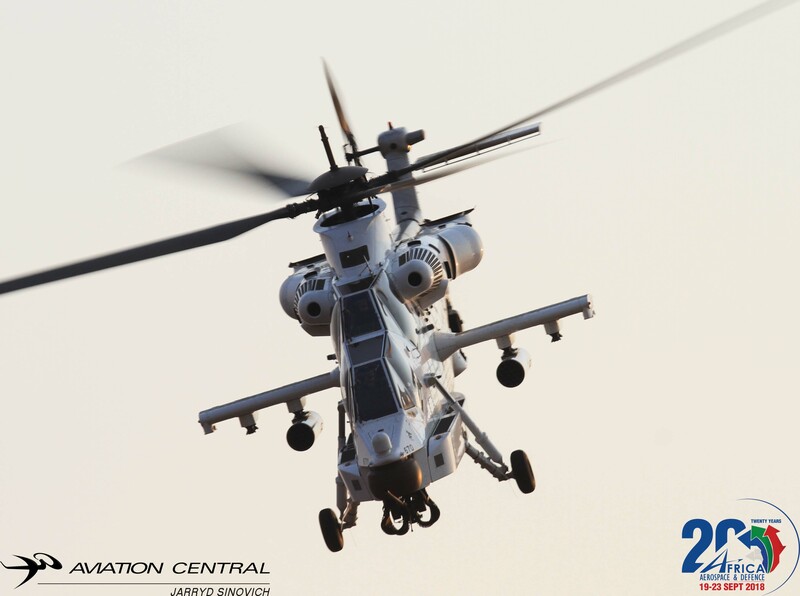 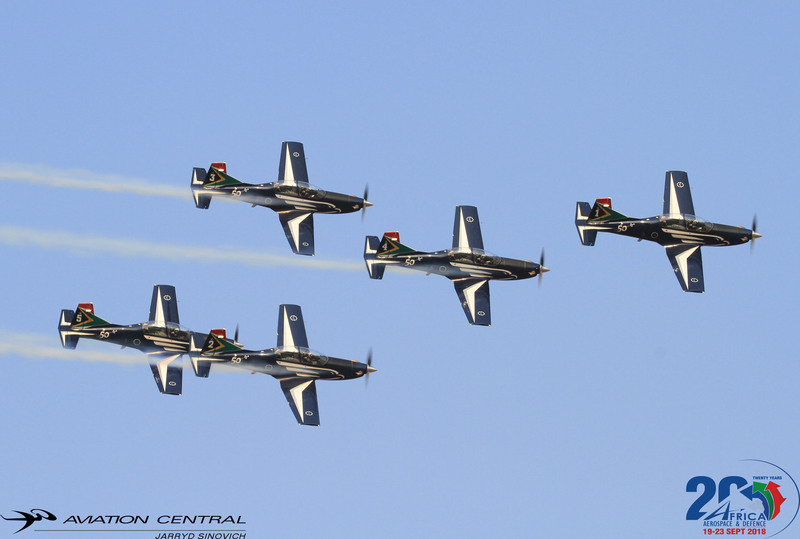 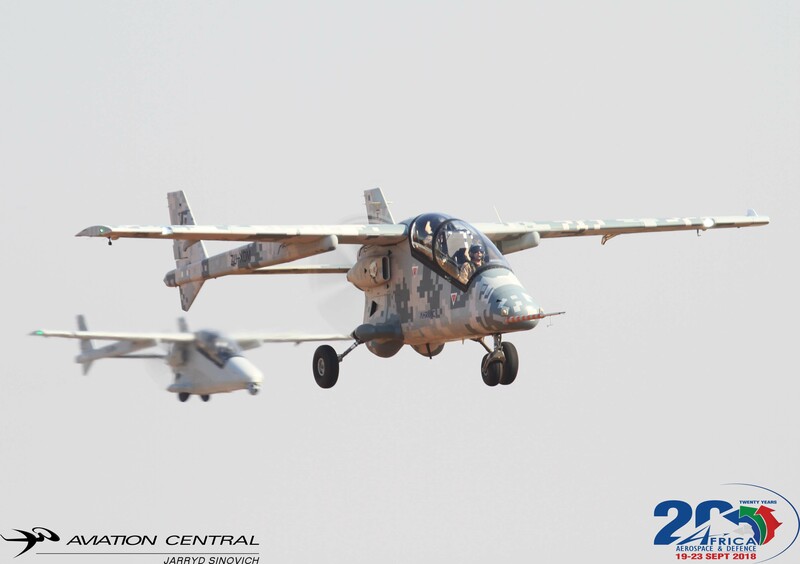 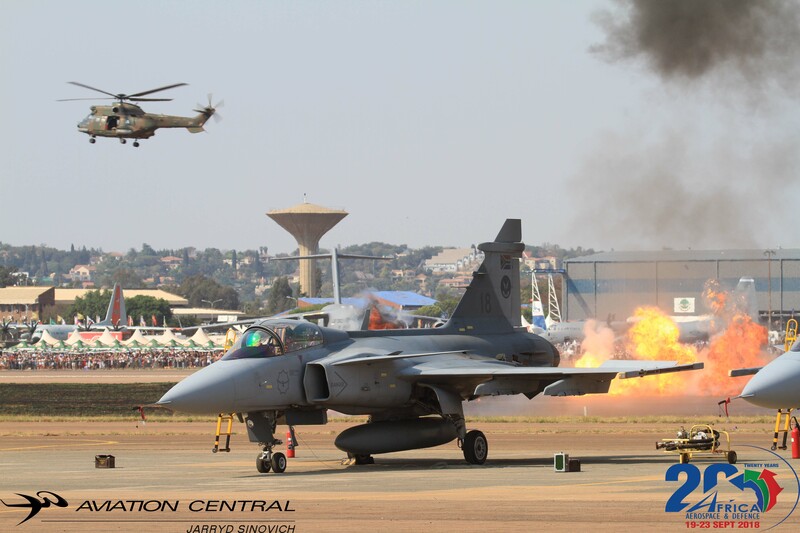 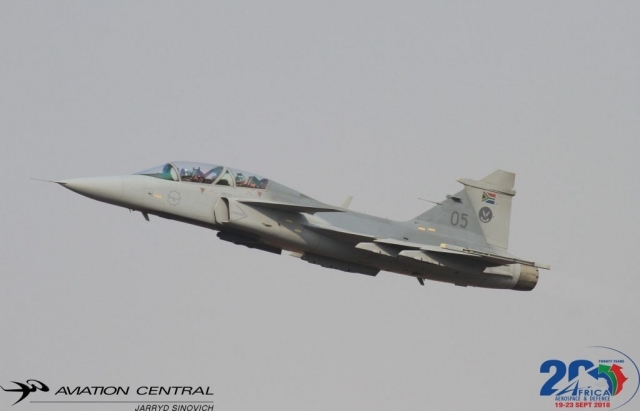 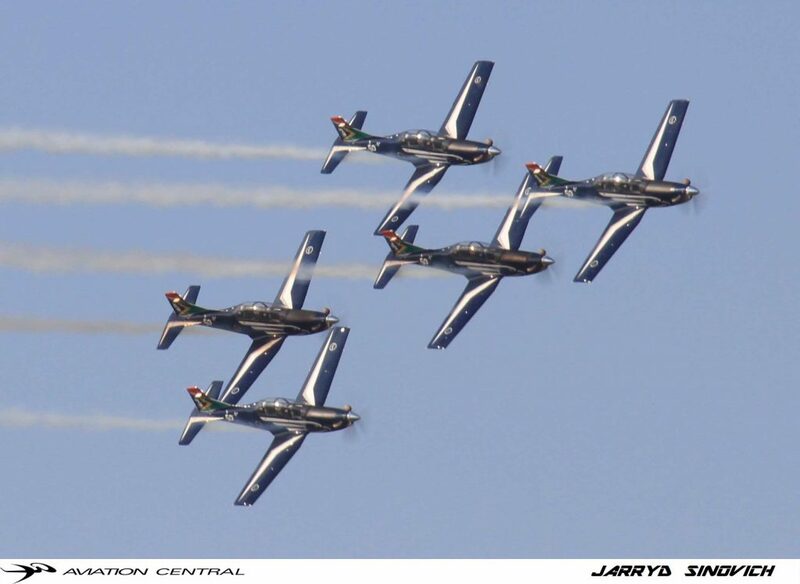 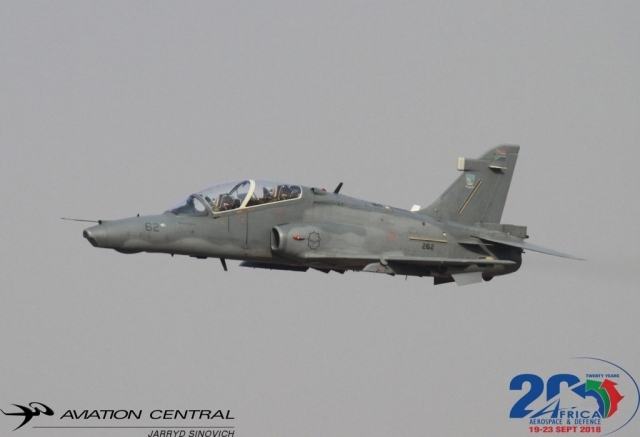 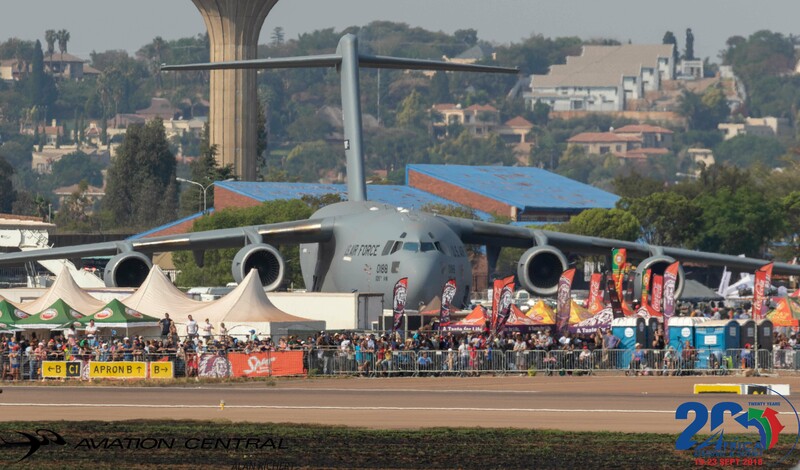 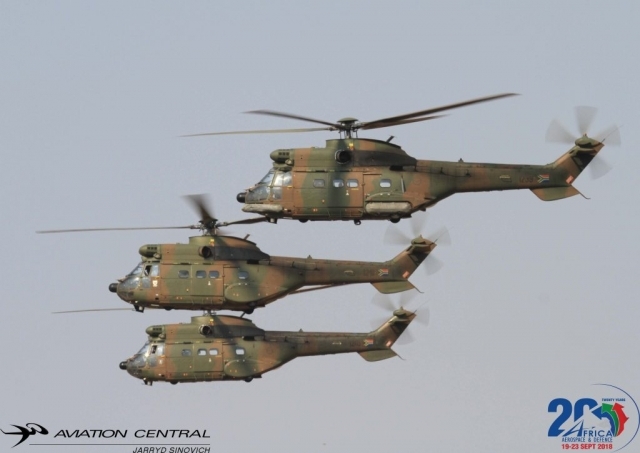 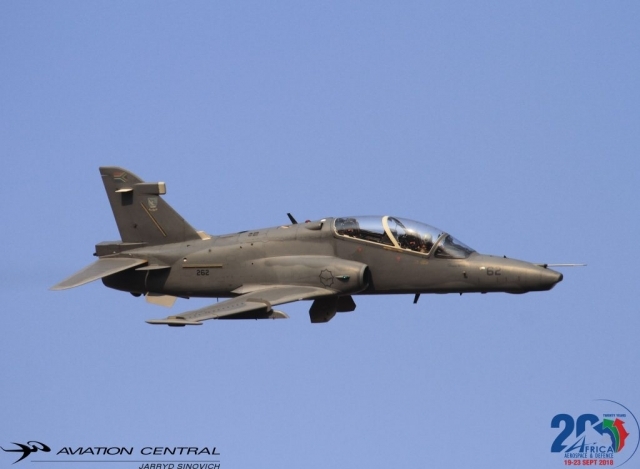 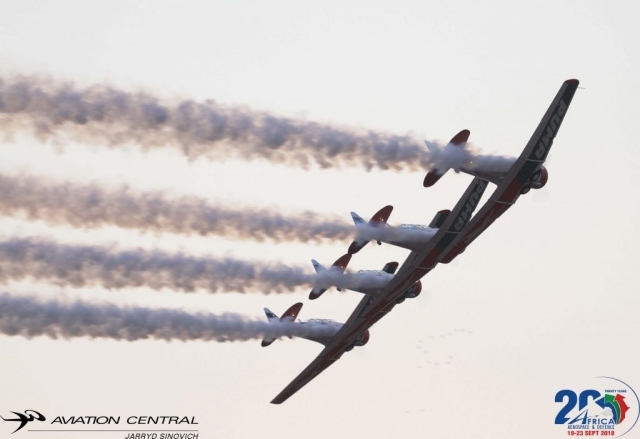 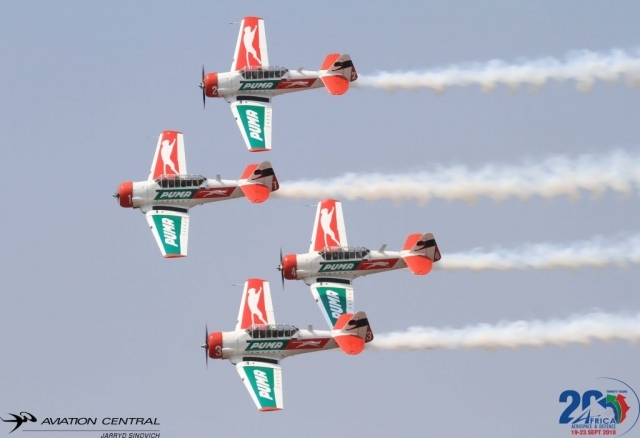 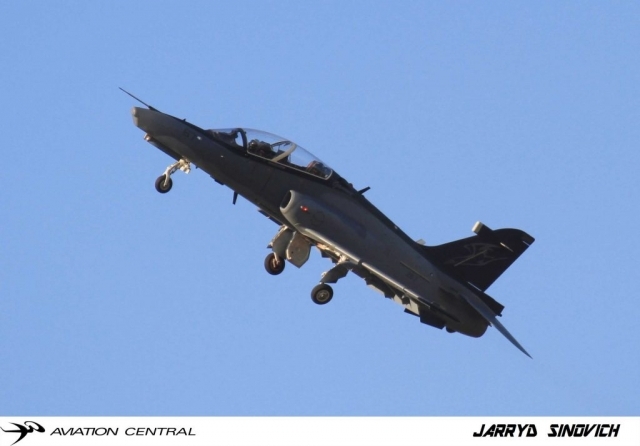 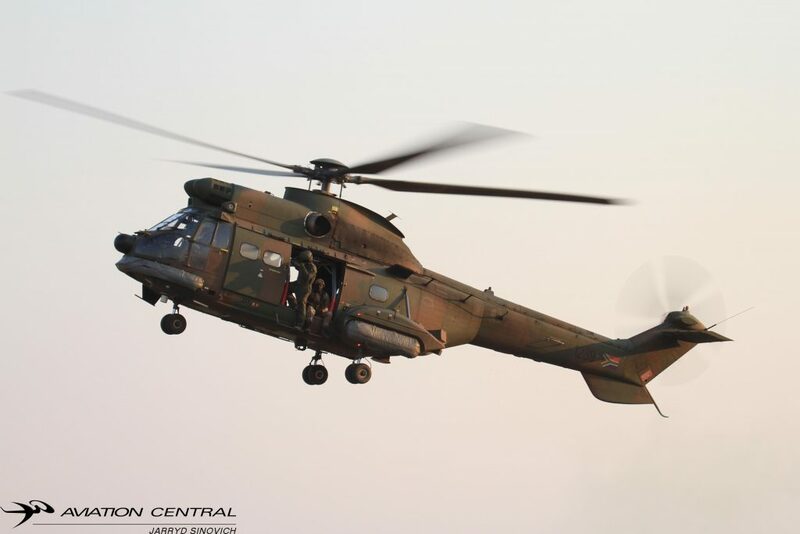 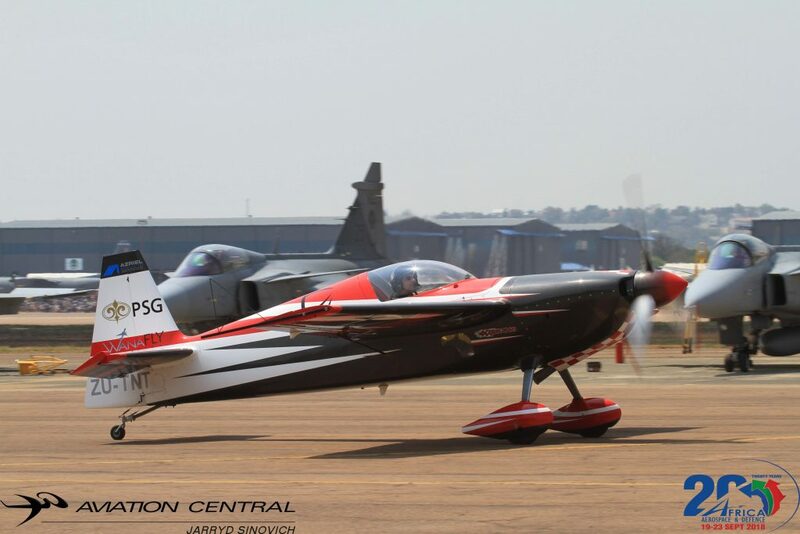 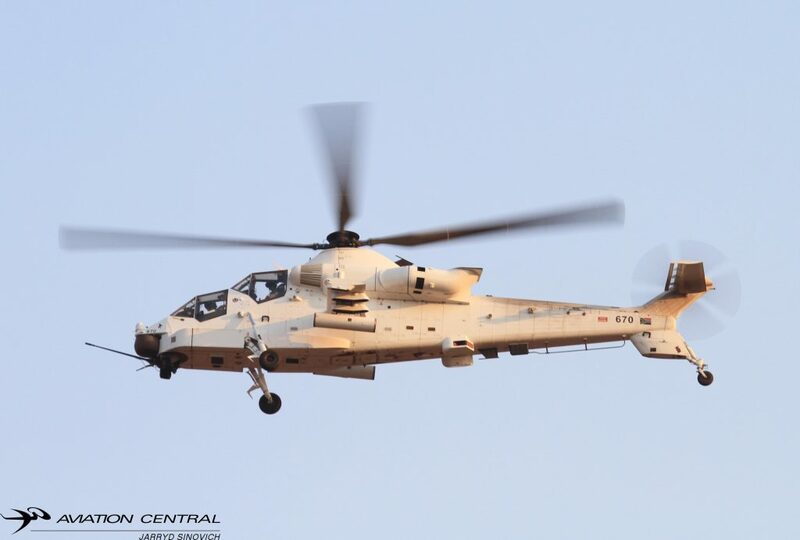 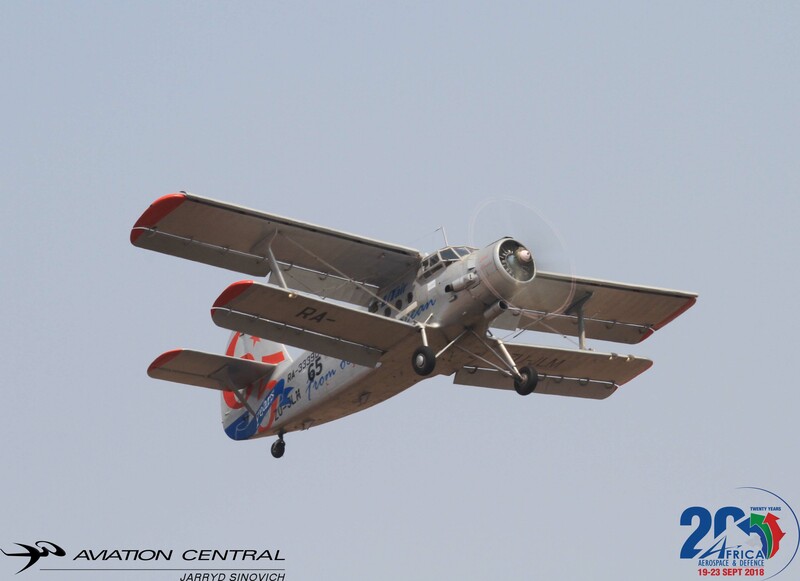 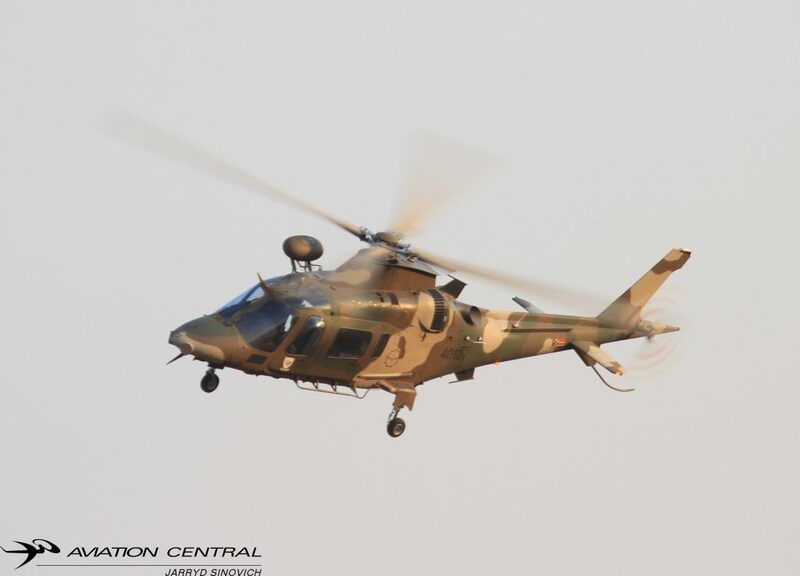 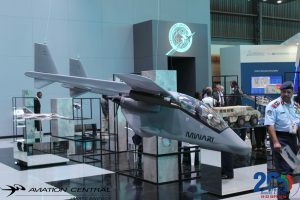 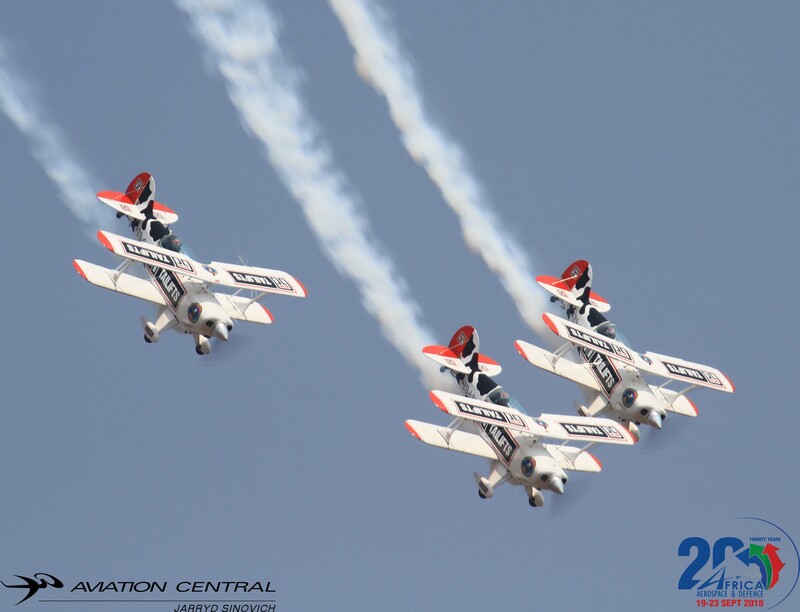 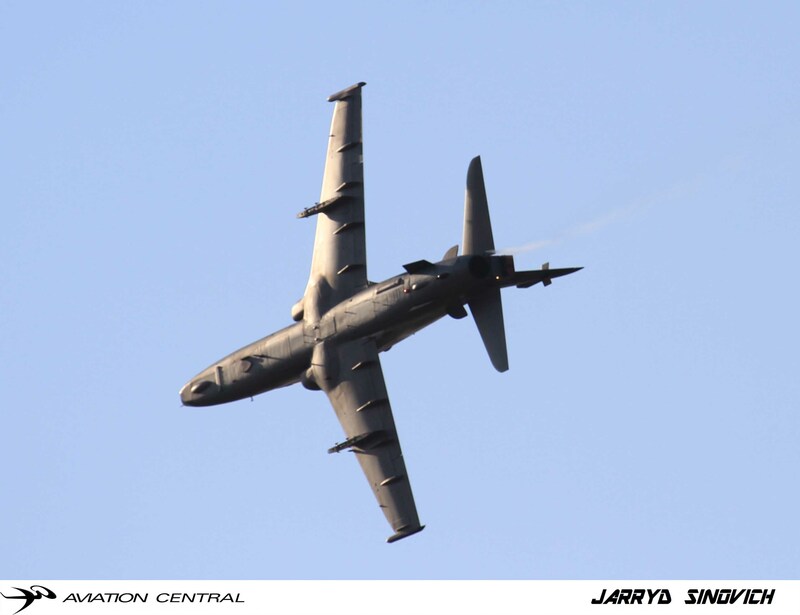 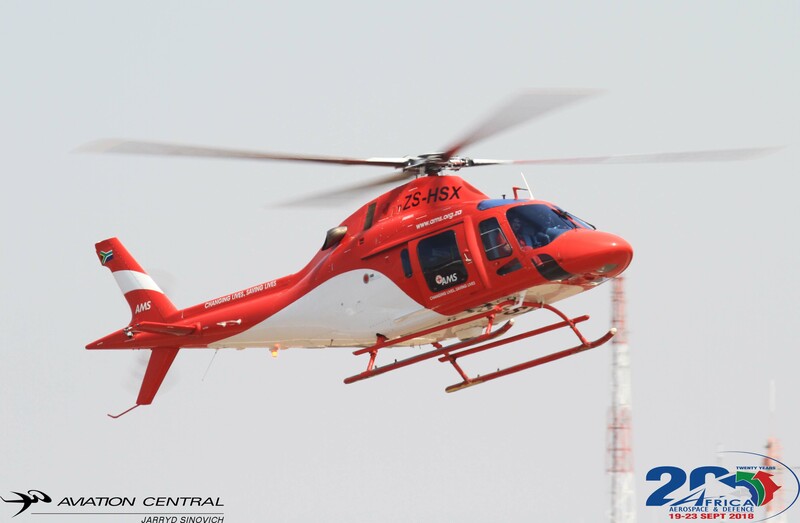 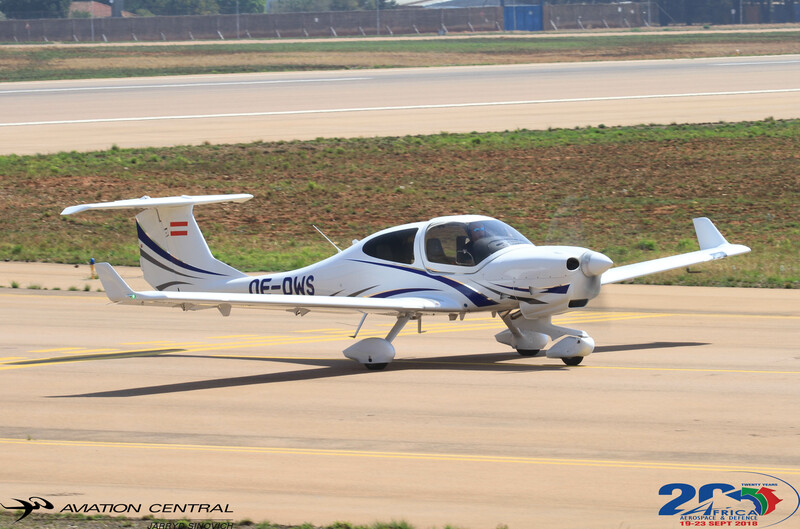 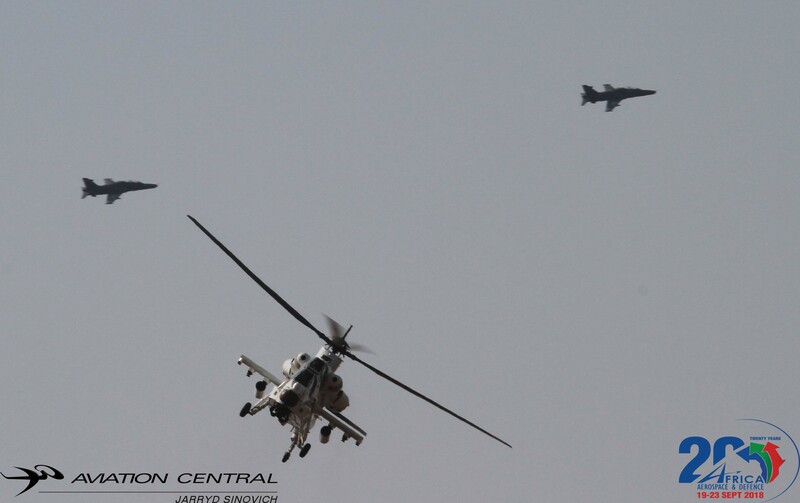 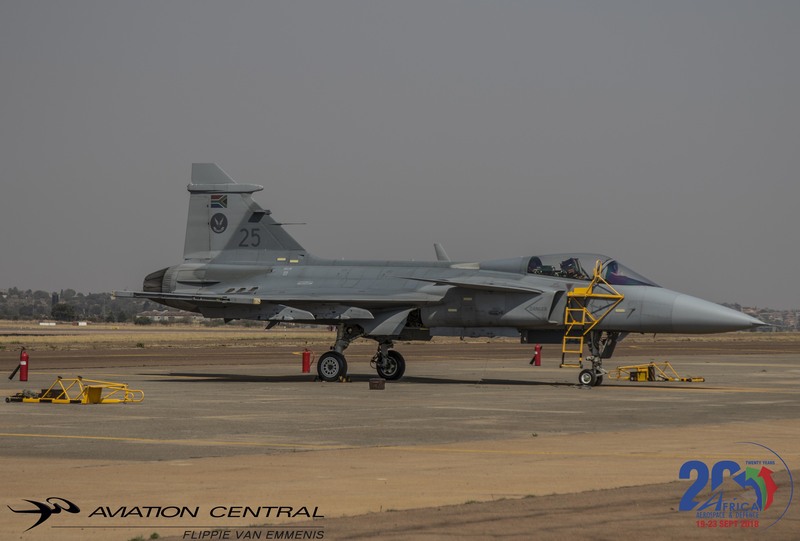 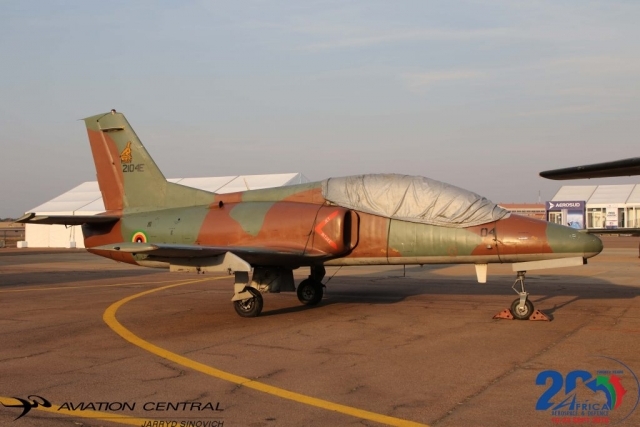 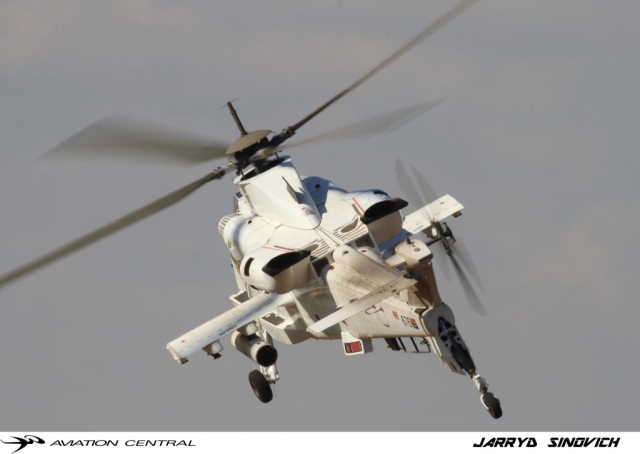 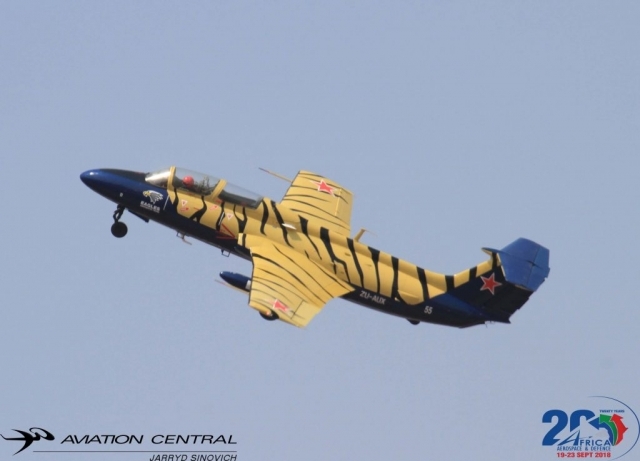 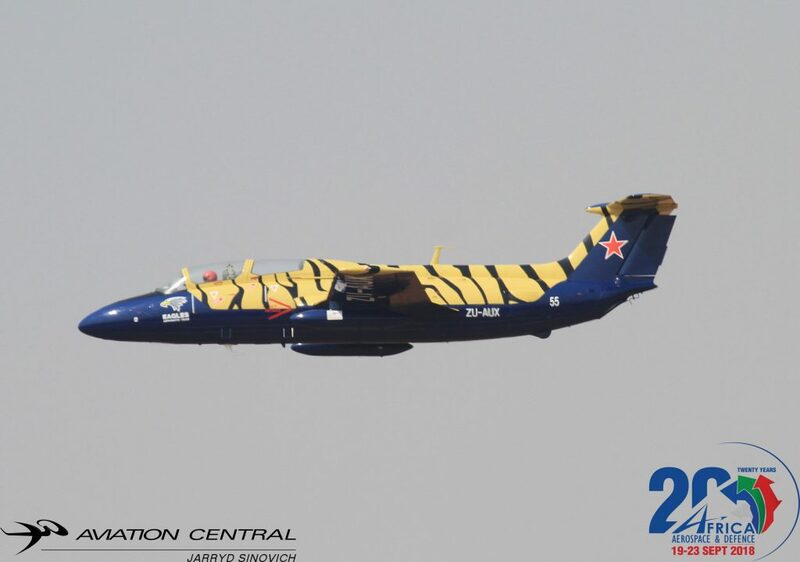 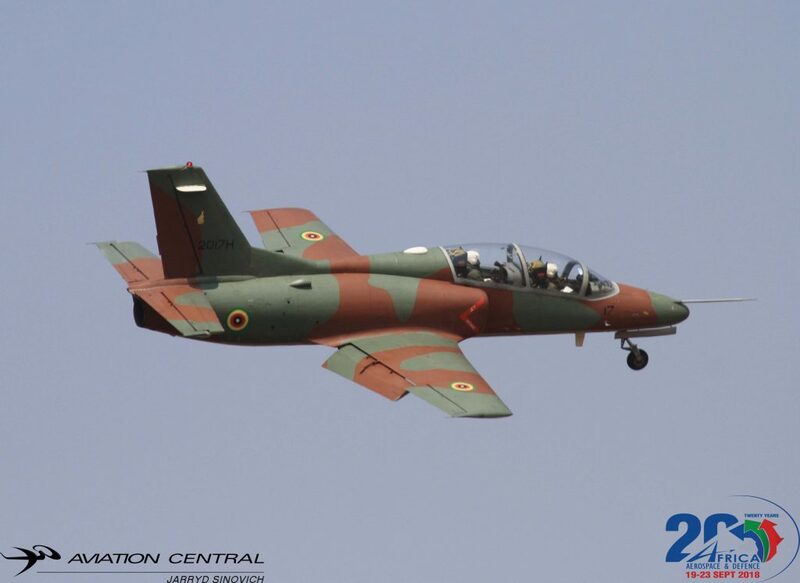 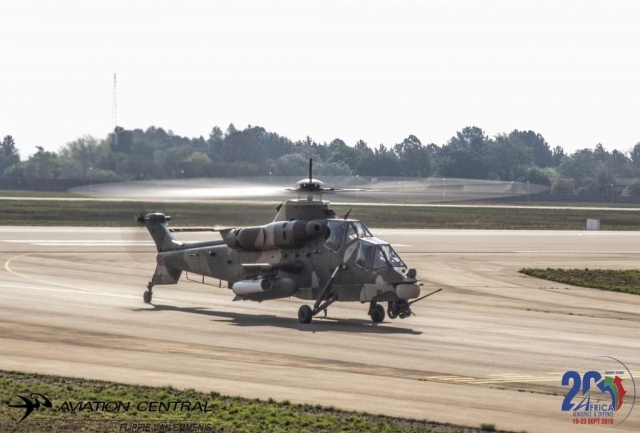 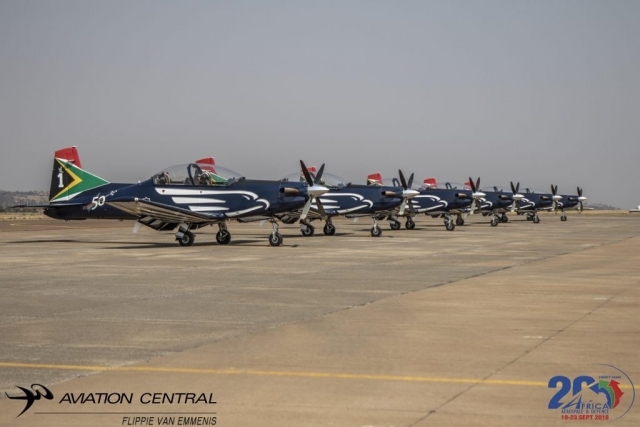 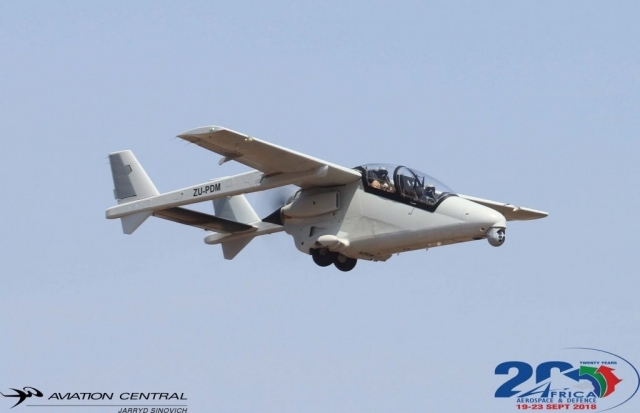 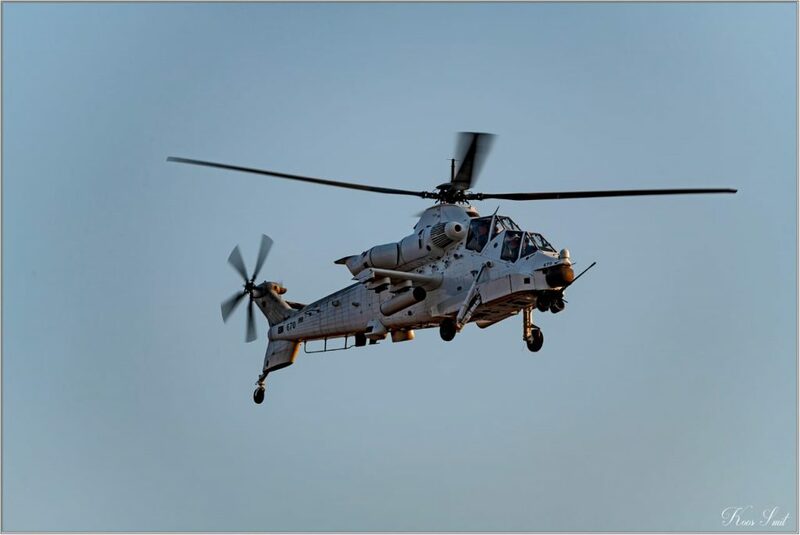 Aircraft that flew over the Stadium during the course of the program such as the Oryx helicopter mentioned above,2 Rooivalk Attack helicopters and the Silver Falcons Aerobatic team to name a few. 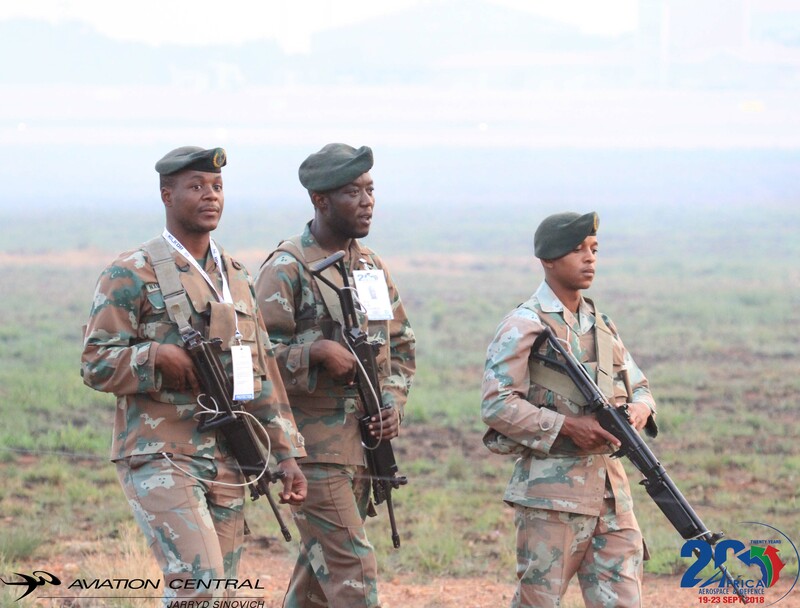 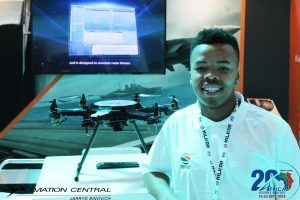 The SANDF also has to offer at the fan park the career center for those that are interested about the work life and serving their country in many different aspects they’re have to offer. 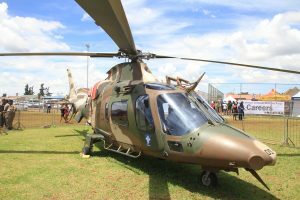 Its also a opportunity for the public to interact with Military personal and their assets they have on display. 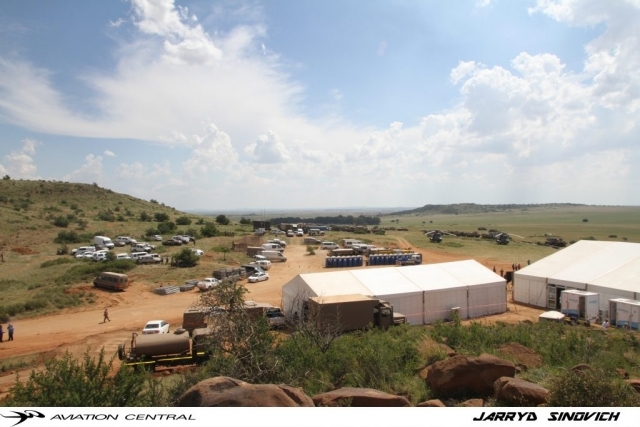 19 to 20 February 2018 the roads will be closed from 09:00 for the rehearsals. Memorial Road at the Monument. 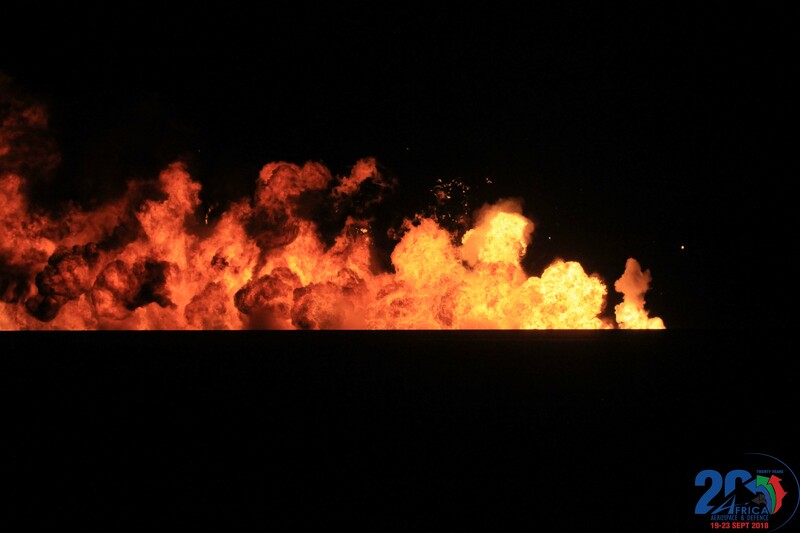 Carrington Road at Dalham Road. 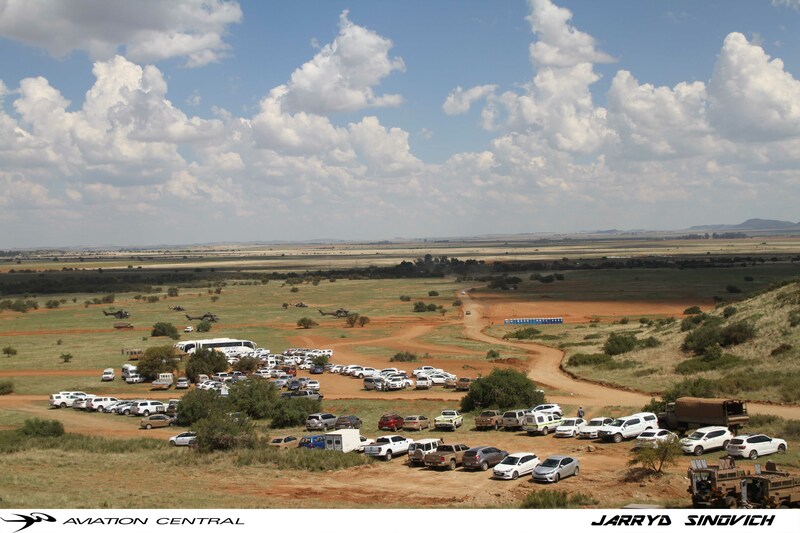 Du Toitspan/Main Road between Hercules, Lennox and Regiment Way. All roads connecting to Du Toitspan and Main Road. Access to the hospitals in the area of the parade to be advised by the Department of Health. 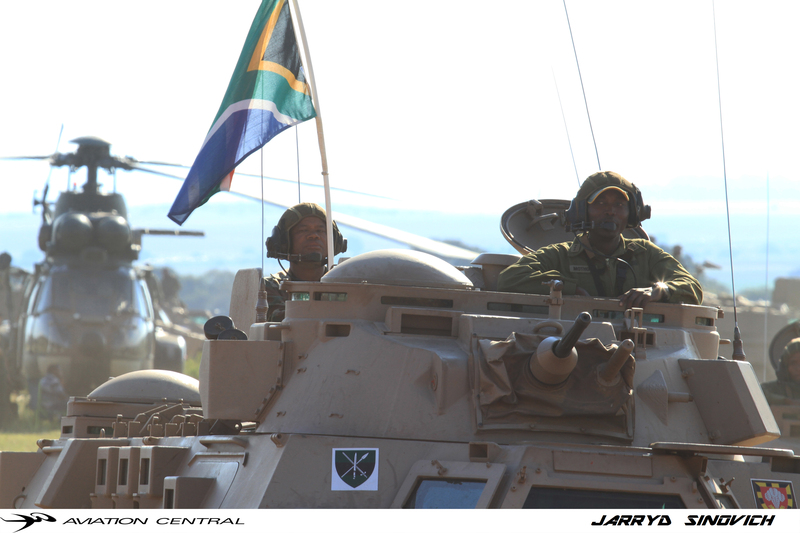 Military Police personnel will assist with all road closures. 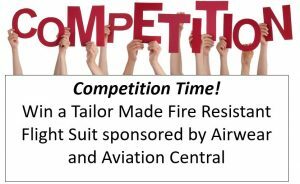 Dalham Road, Hercules Street, Fabricia Road, Pniel Road as mentioned above, Carrington Road between Dalham and Elsmere Road. 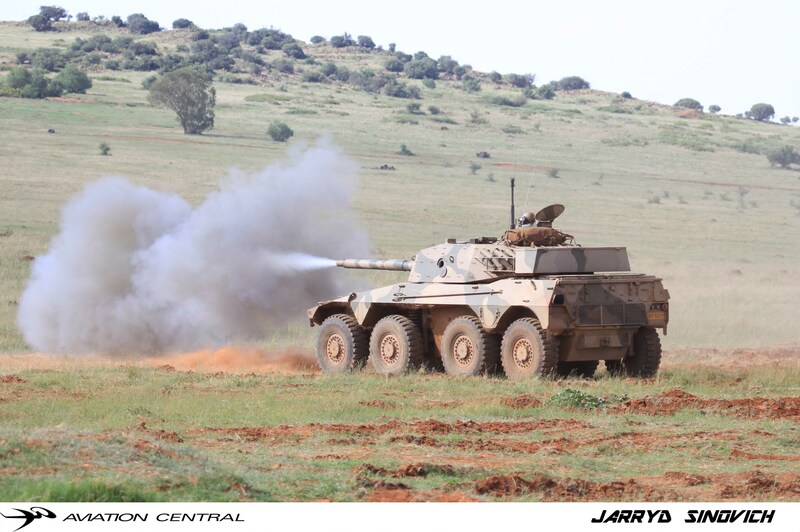 We will bring more reports from next week Tuesday when we attend the Weapons demo in Bloemfontein at De Brug firing range.